This entry was posted in News on December 15, 2018 by Janet Bonkowski. 92% are Wisconsin residents and 159 students (37%) are Brown County residents. Much of the class (279) or 63% comes from UW-Green Bay’s new 16-county, four-campus region. 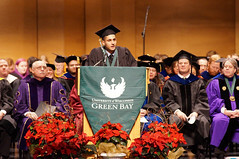 Are you ready for some Packers history? 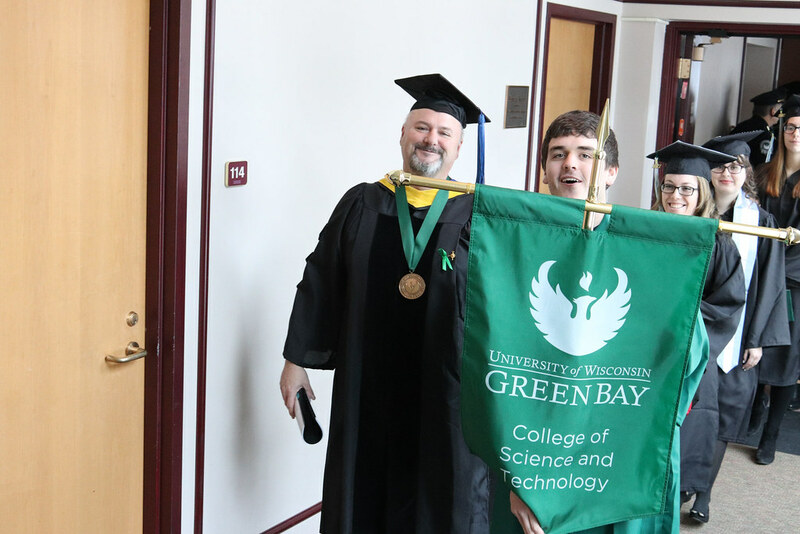 If you thought you knew everything there was to know about the green and gold, the work of some UW-Green Bay students may surprise you. 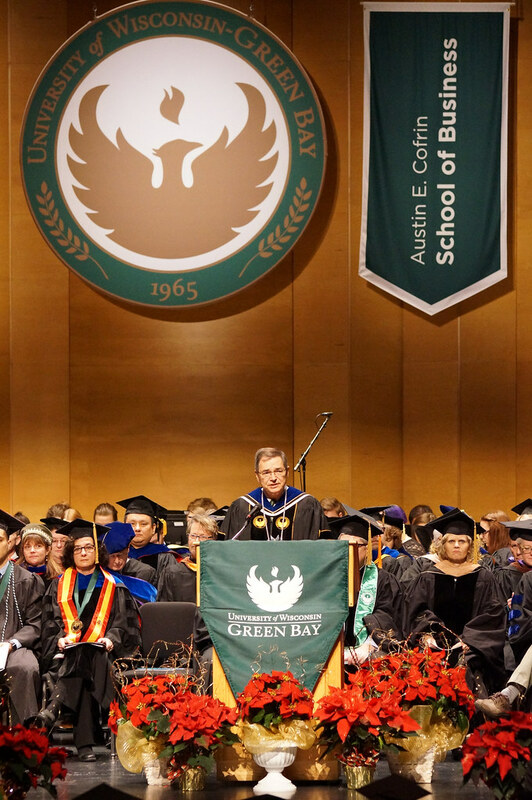 This semester, the History, Democracy and Justice Studies and Humanities at UW-Green Bay and the Green Bay Packers Hall of Fame collaborated on an exciting project to document the history of the Packers as the franchise celebrates 100 years. 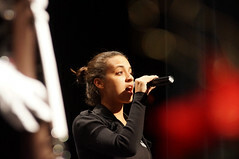 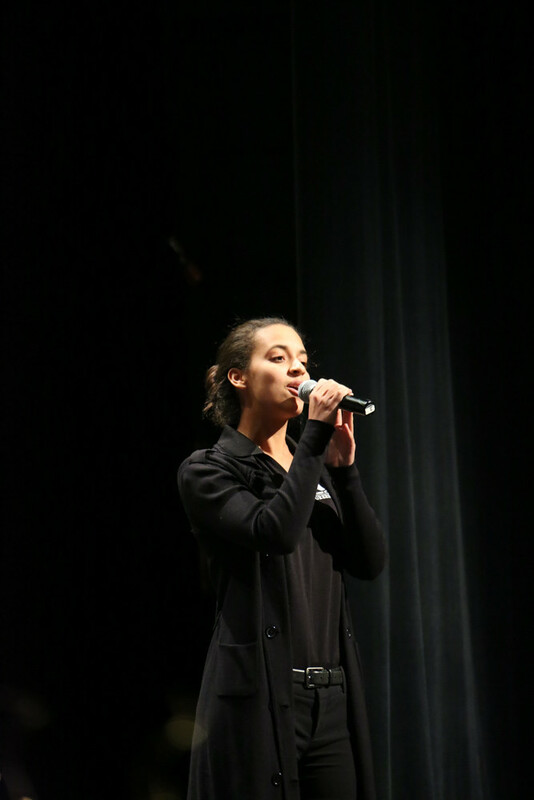 Students will share their findings during a special open-to-the-public presentation next week. 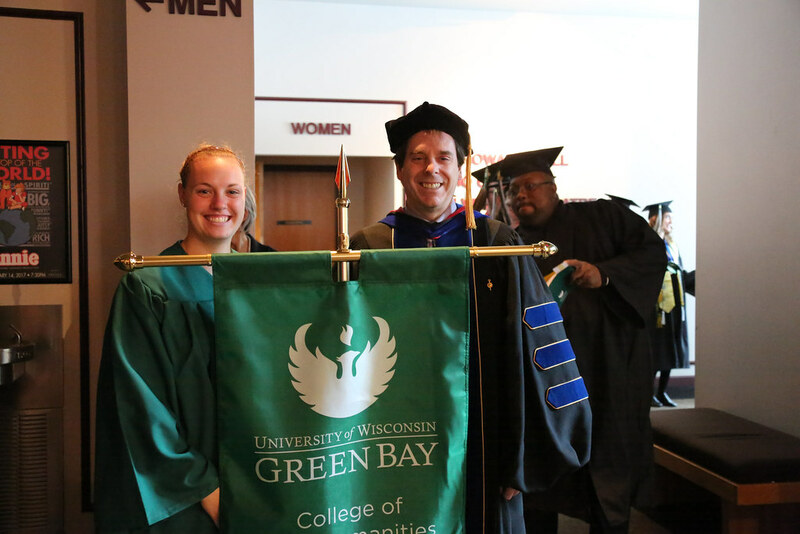 Student projects cover a wide terrain of Packers history. One created by Grant Fischer, Kilian Carlson, Jamie Stankevitz, Rich Rehberg and Fisher Stathes, for example, explains how the Packers revolutionized professional football by deepening the use of the forward pass. 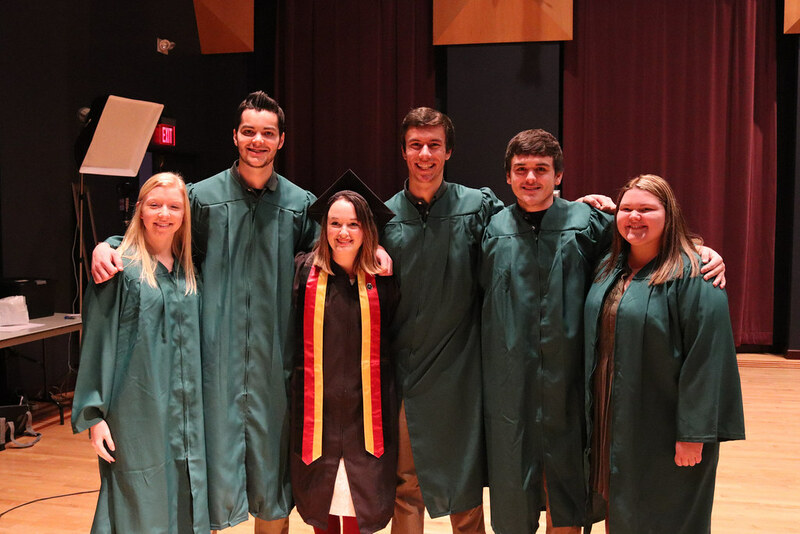 Another, developed by Madeline Cichoki, Gwen Drumheller, Joseph Karrmann, Rachel Scray and Emily Bork draw on the Lyle Lahey cartoon collection to show how the Packers were integral in how Green Bay citizens understood national politics. 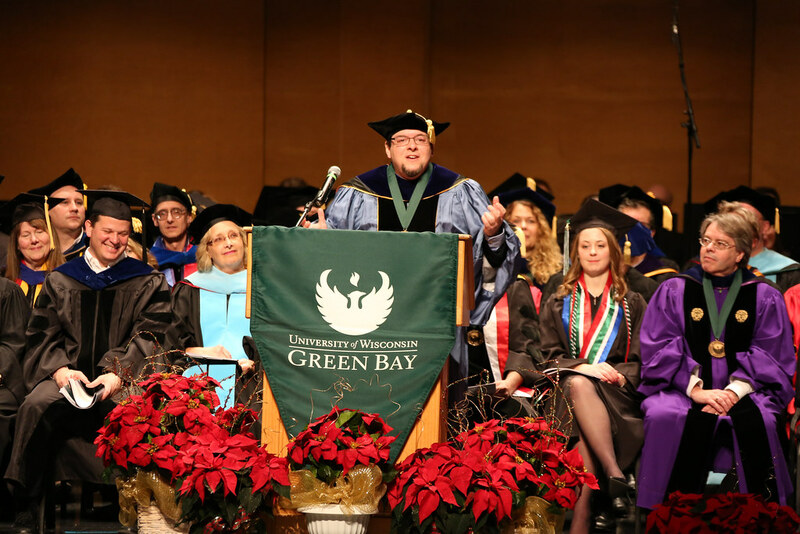 Green Bay Packers Hall of Fame curator and historian Brent Hensel co-taught Prof. Heidi Sherman’s Introduction to Digital and Public Humanities and Prof. Jon Shelton’s Craft of History courses. 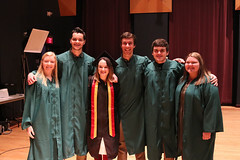 Under the direction of Hensel, Sherman and Shelton, and using primary sources from local archives (including UW-Green Bay’s award-winning Archives and Area Research Center), students from each class combined forces to develop a series of unique digital projects. 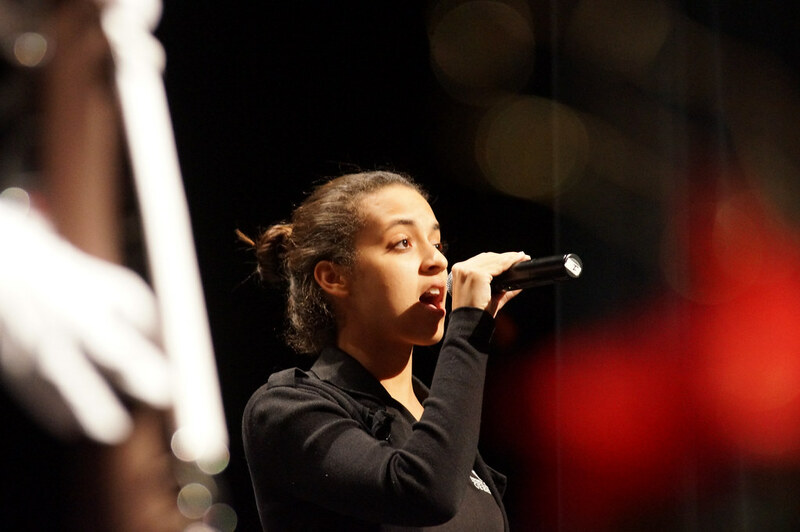 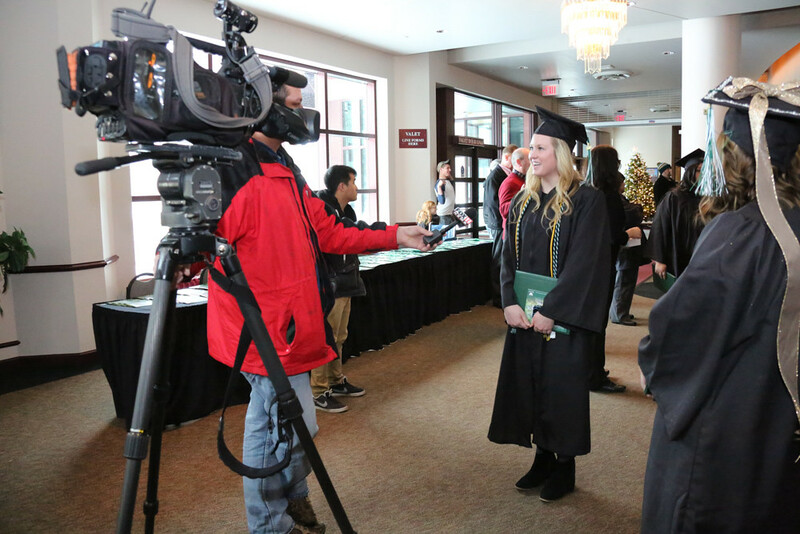 On Wednesday, Dec. 5, from 5-7 p.m. students will present their original scholarship in the 6th Floor North Club at Lambeau Field. 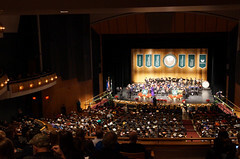 Members of the campus community and the public are invited to attend. 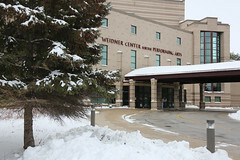 Guests should enter at the Bellin Health Gate and events staff will direct you to where the presentations are being held. This entry was posted in News and tagged CAHSS, Cofrin Library, Green Bay Packers on November 30, 2018 by Janet Bonkowski. 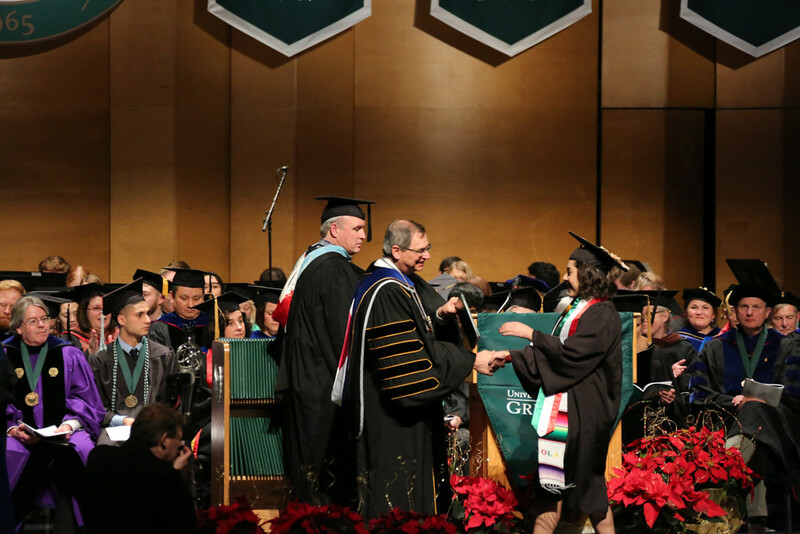 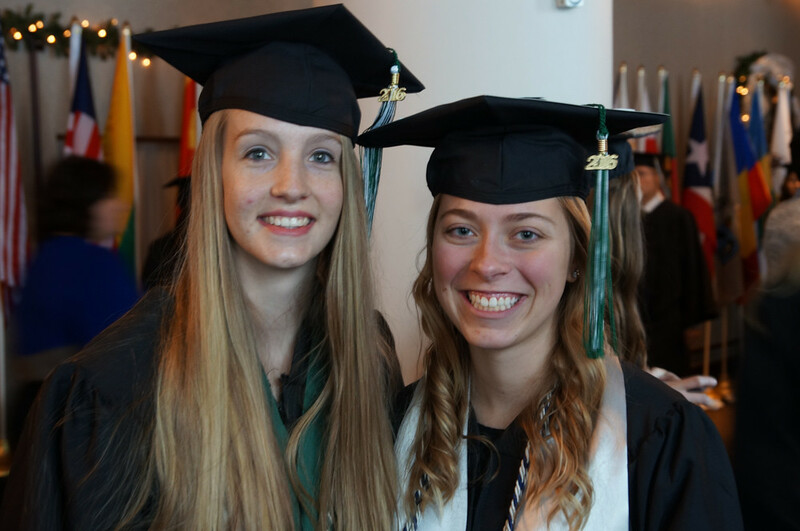 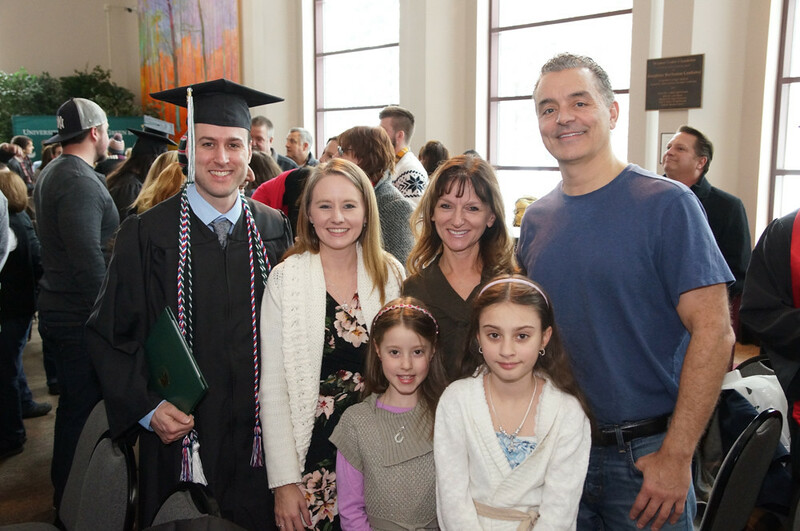 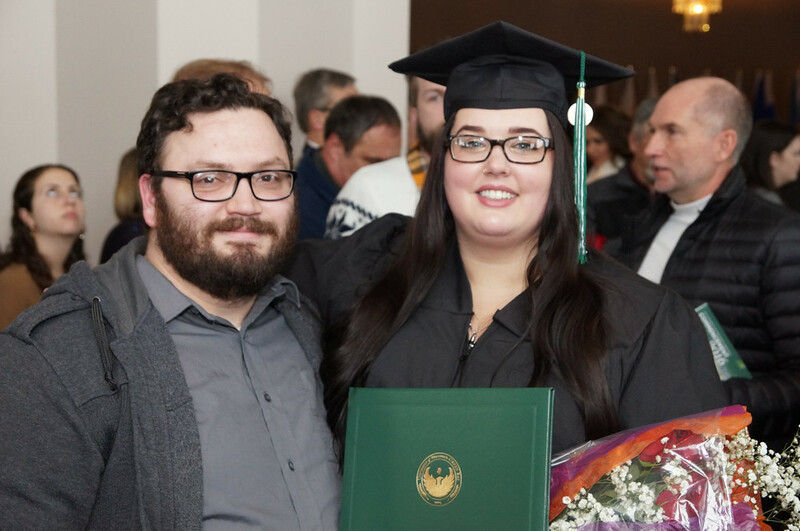 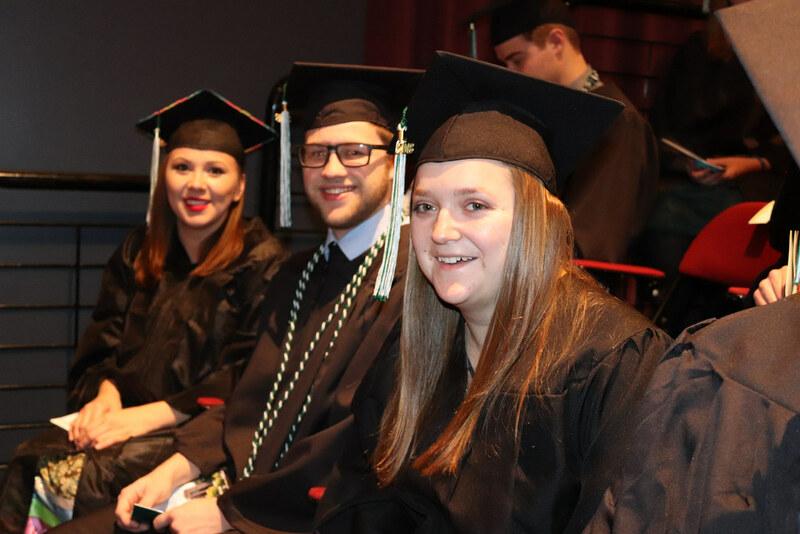 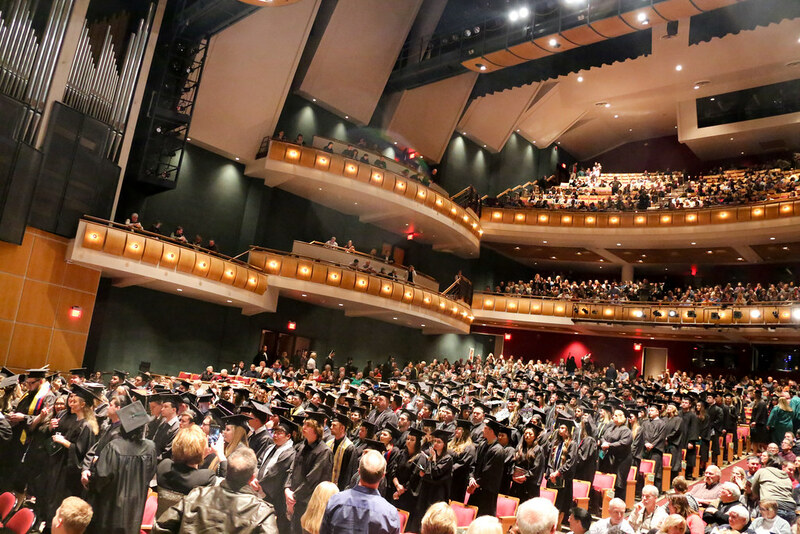 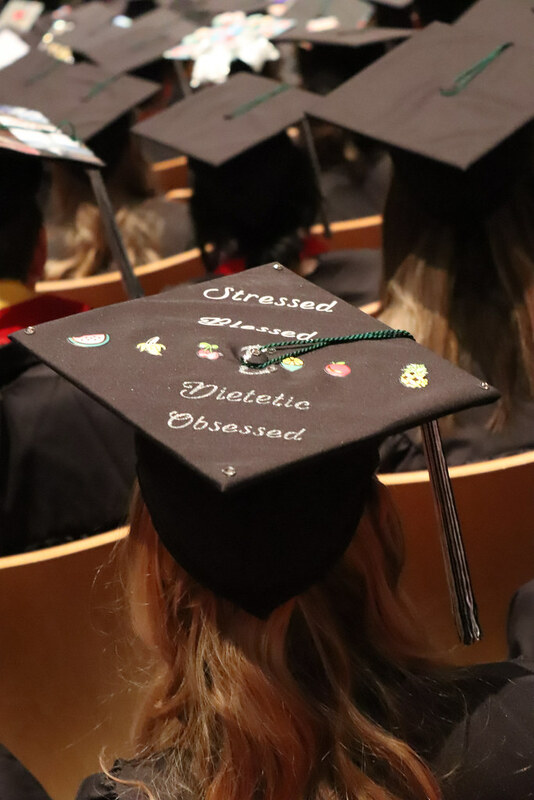 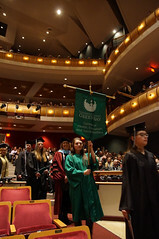 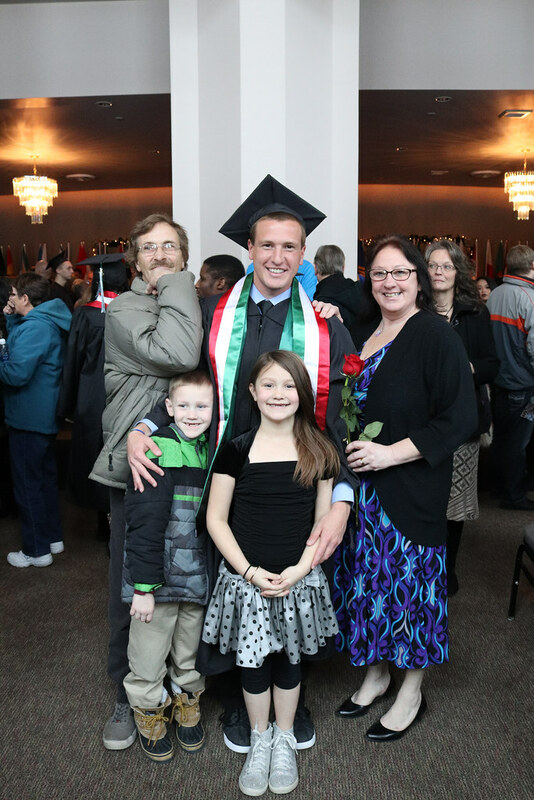 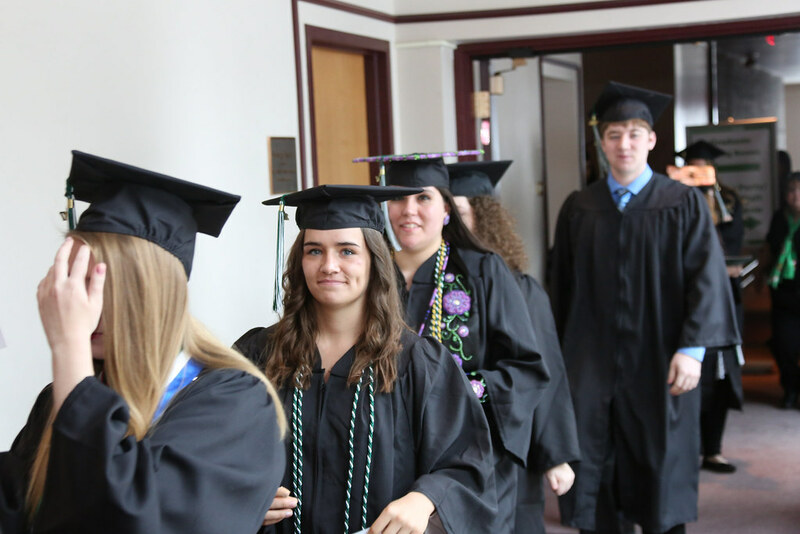 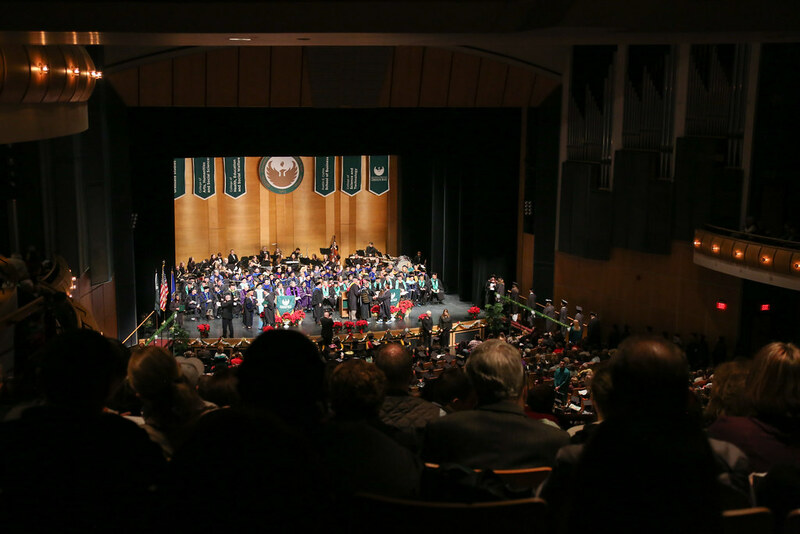 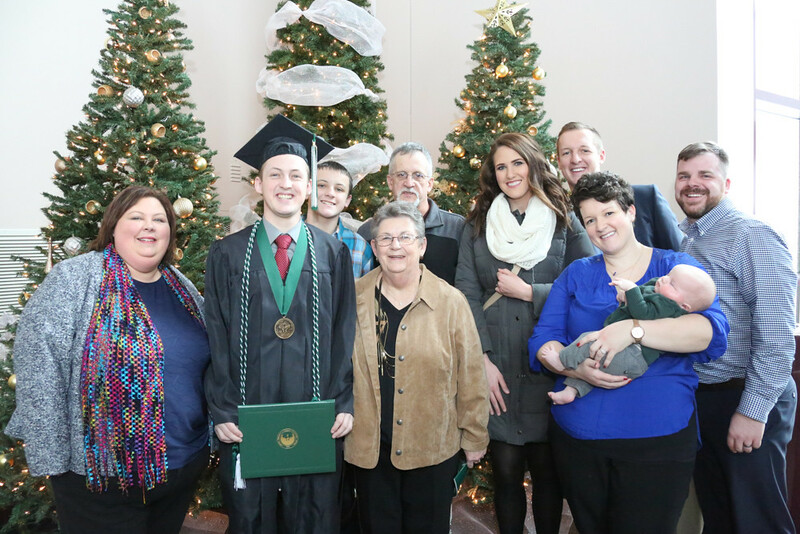 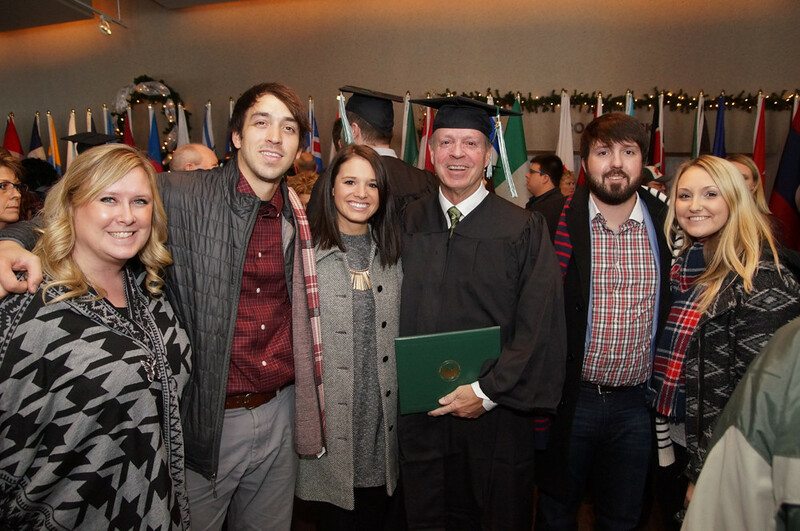 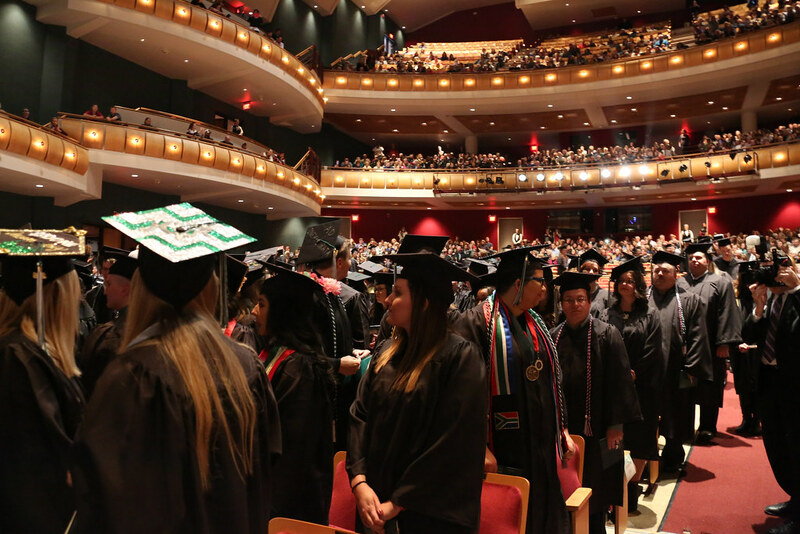 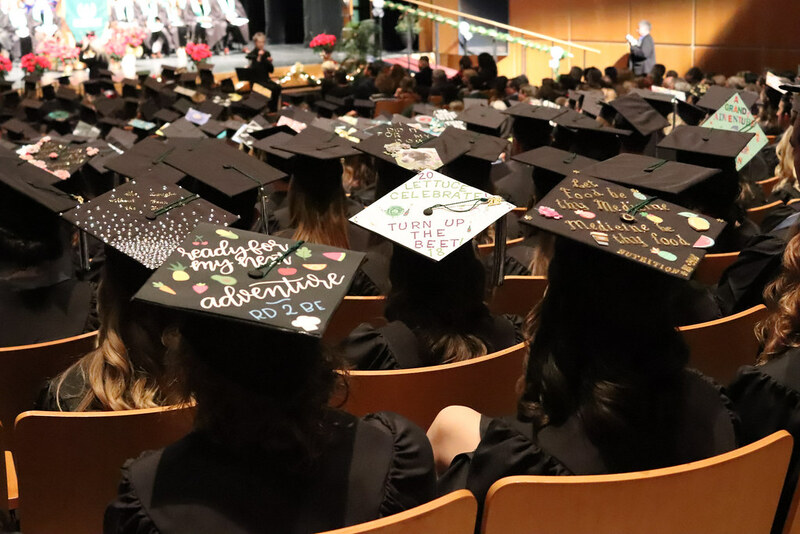 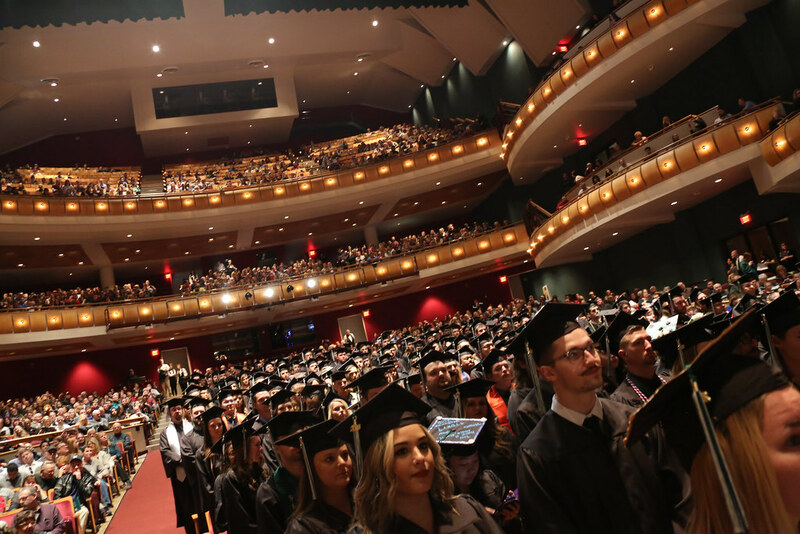 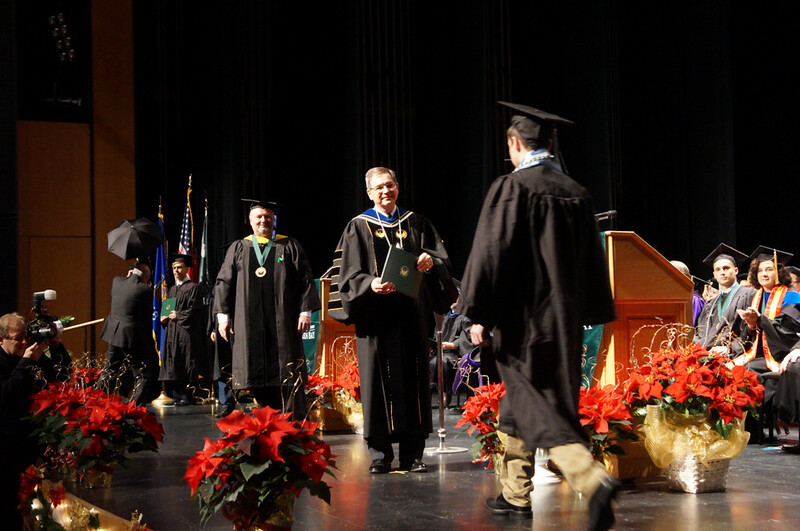 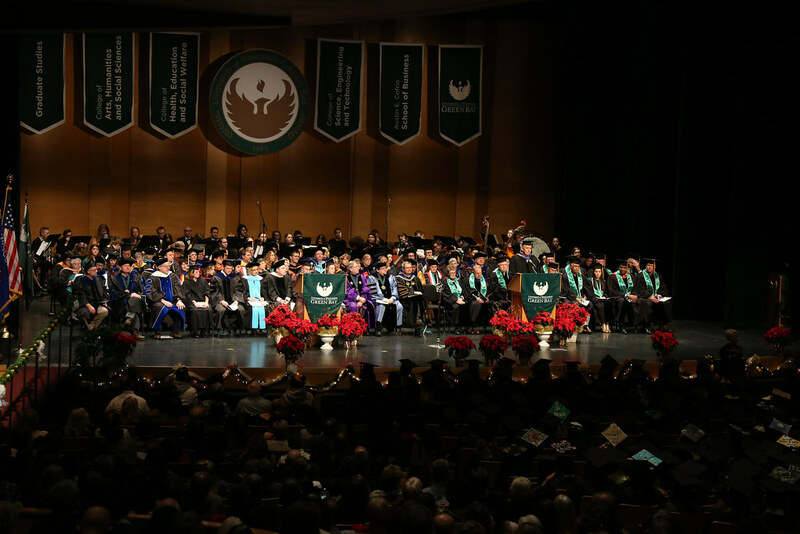 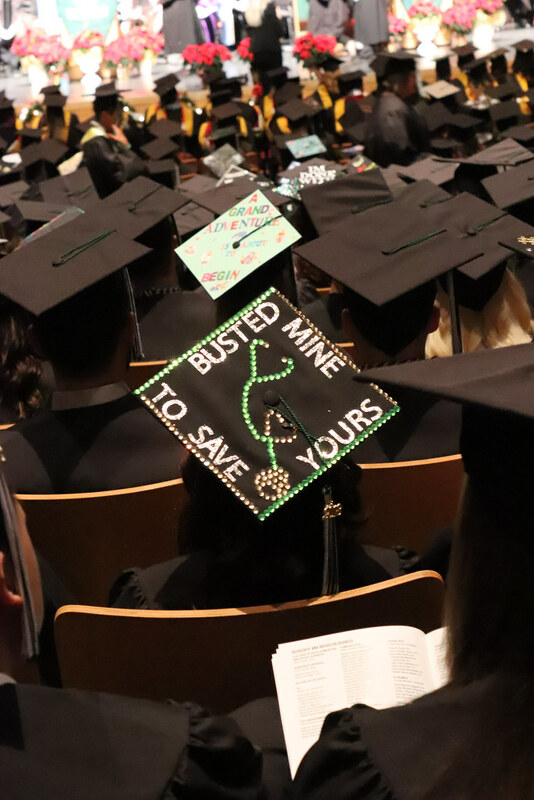 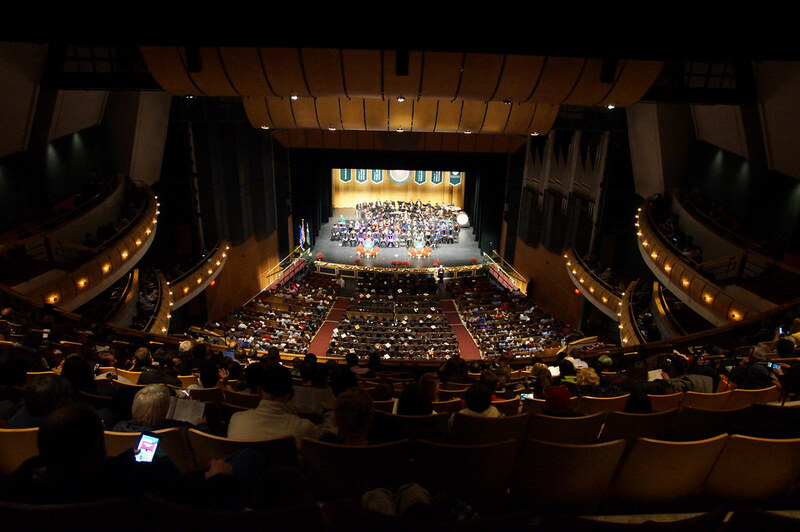 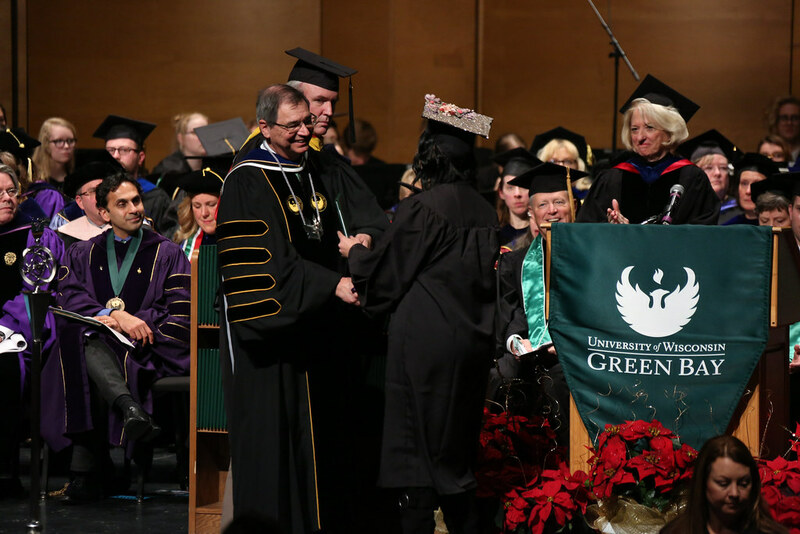 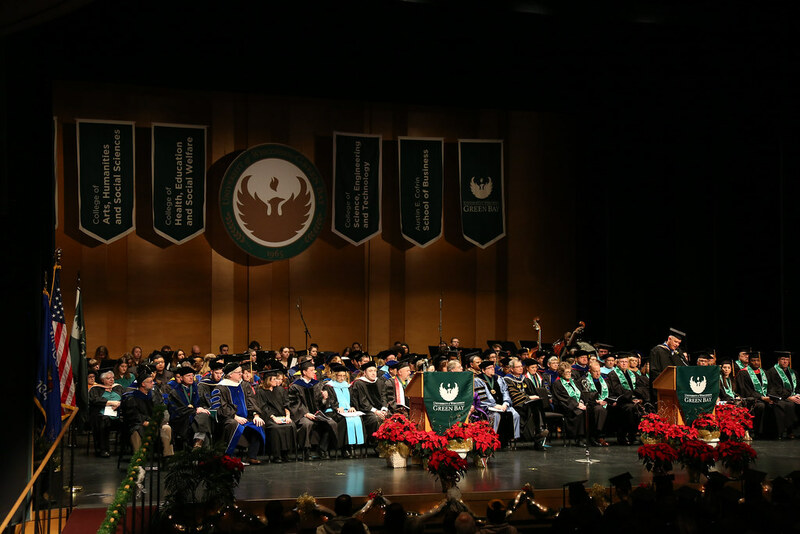 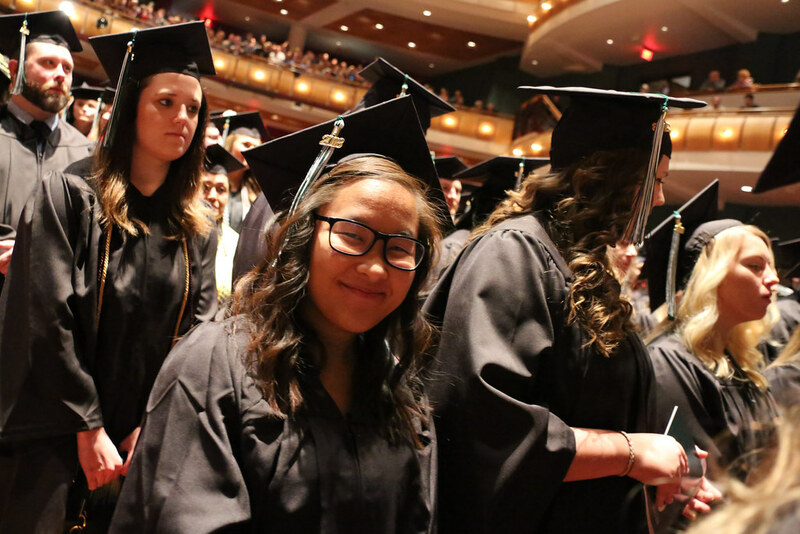 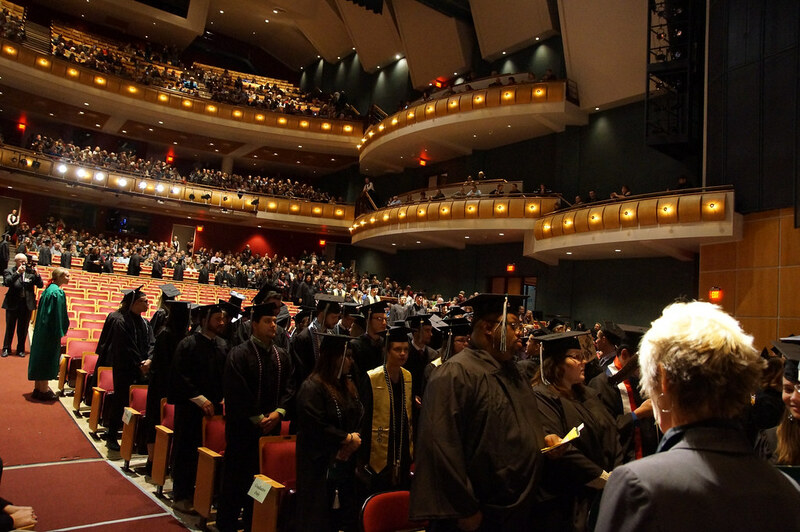 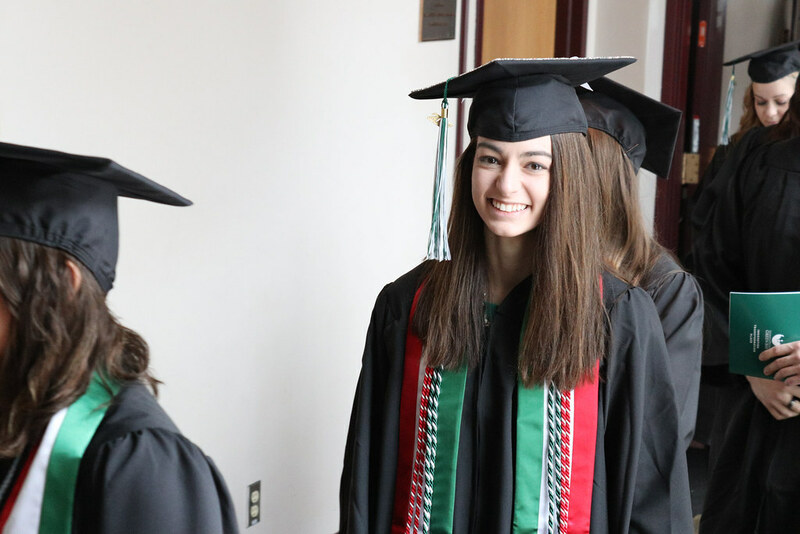 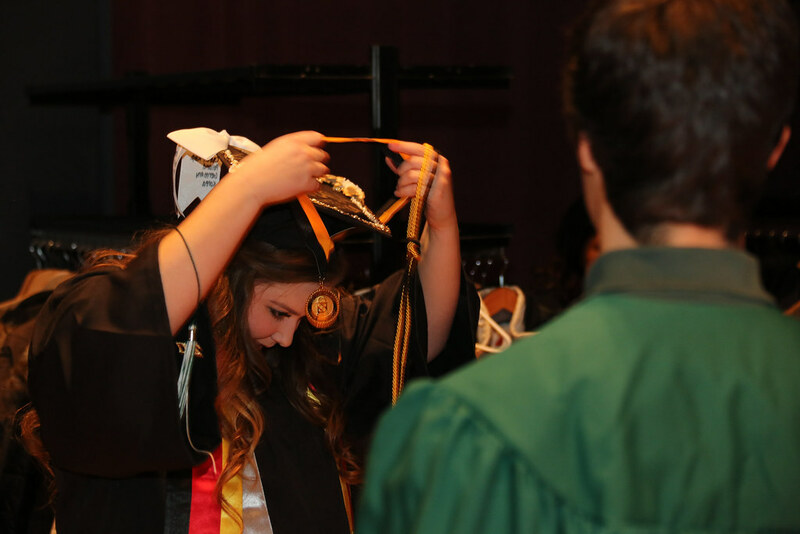 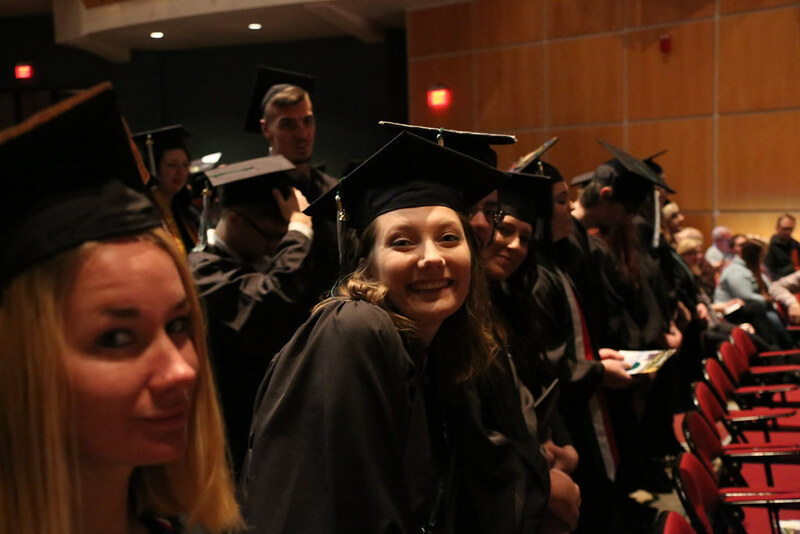 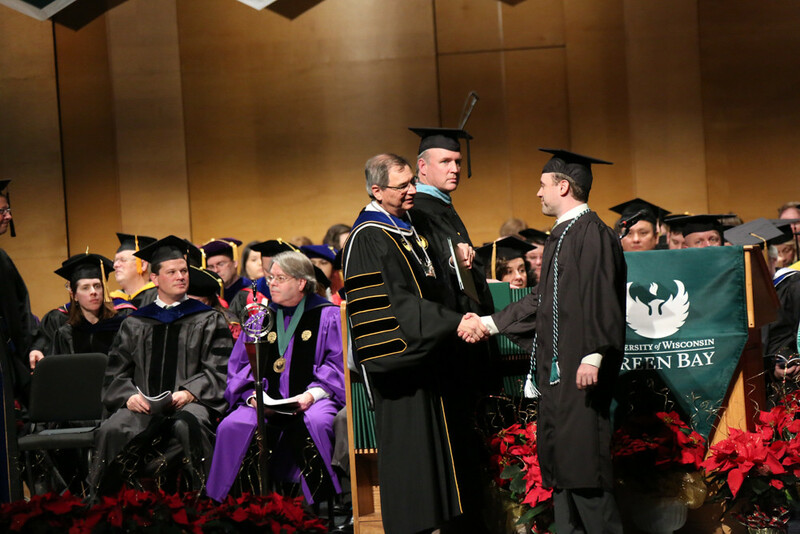 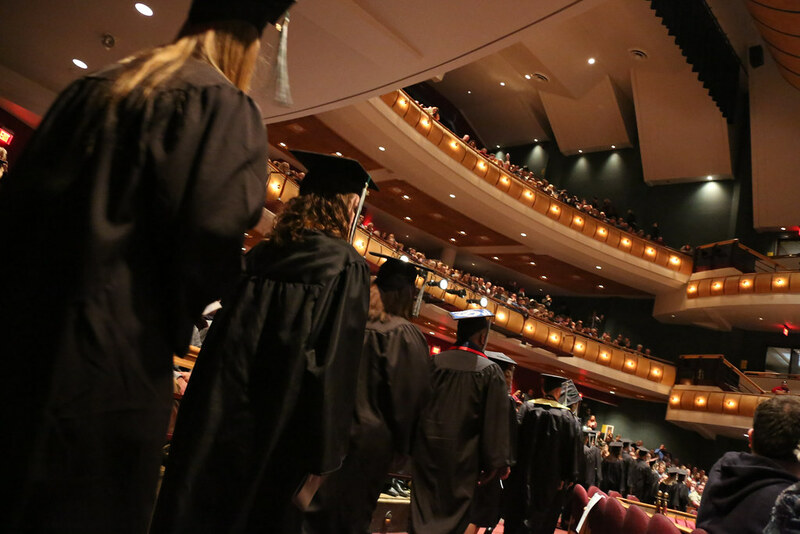 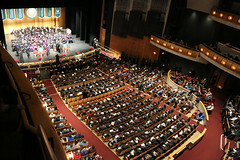 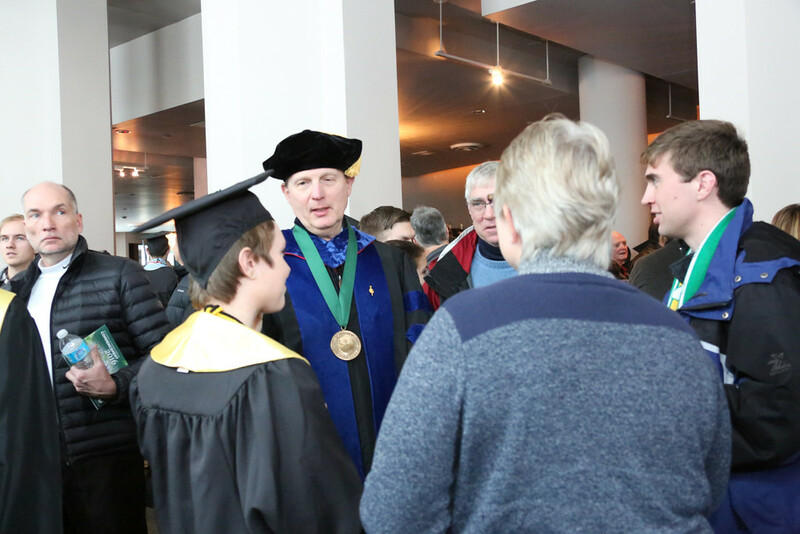 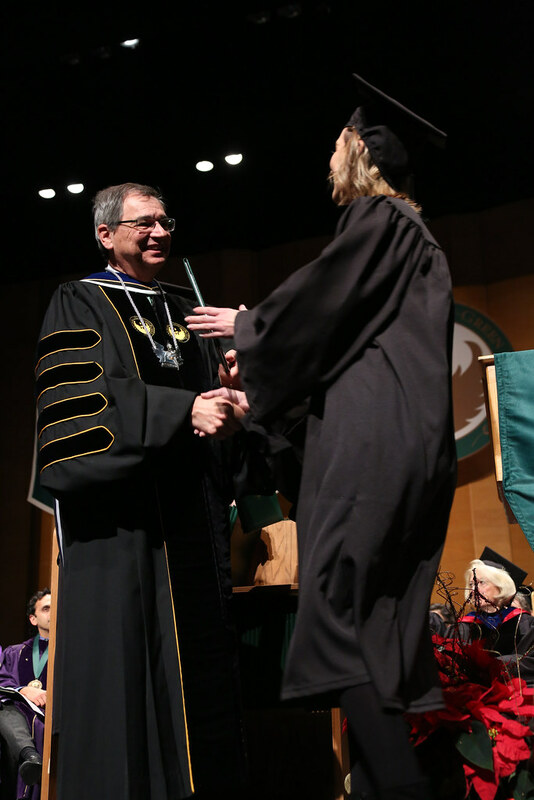 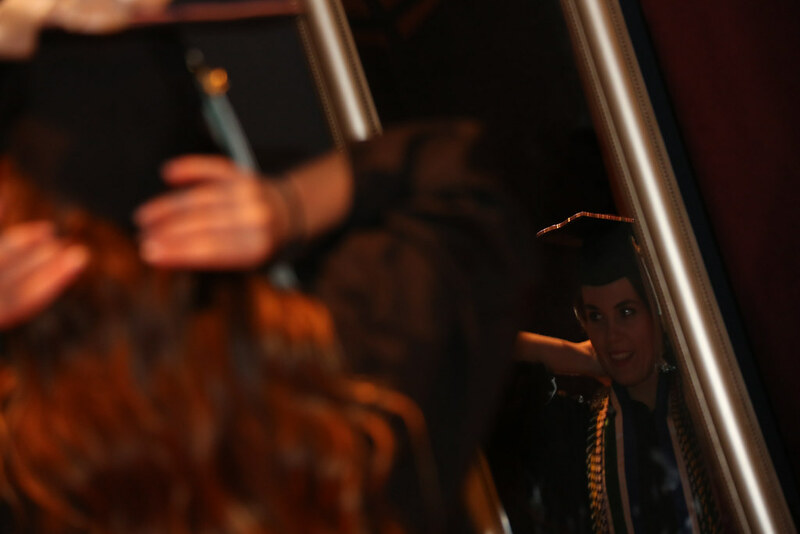 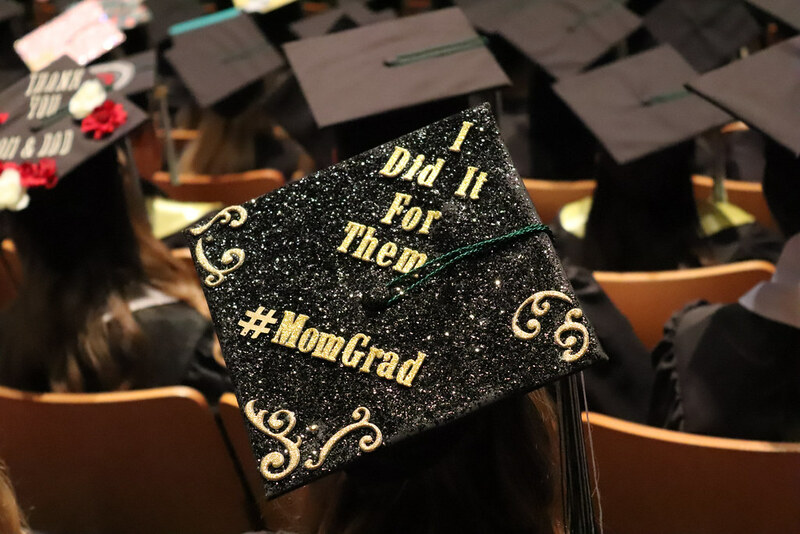 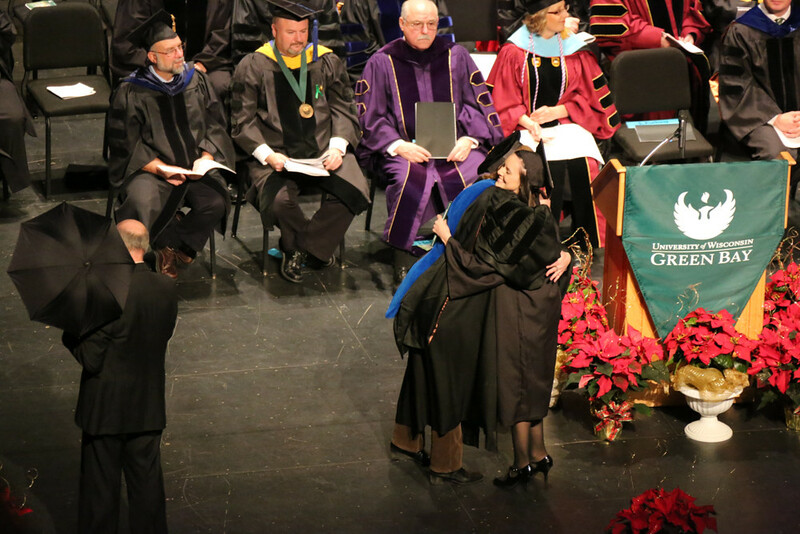 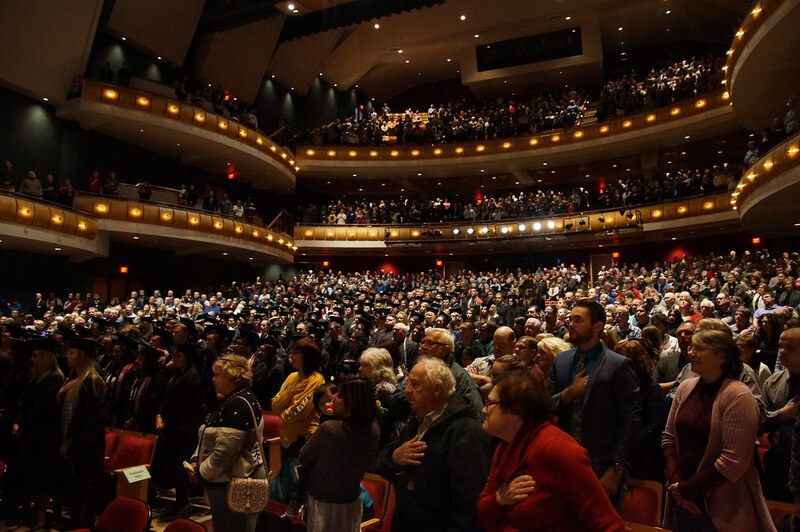 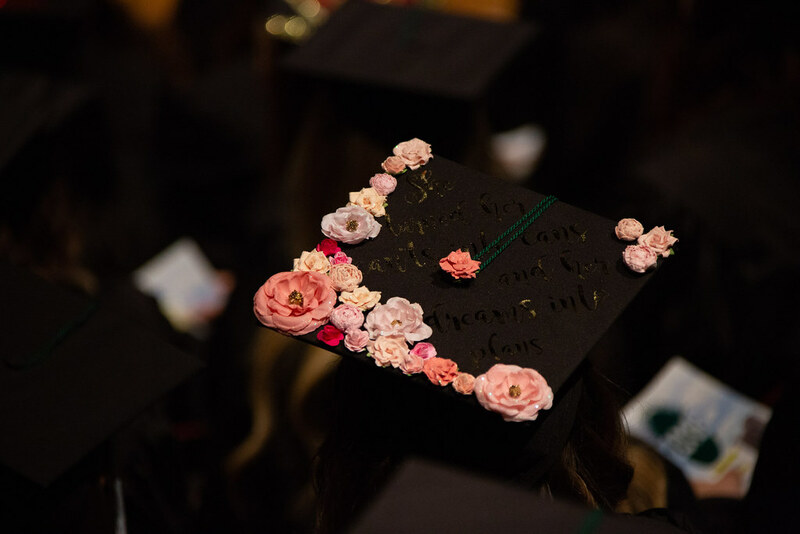 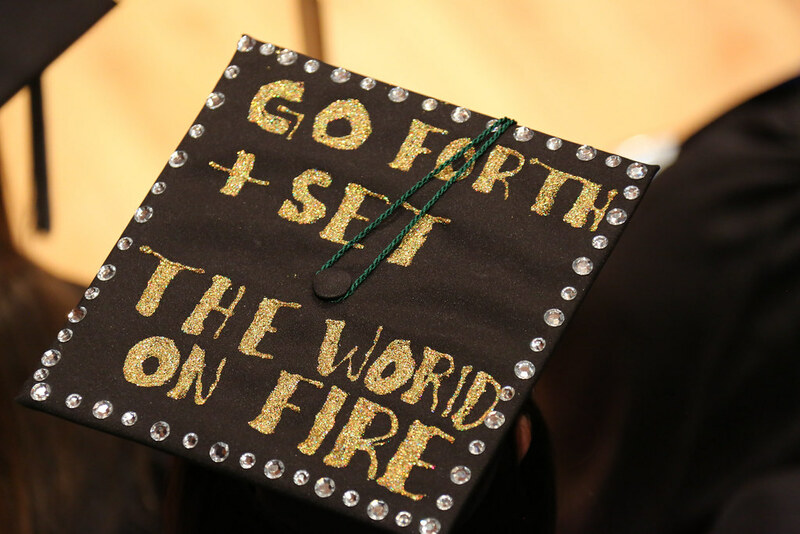 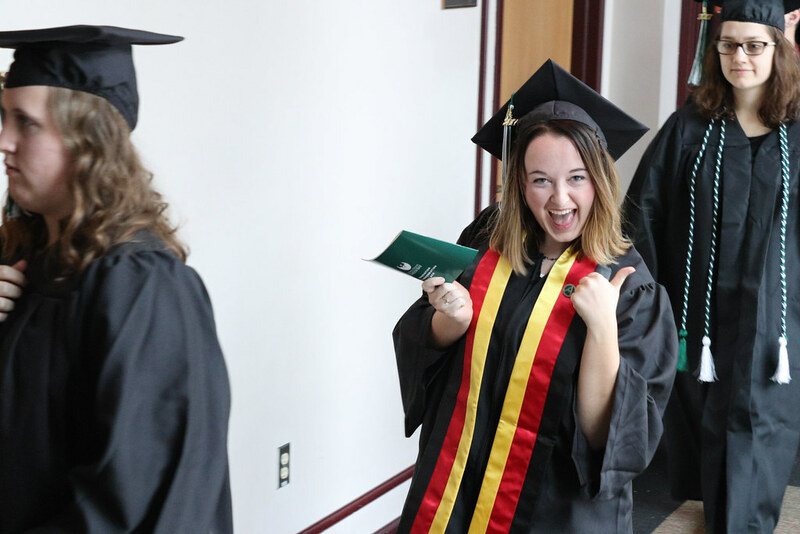 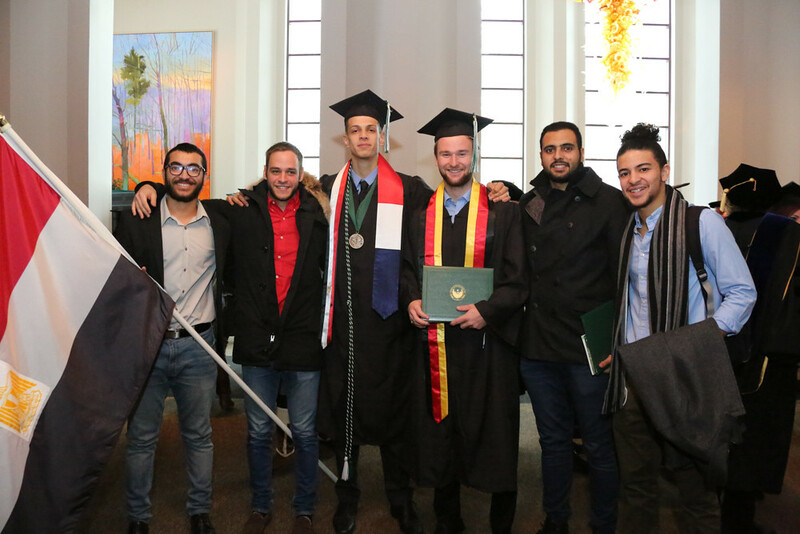 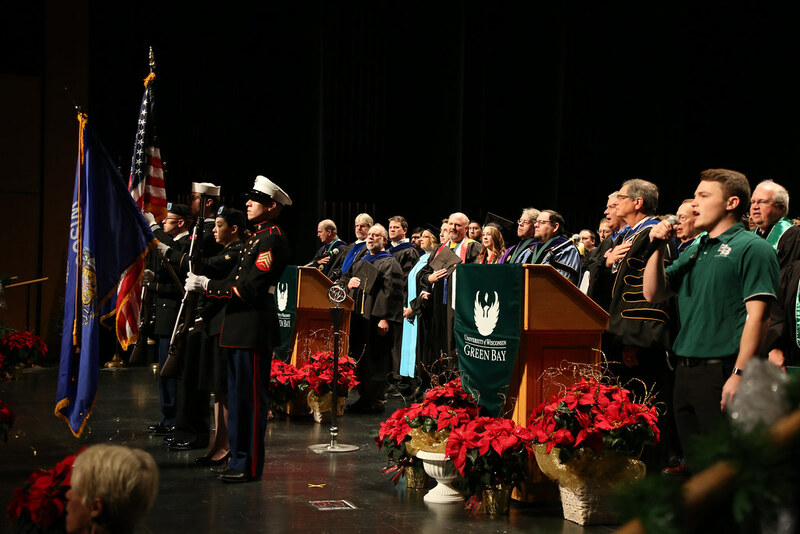 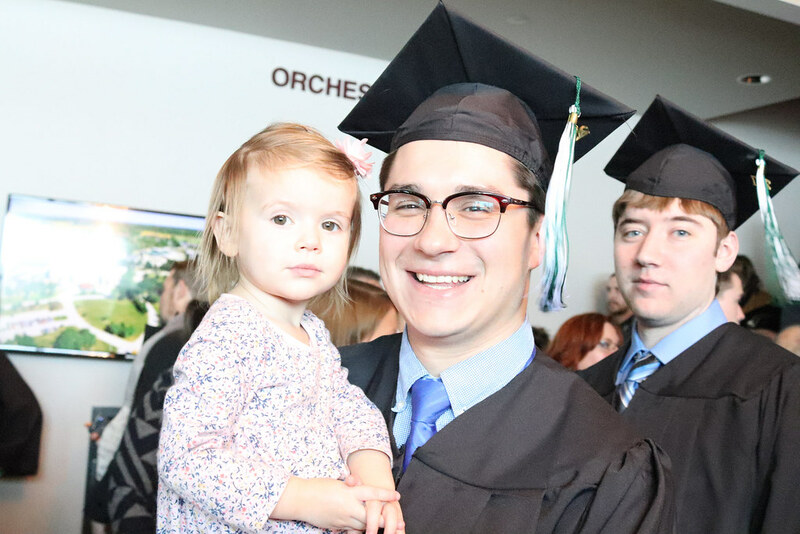 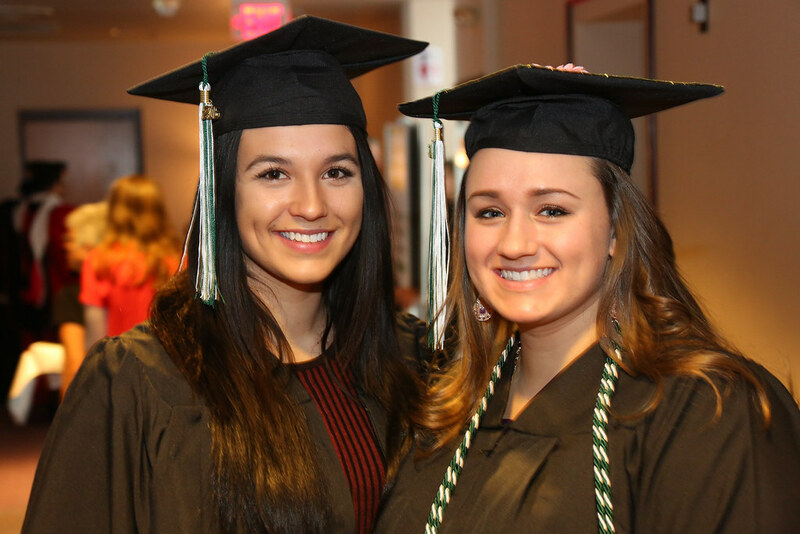 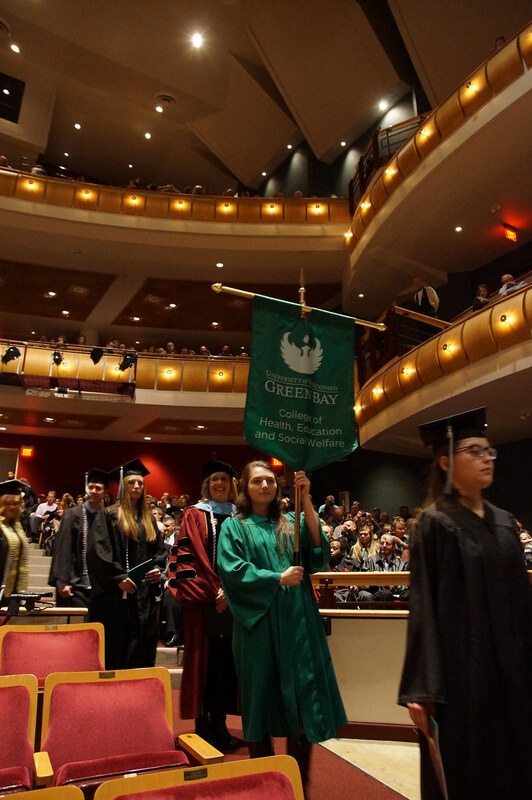 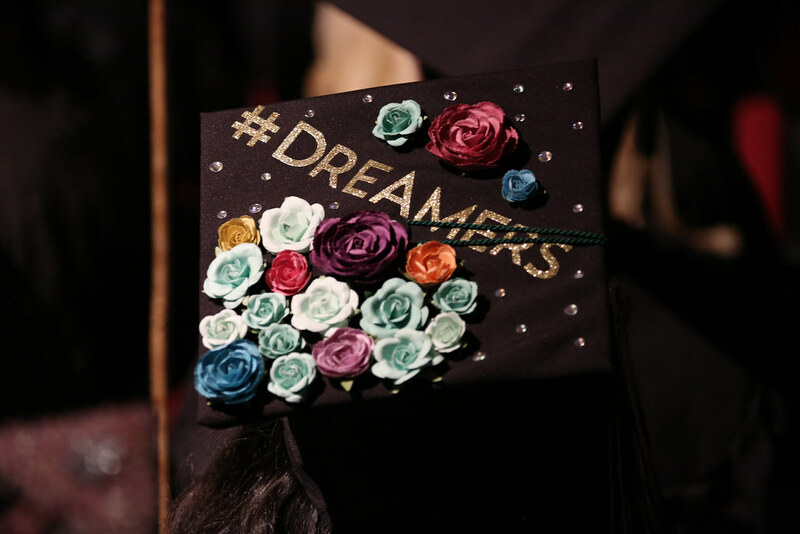 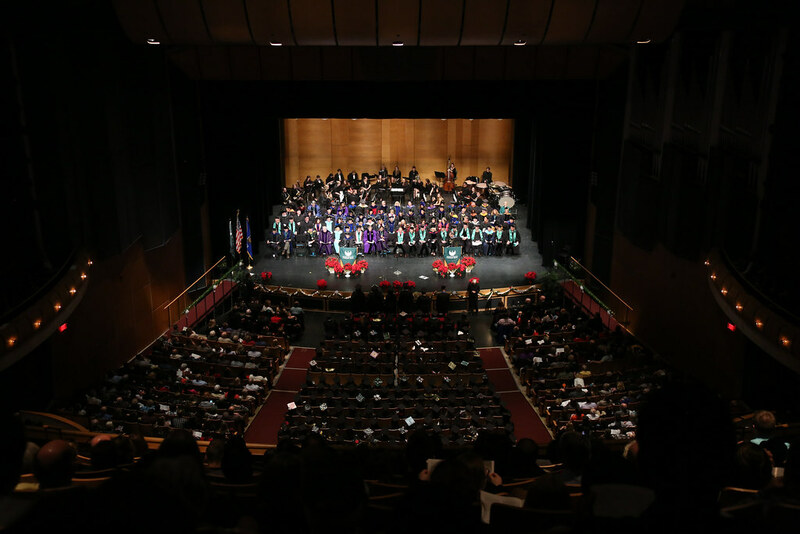 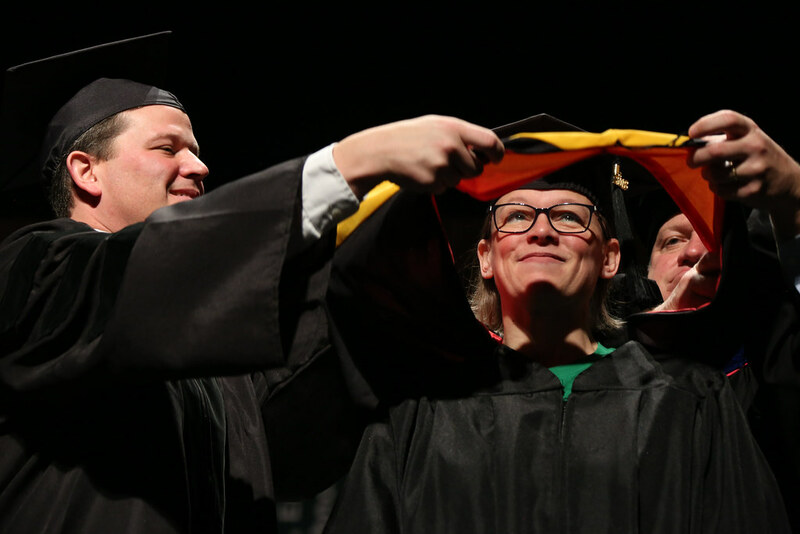 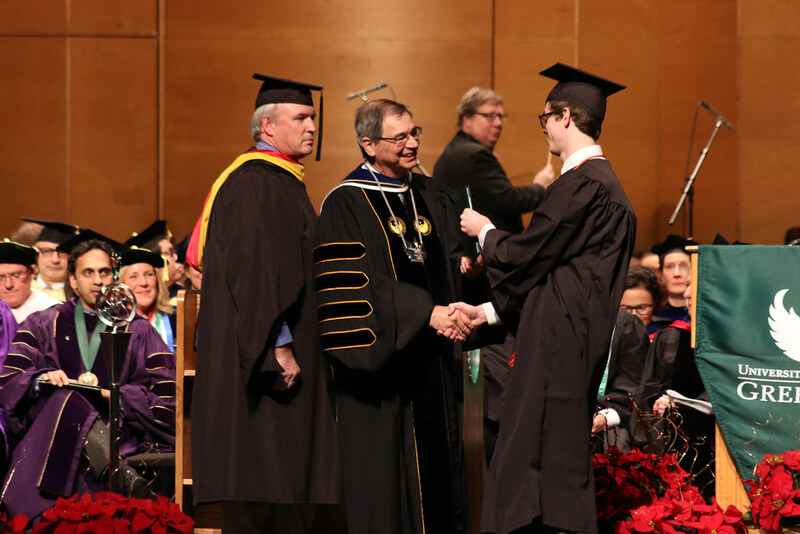 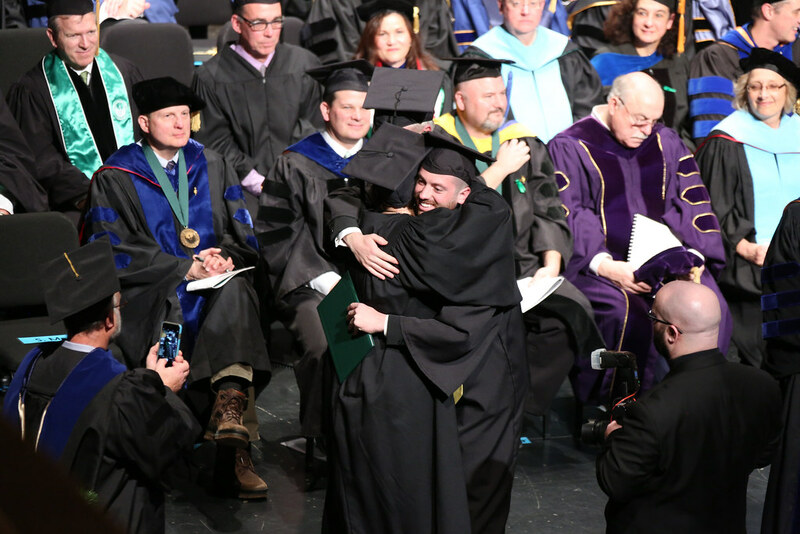 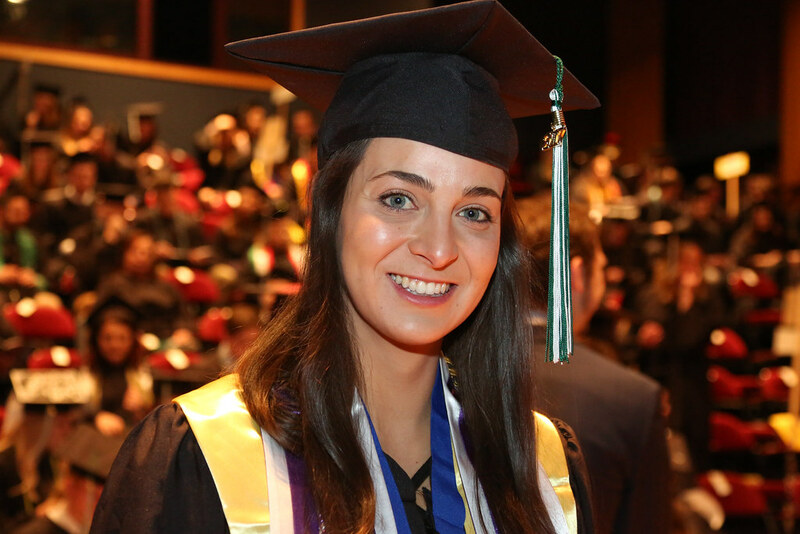 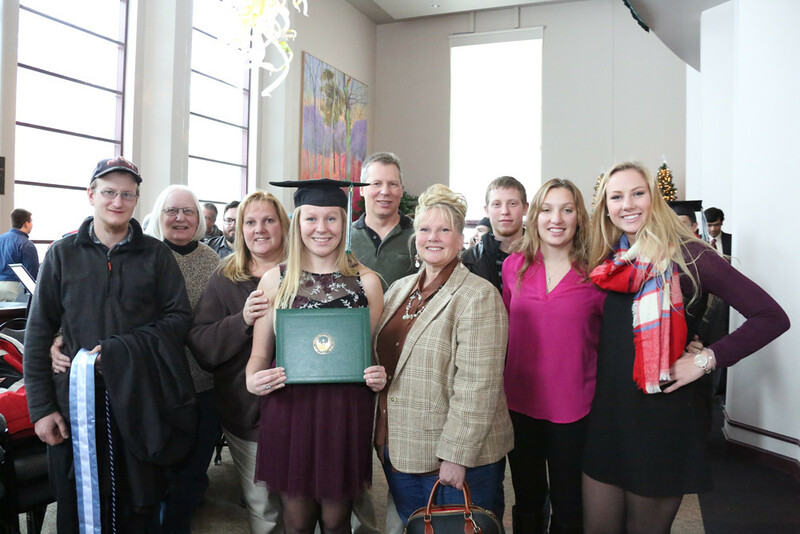 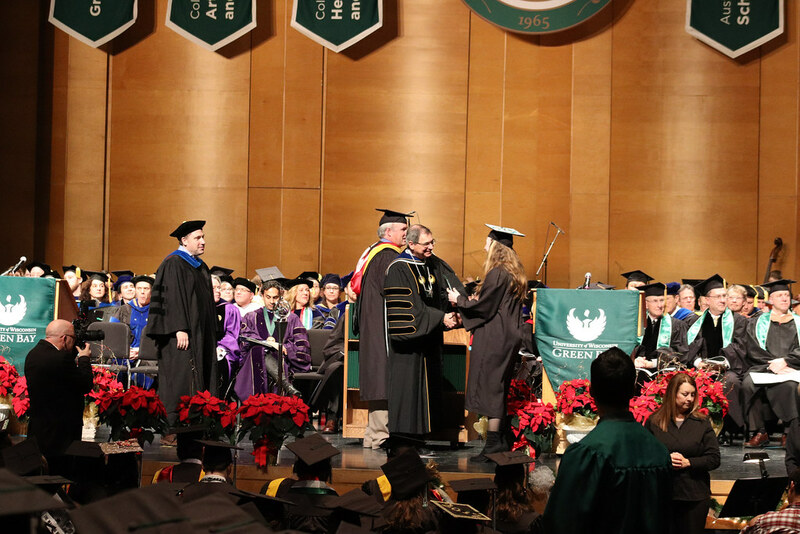 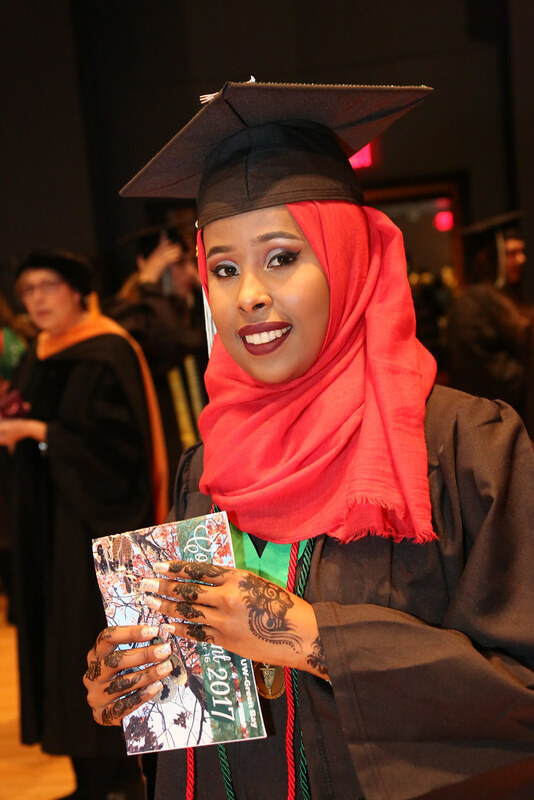 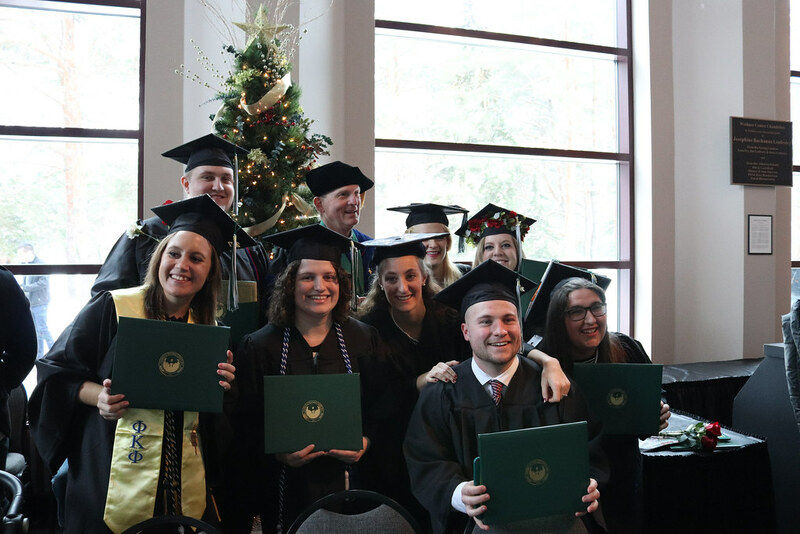 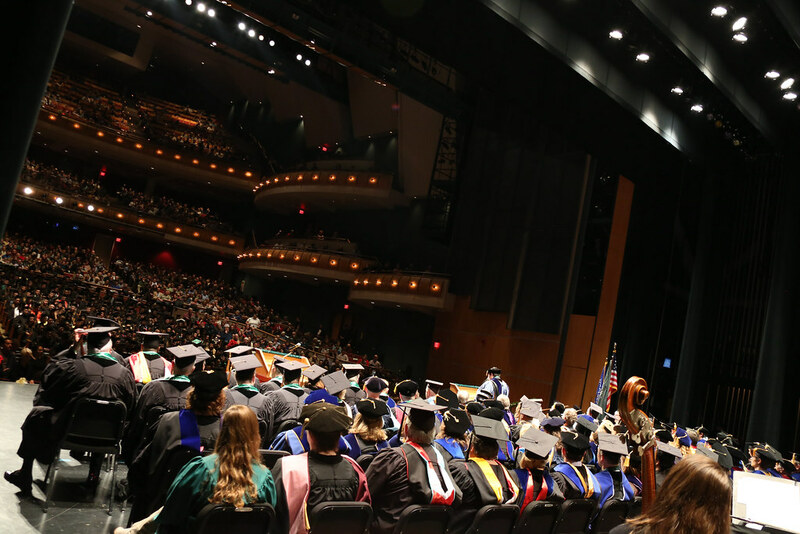 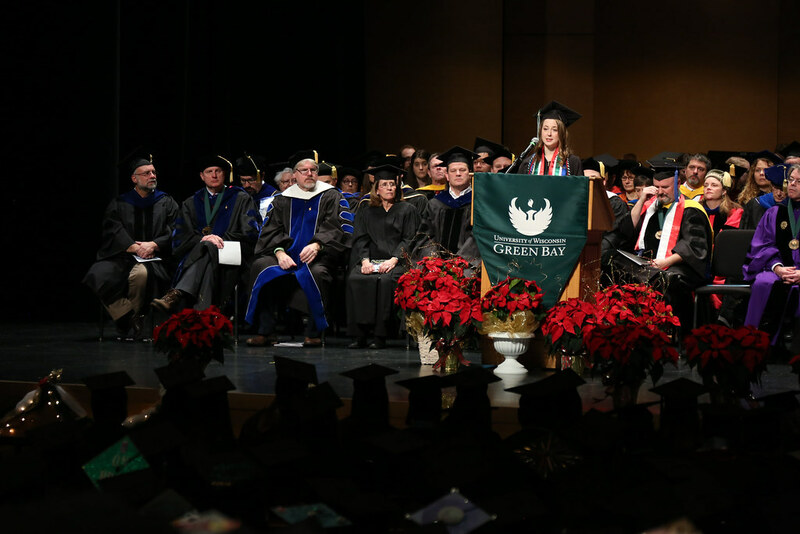 It was an epic Commencement Day for the 437 UW-Green Bay graduates, friends and family gathered on campus at the Weidner Center for the Performing Arts on Saturday, December 16, 2017. 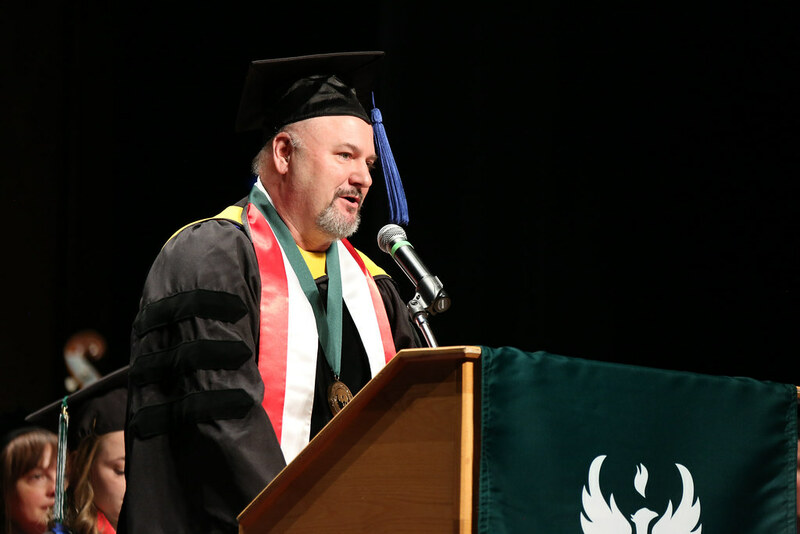 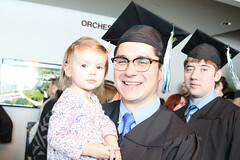 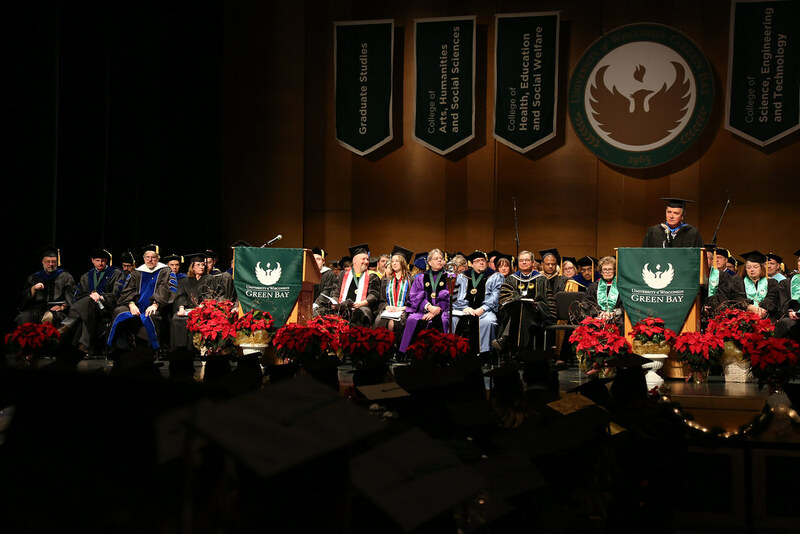 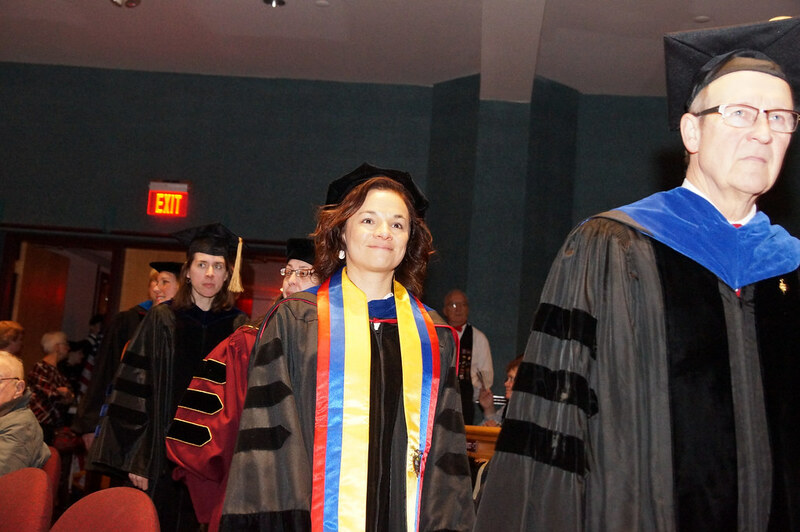 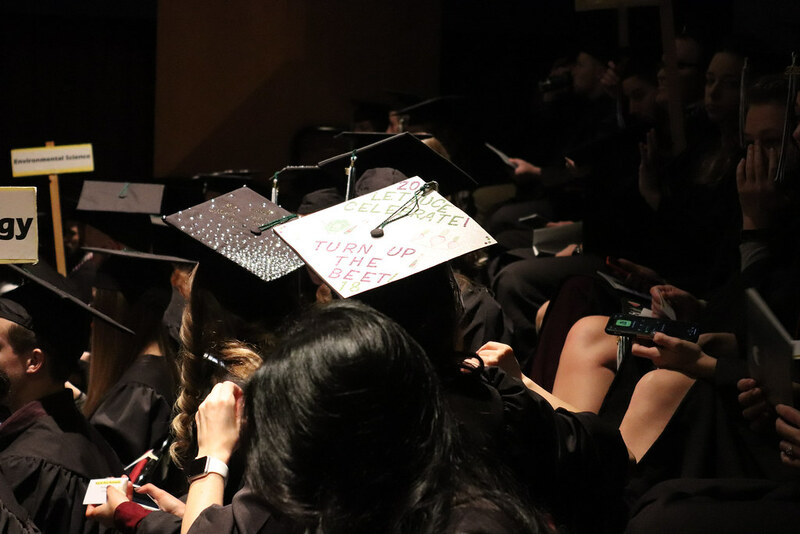 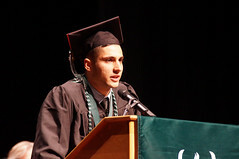 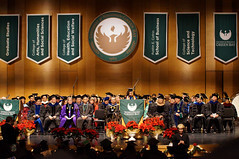 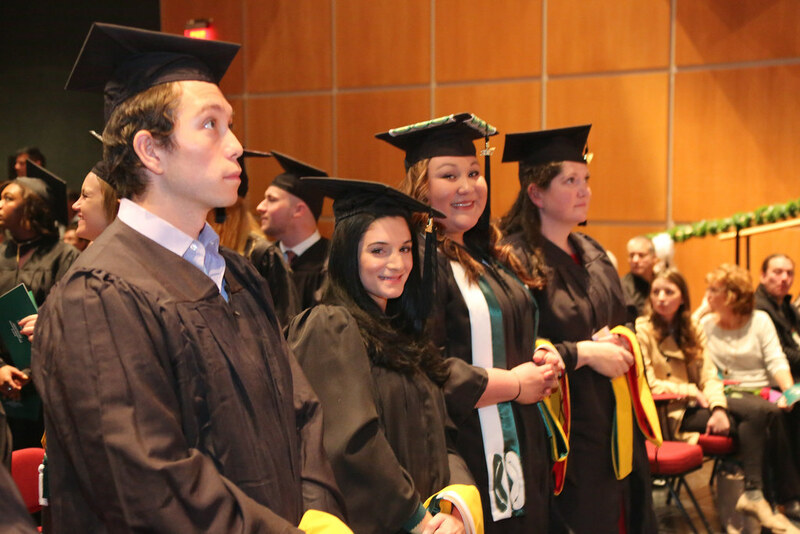 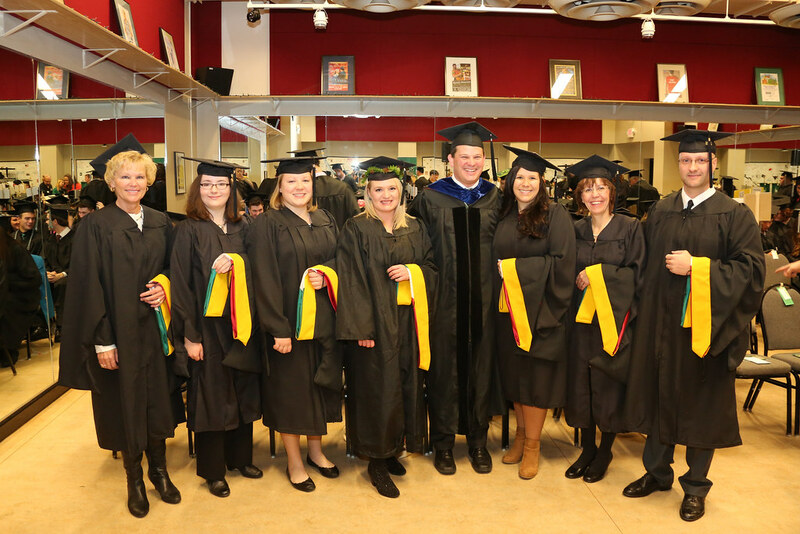 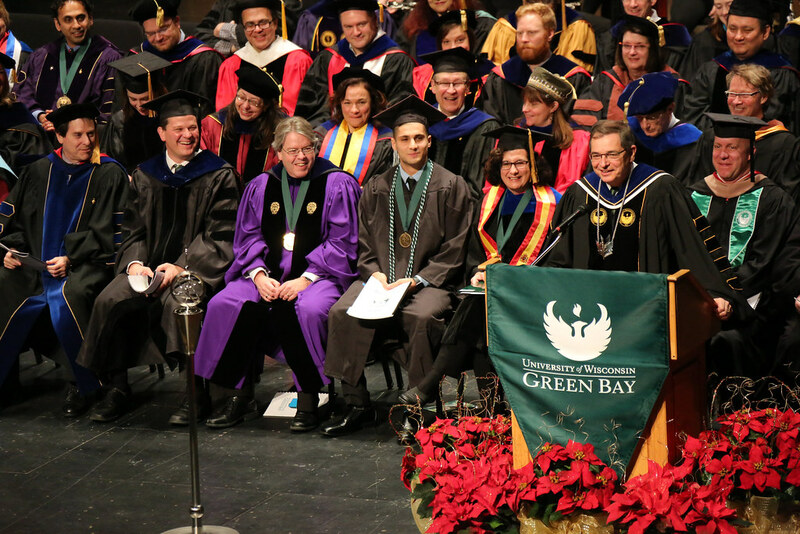 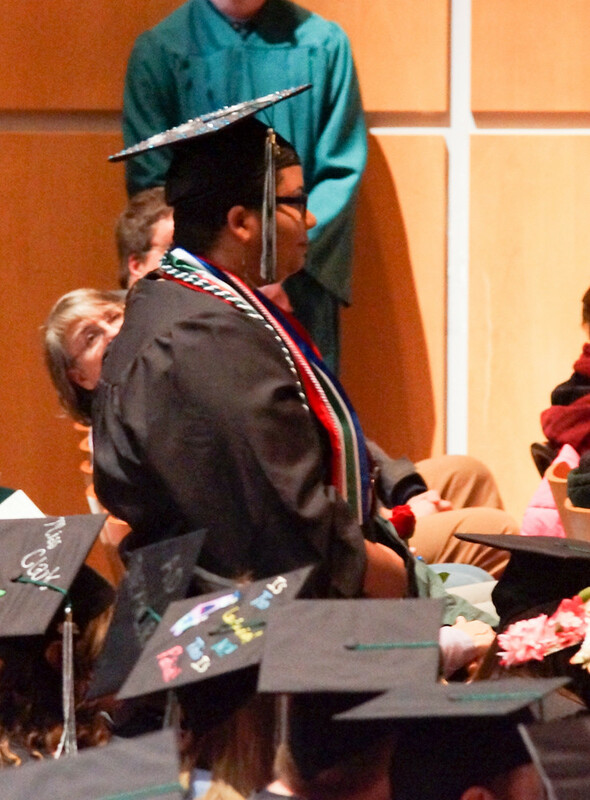 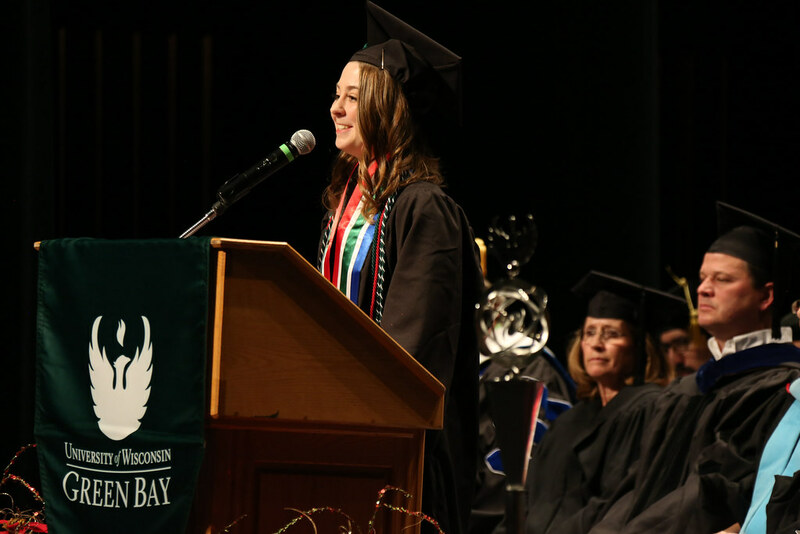 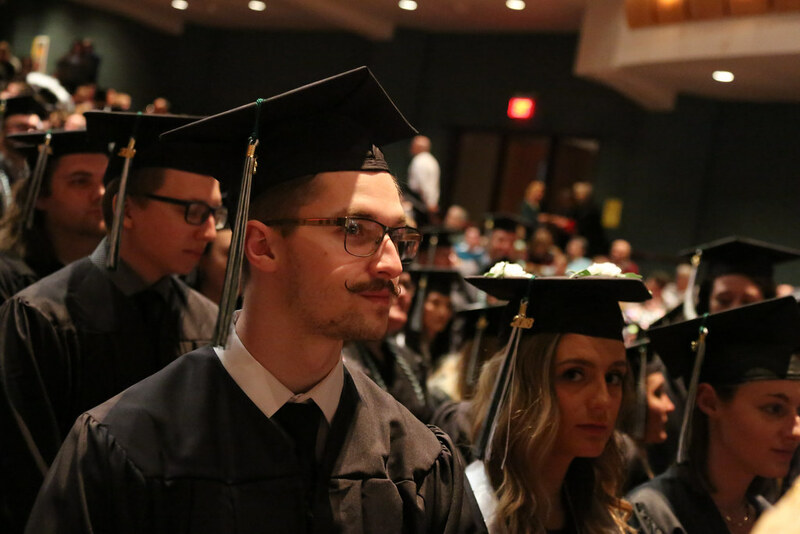 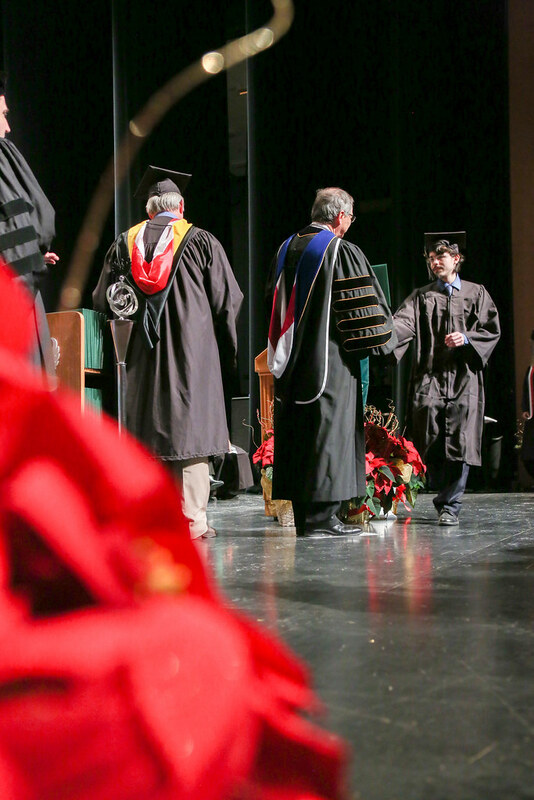 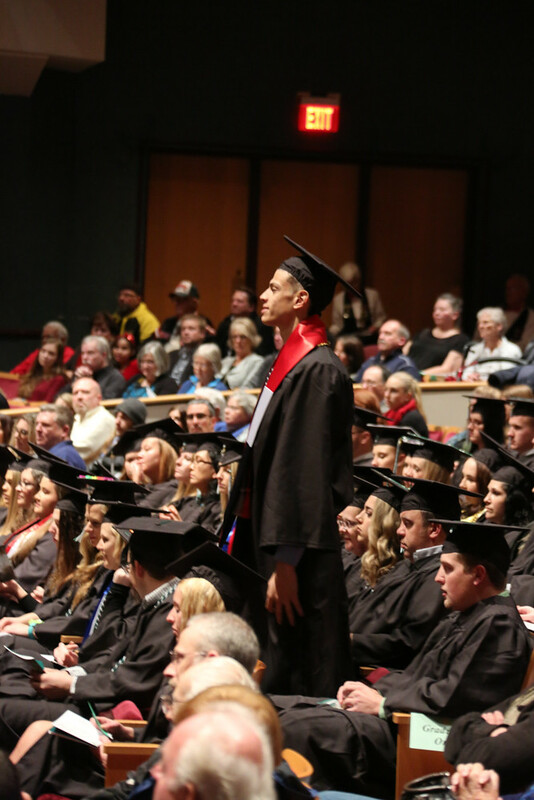 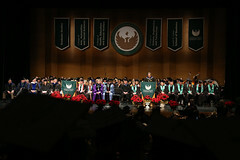 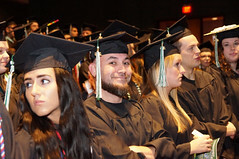 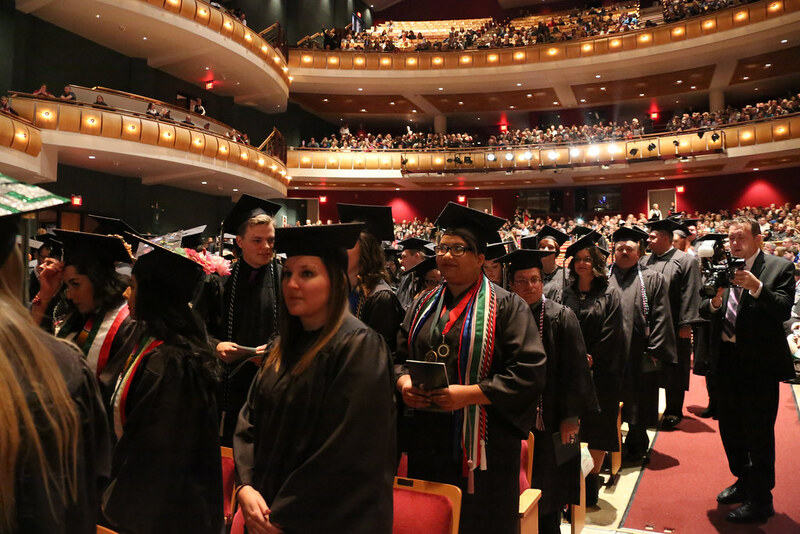 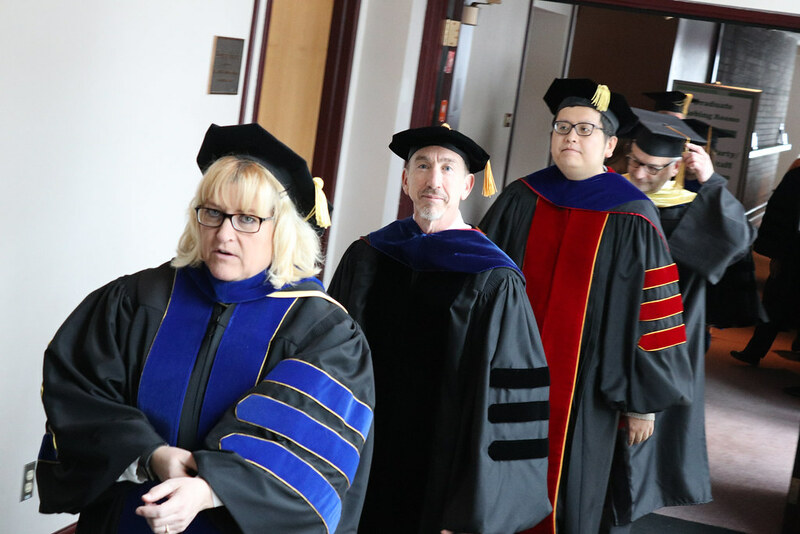 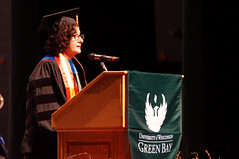 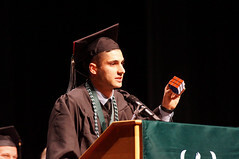 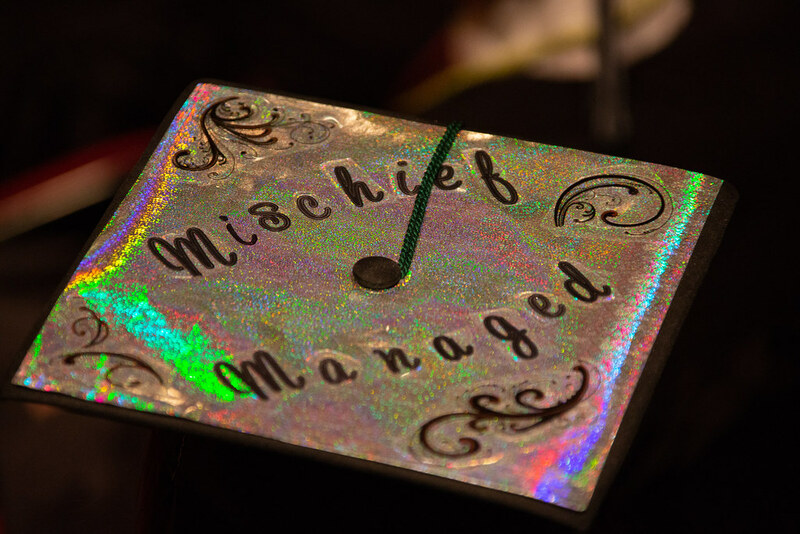 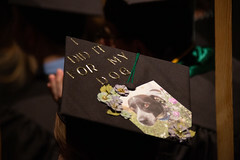 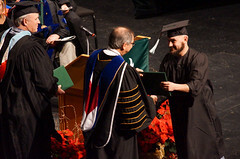 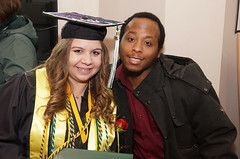 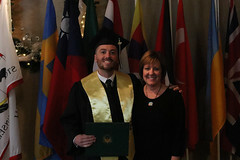 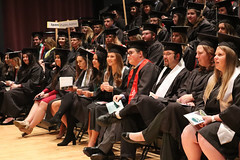 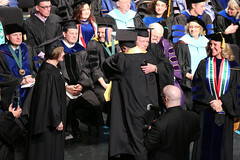 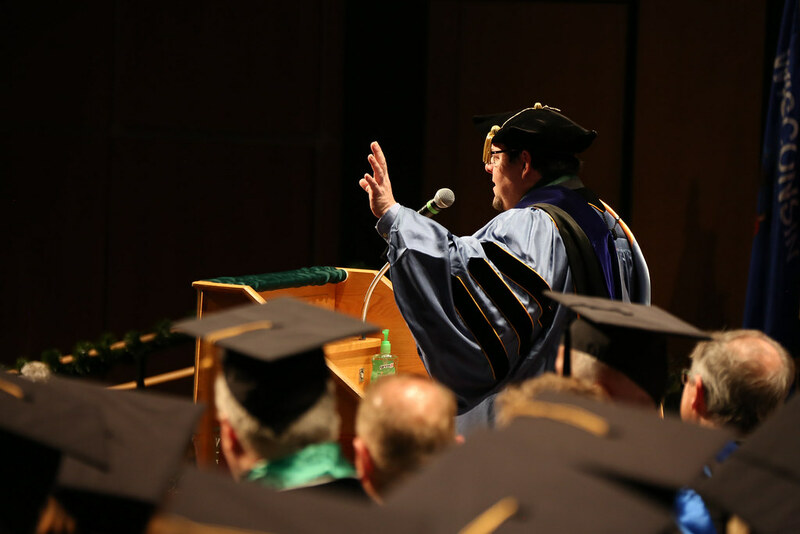 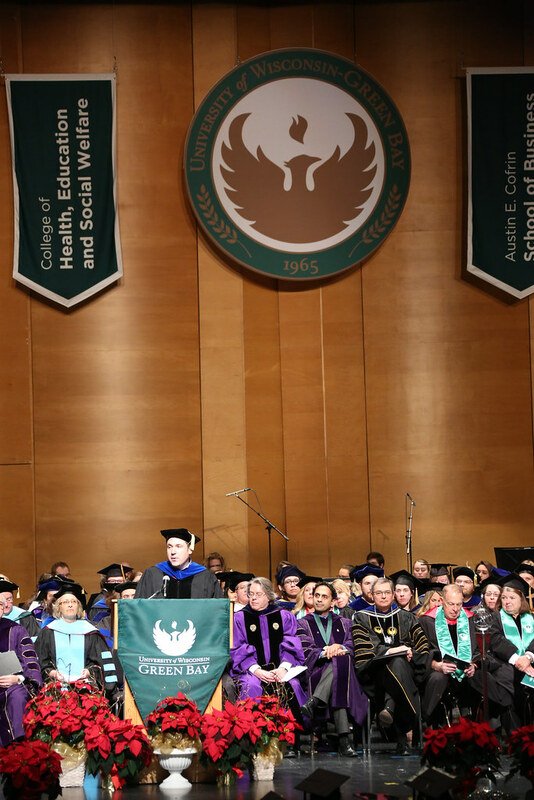 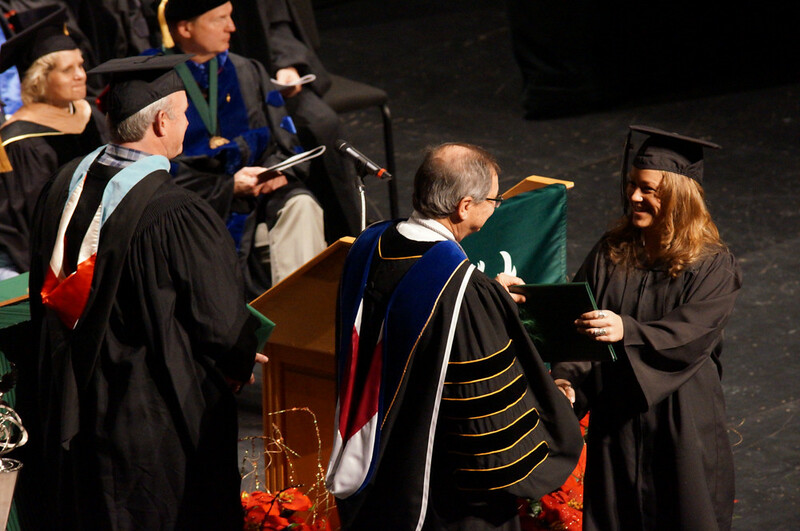 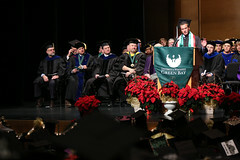 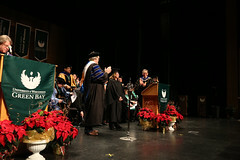 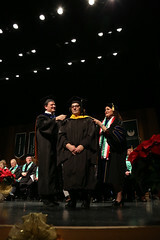 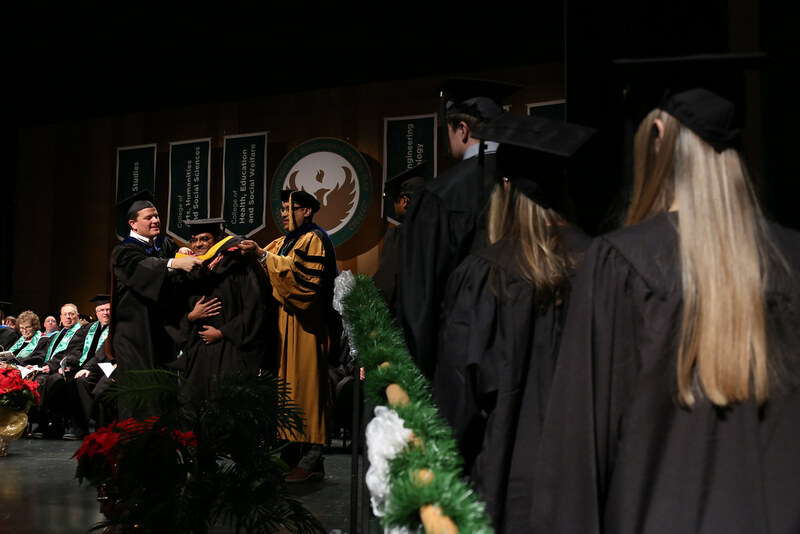 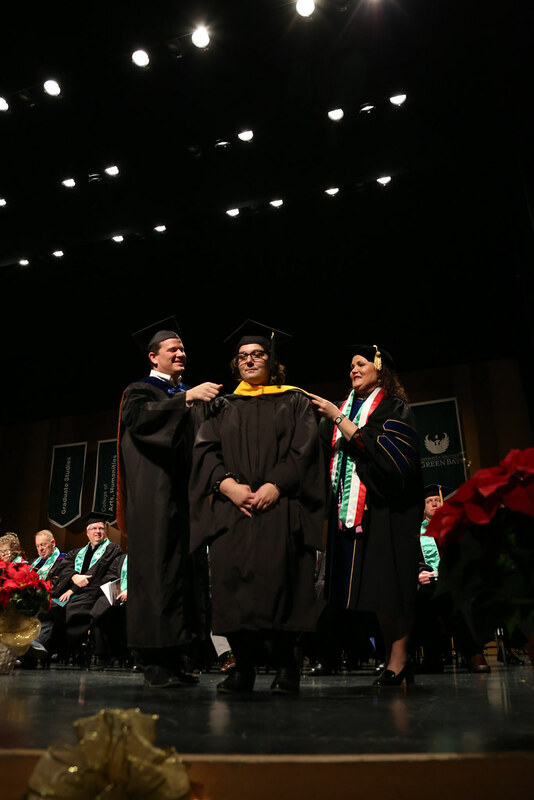 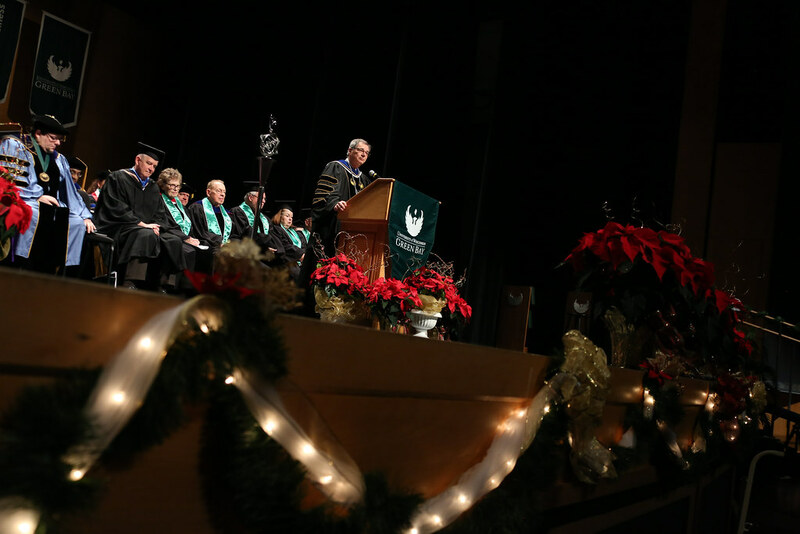 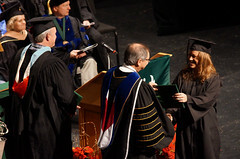 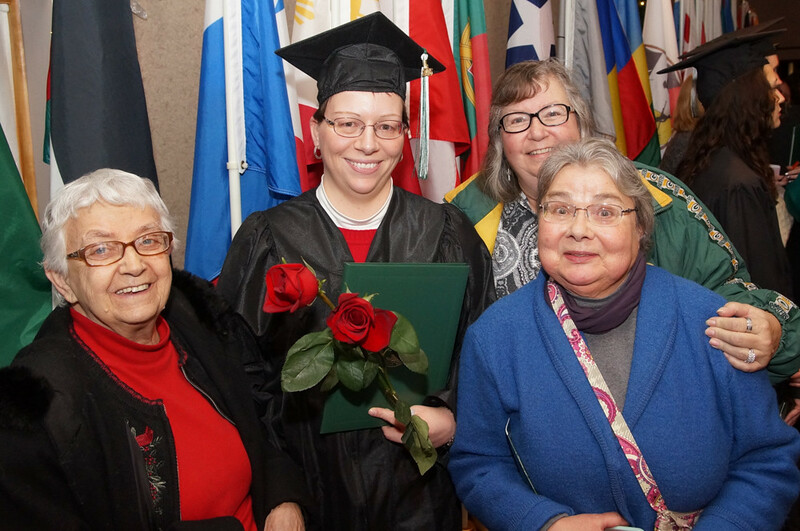 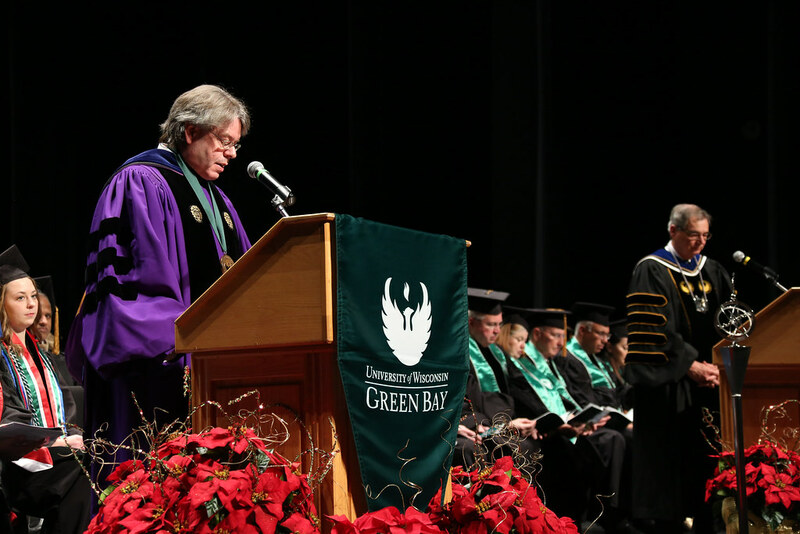 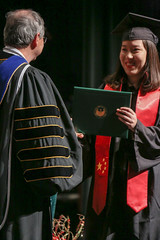 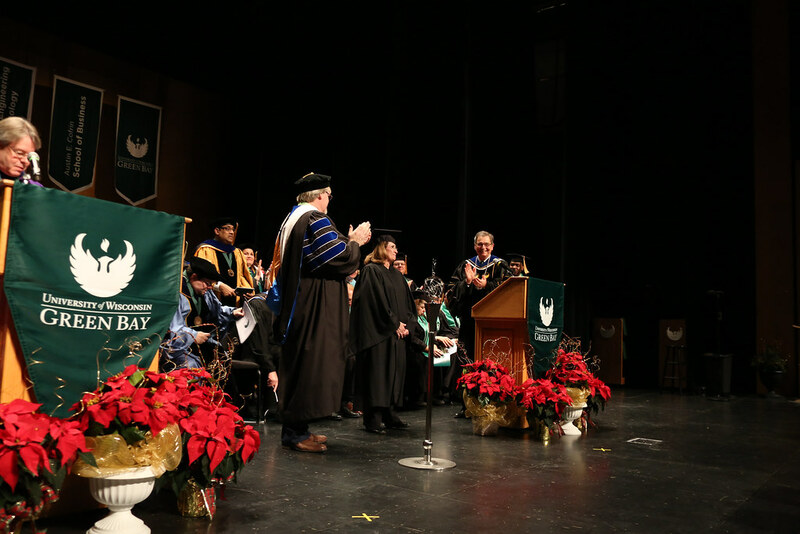 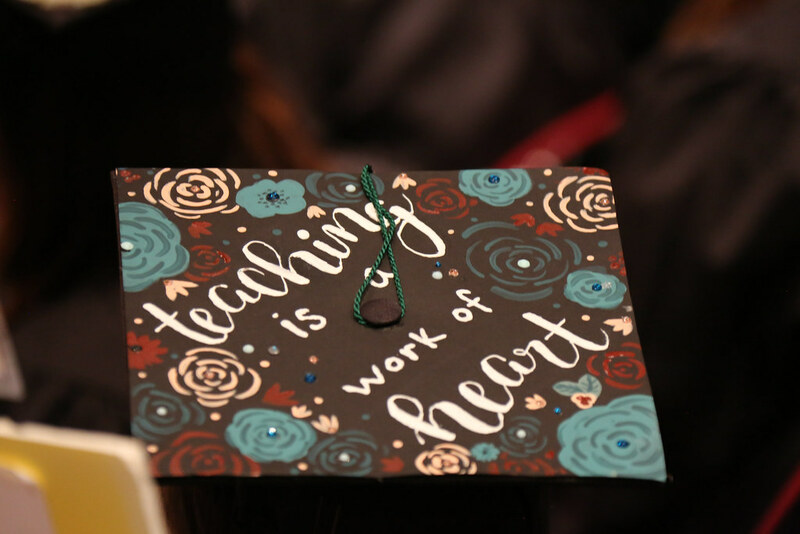 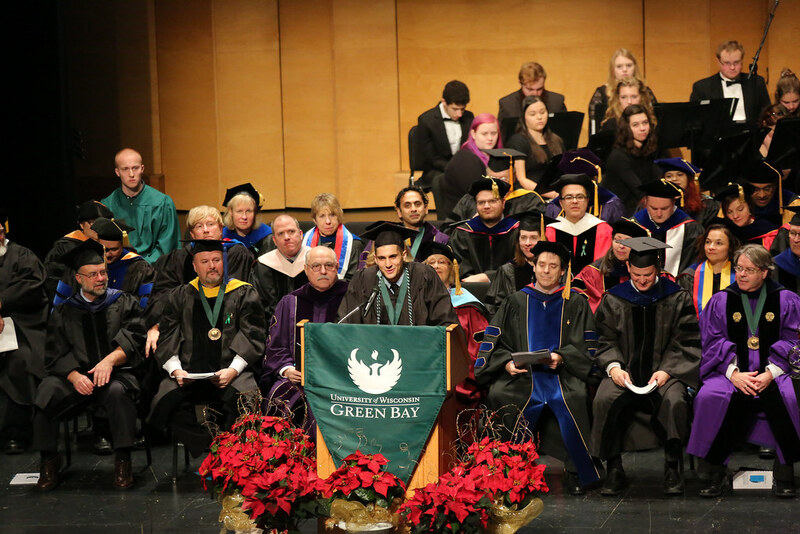 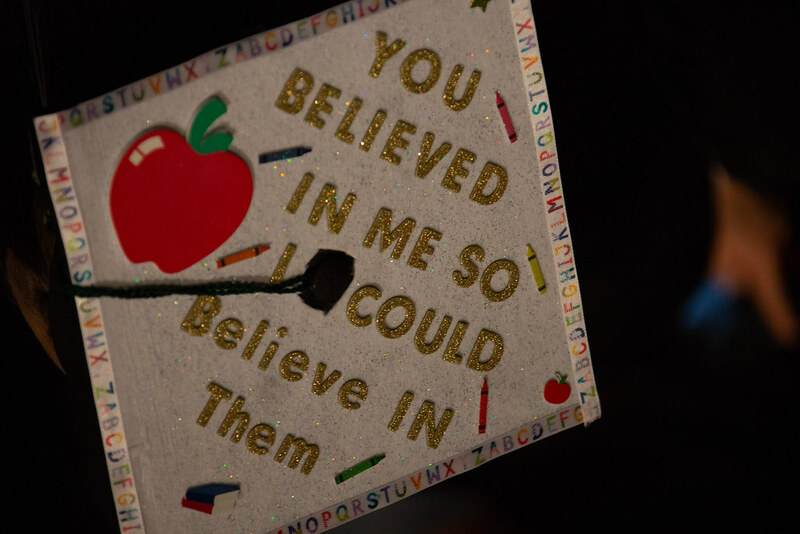 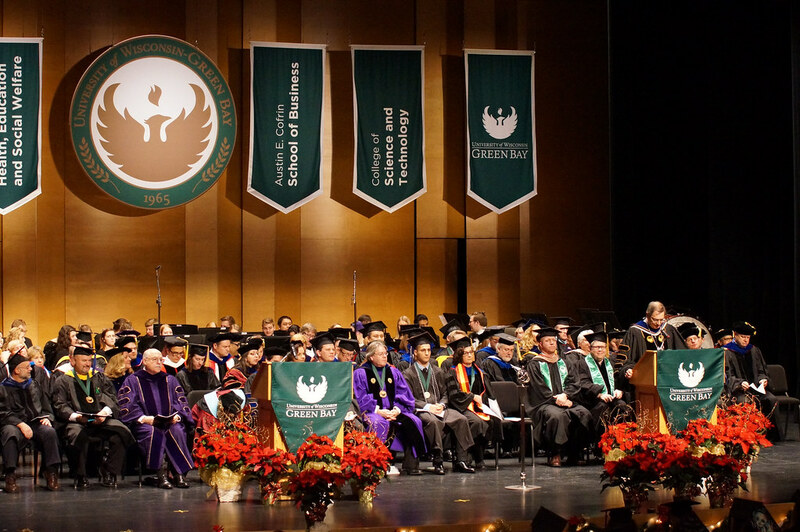 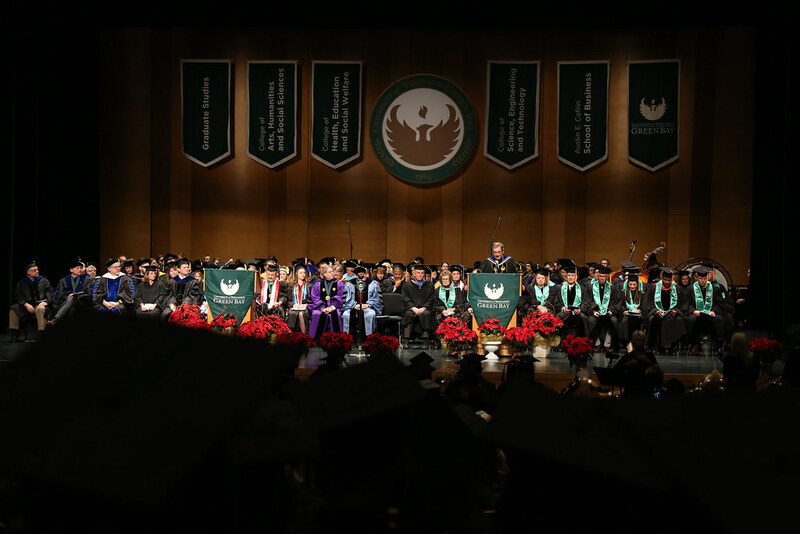 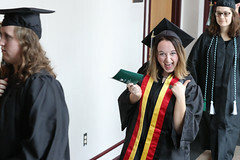 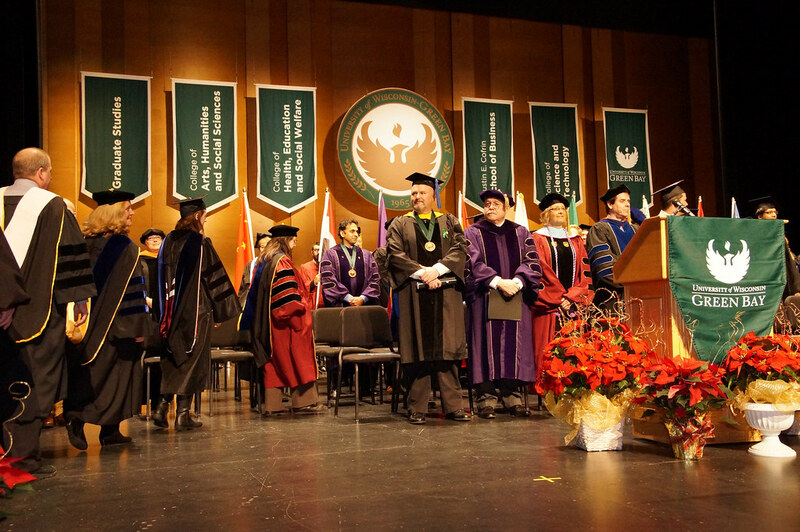 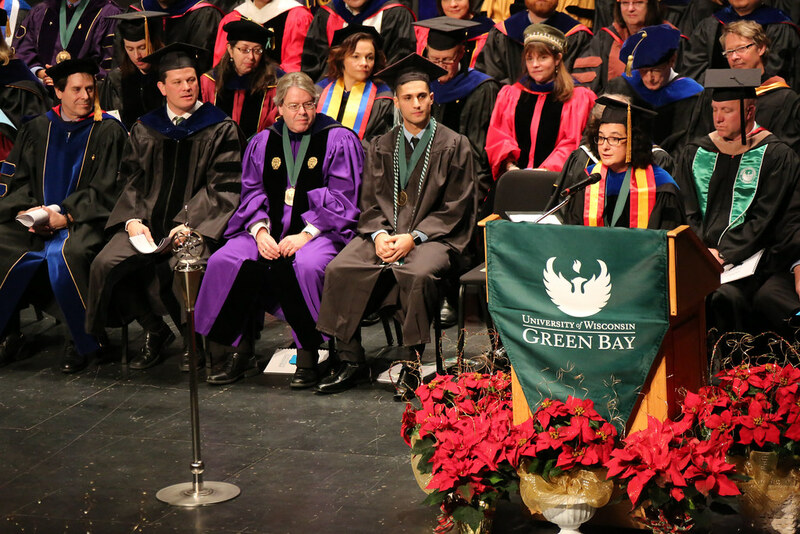 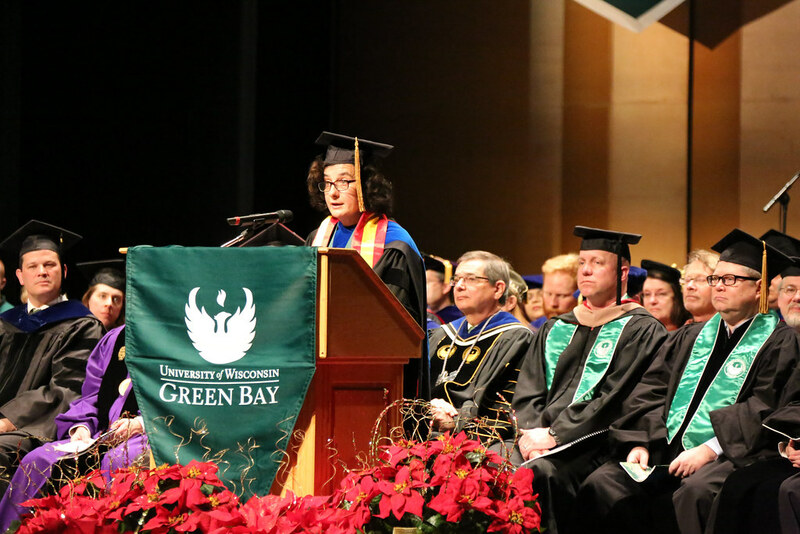 The ceremony included an inspiring and emotional commencement address from a Phuture Phoenix graduate who defied the odds to earn his degree and words of advice for the graduating class from popular UW-Green Bay Psychology Professor Reagan Gurung. 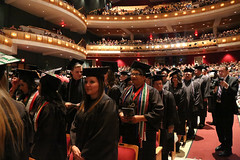 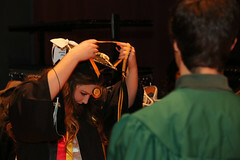 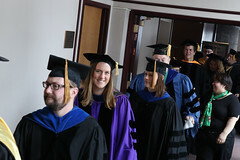 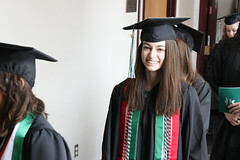 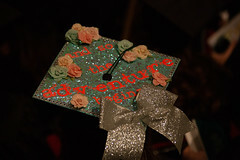 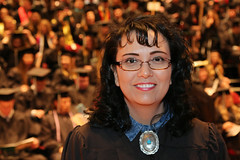 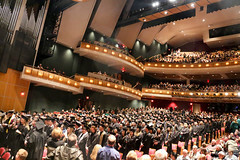 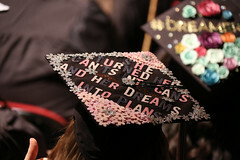 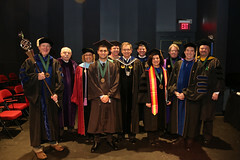 Graduates travelled from coast to coast to walk in the ceremony, including Connecticut and Los Angeles, California. 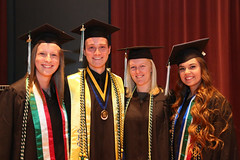 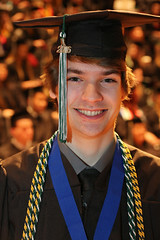 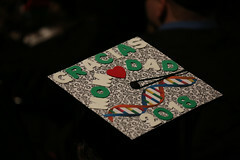 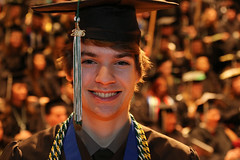 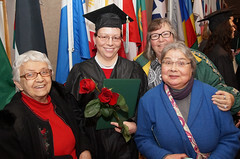 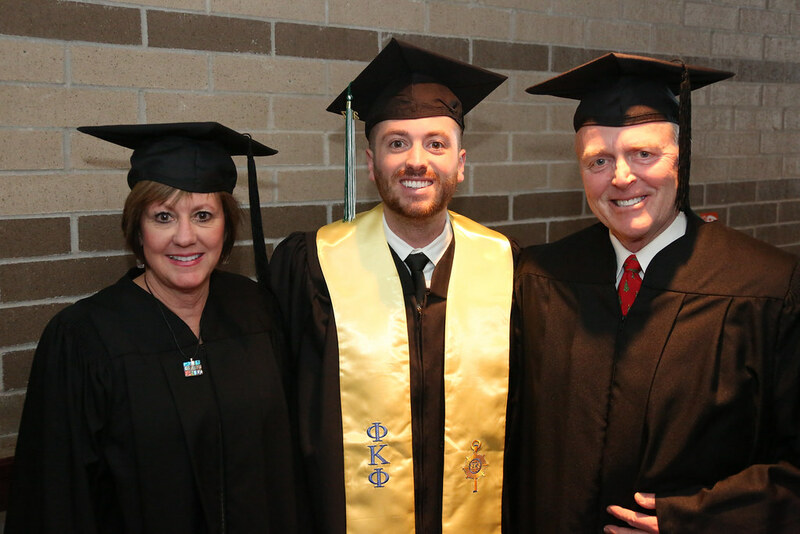 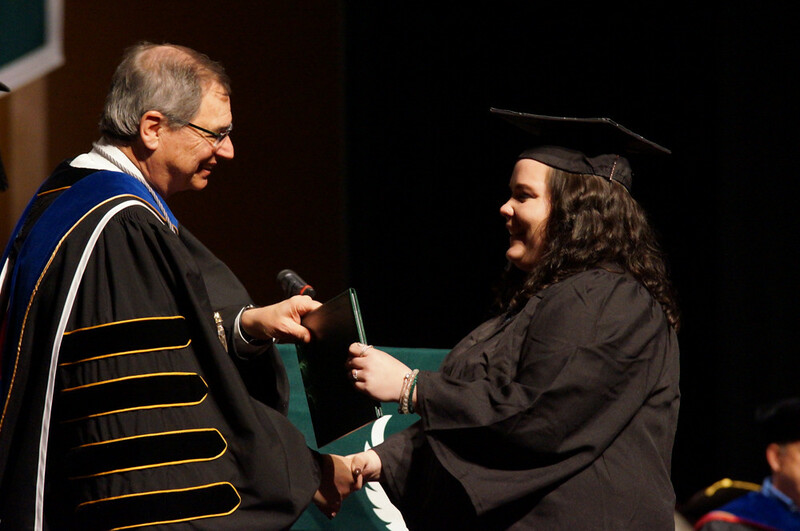 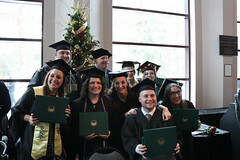 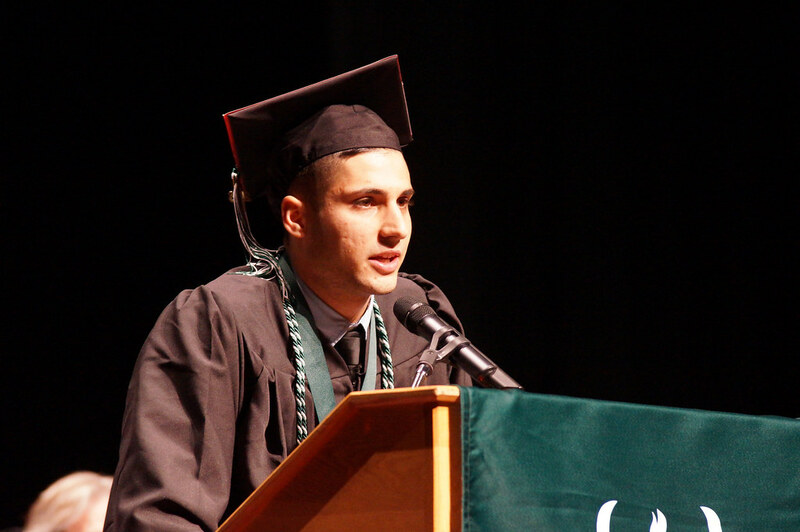 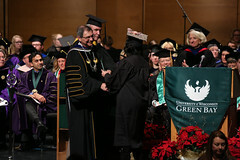 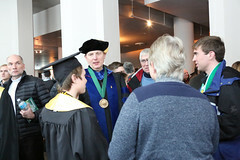 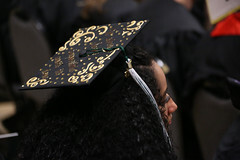 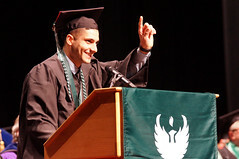 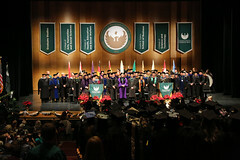 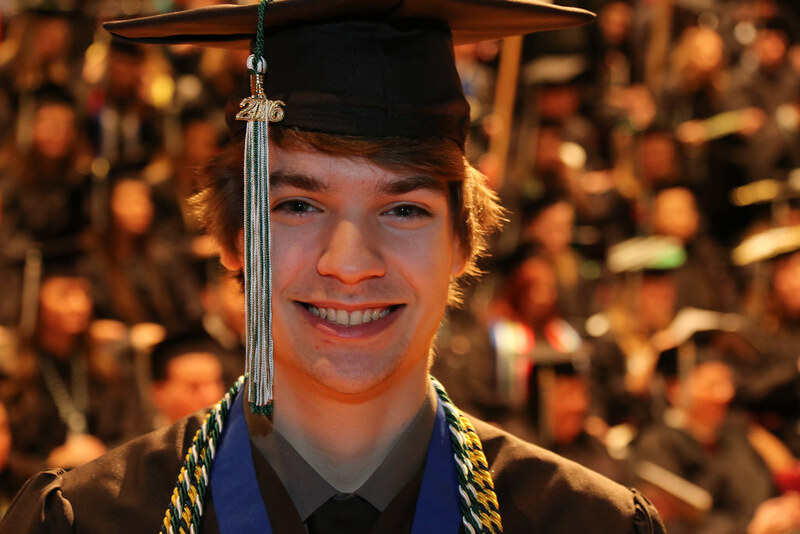 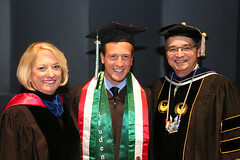 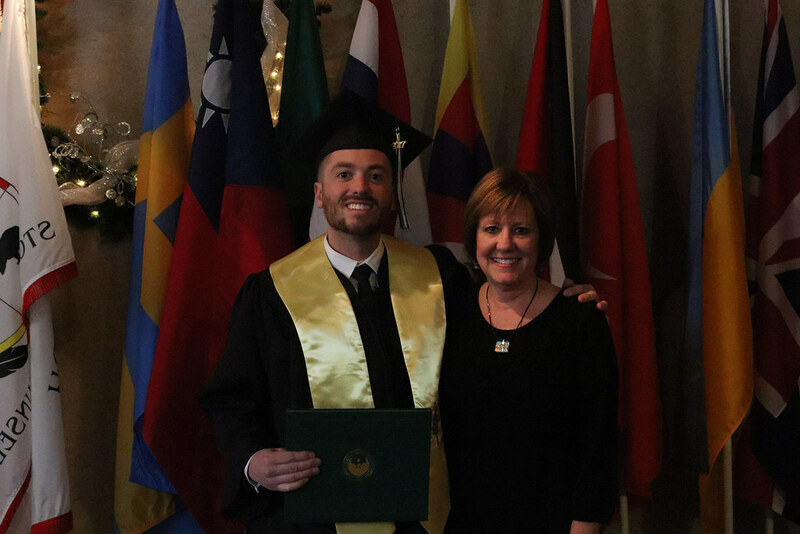 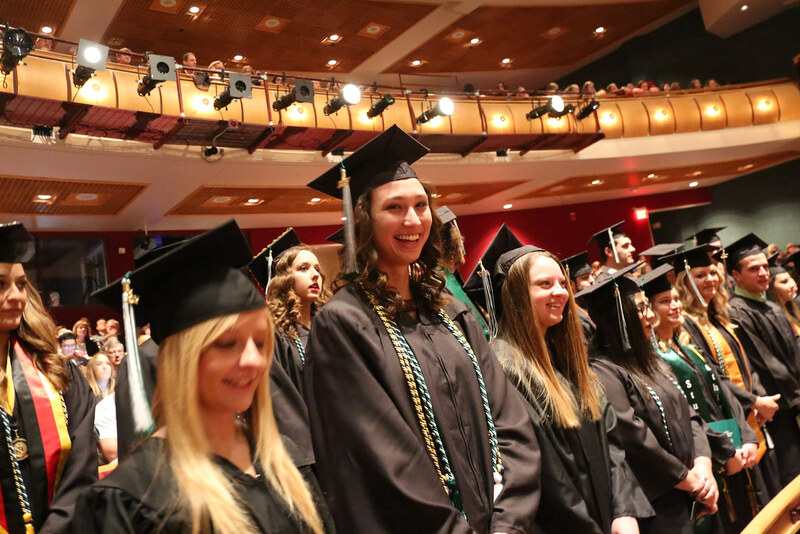 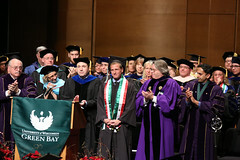 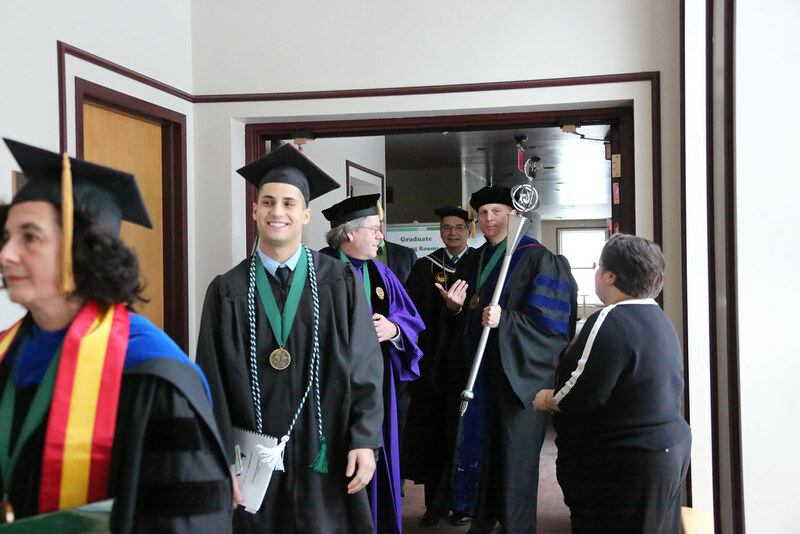 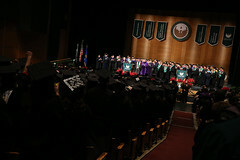 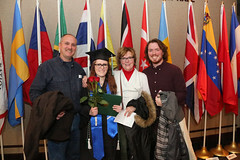 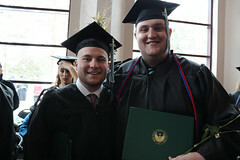 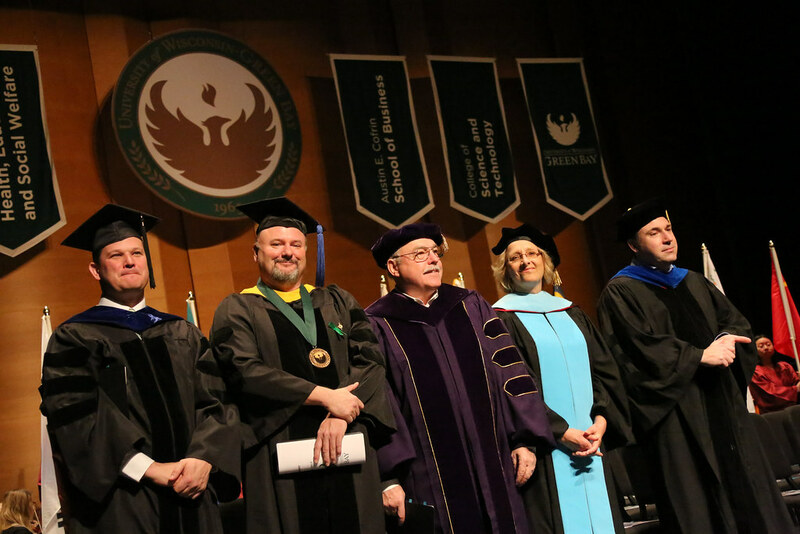 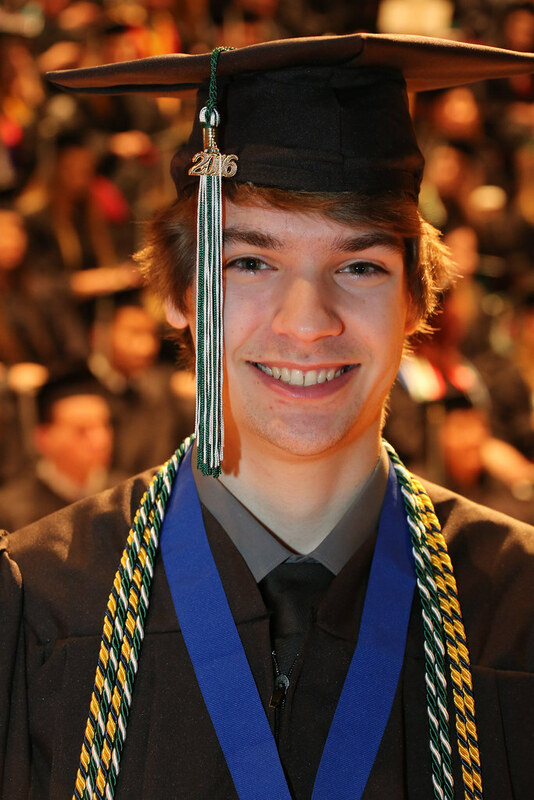 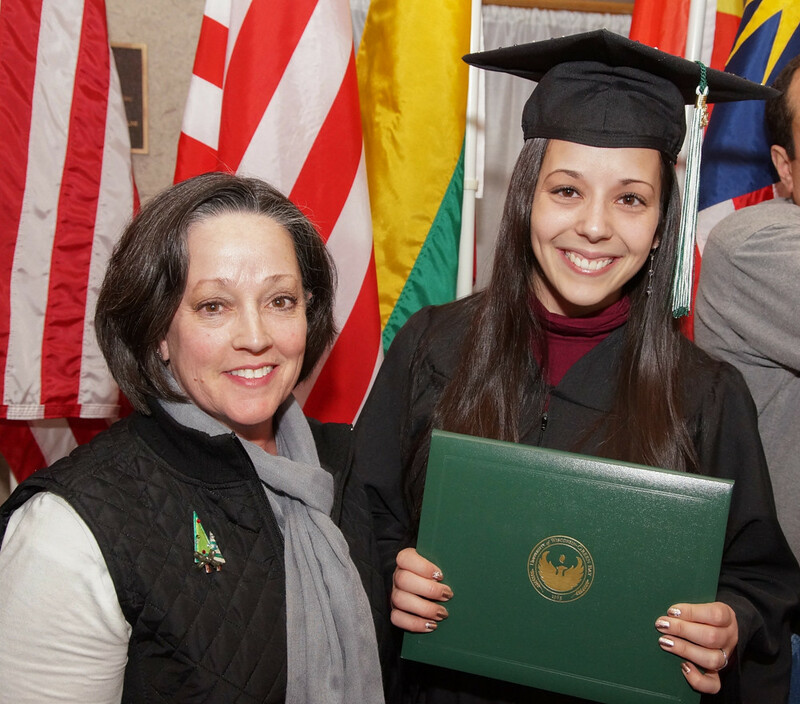 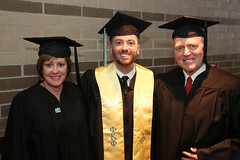 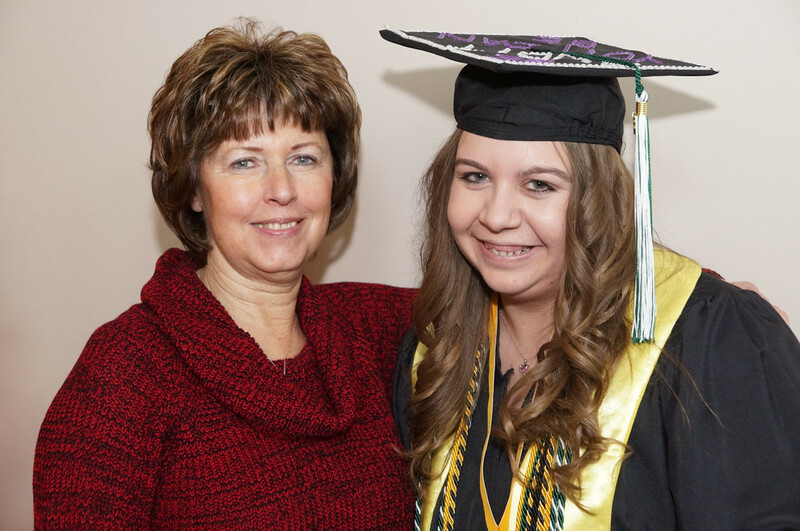 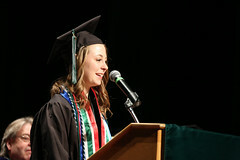 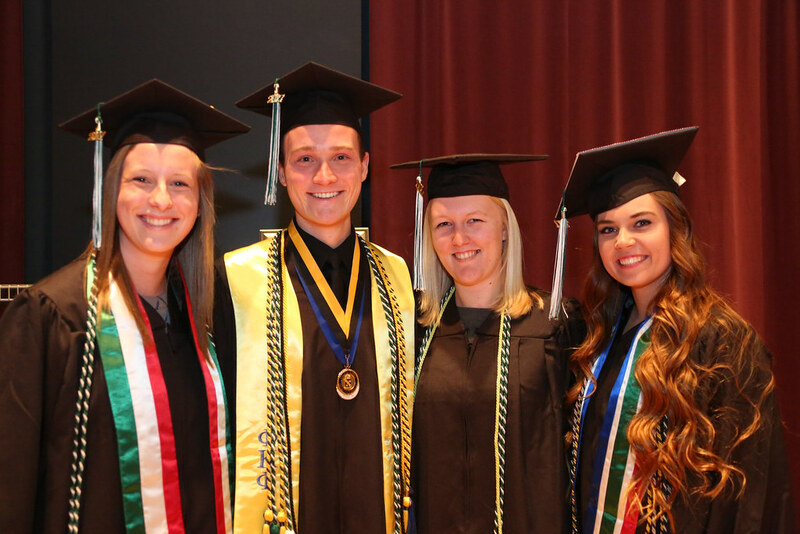 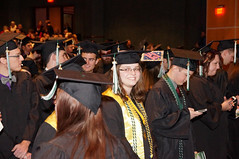 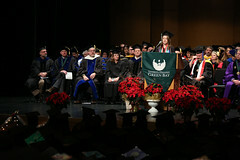 The Commencement grows the UW-Green Bay Alumni Network to more than 36,000 worldwide. 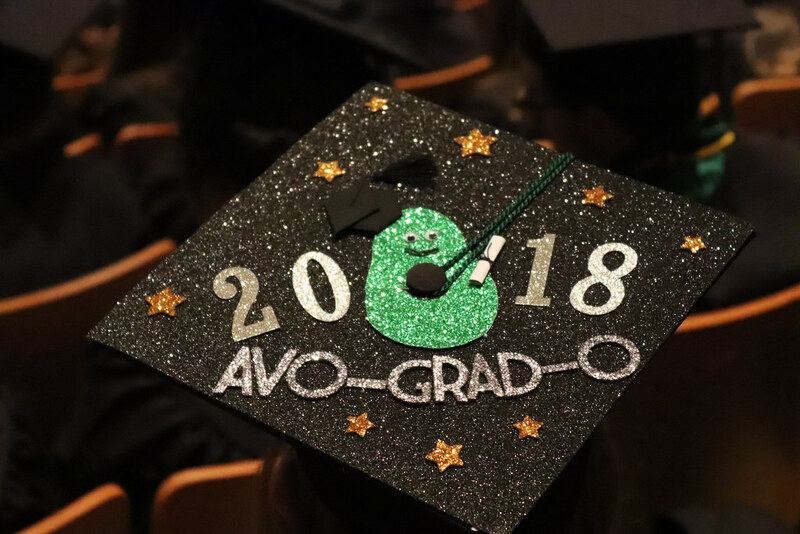 Congratulations, Class of 2017. 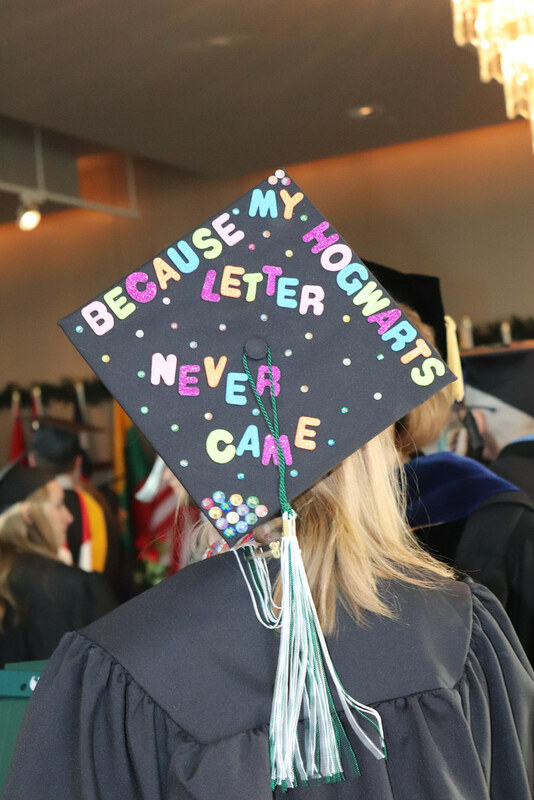 May the force of your knowledge and education always be with you! 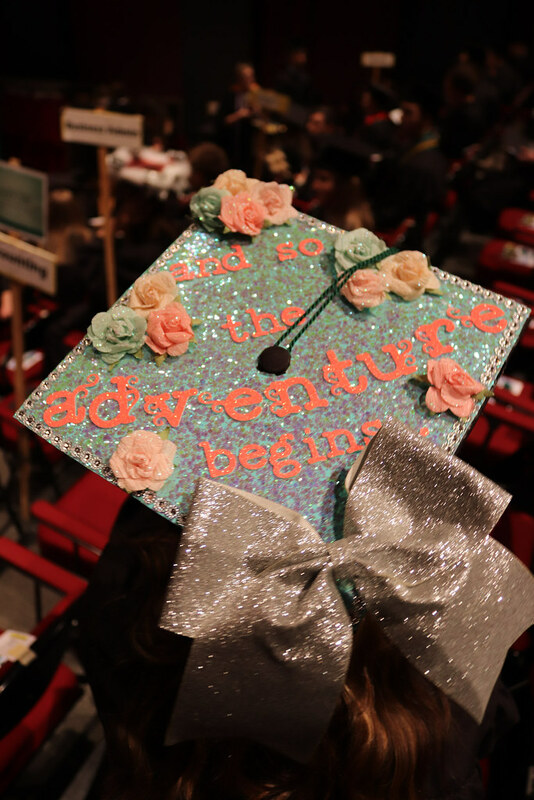 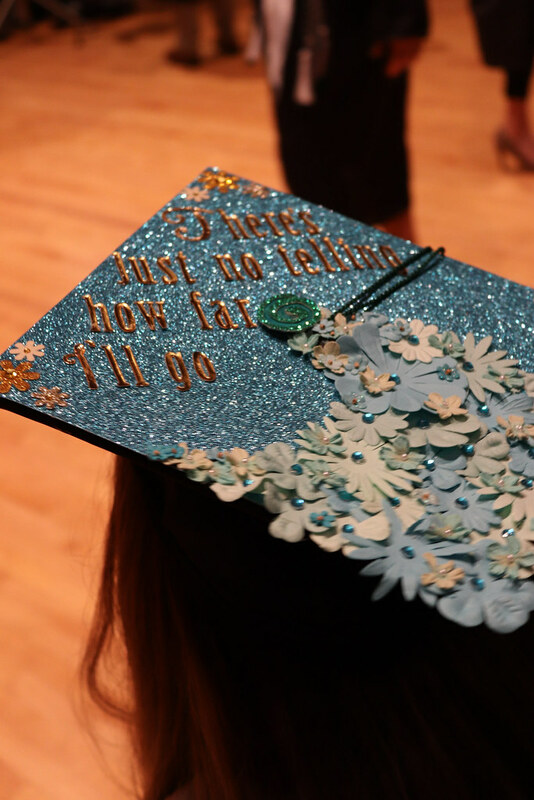 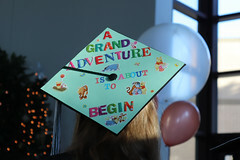 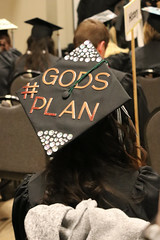 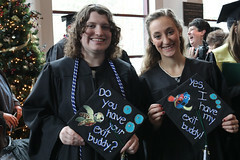 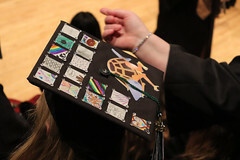 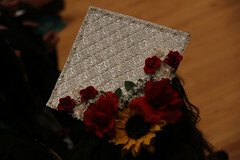 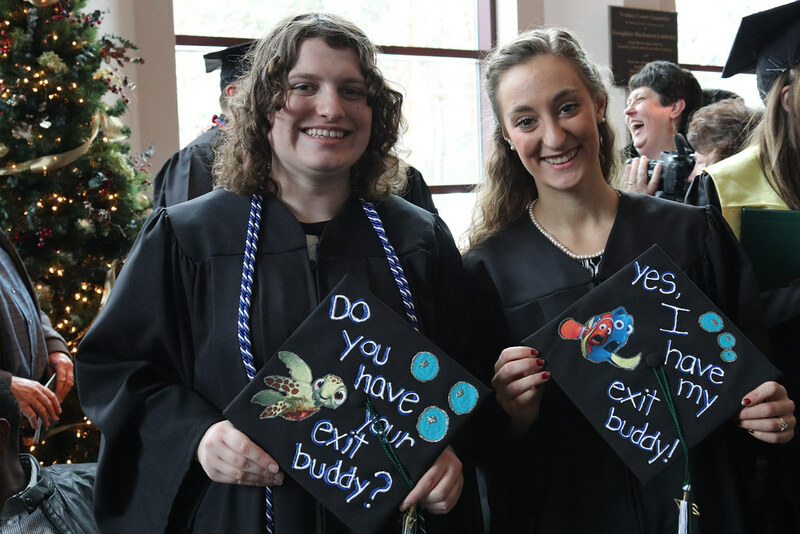 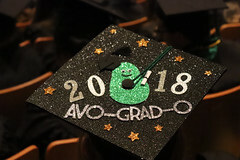 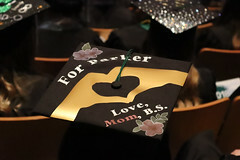 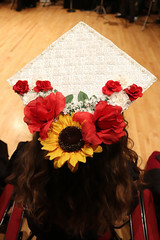 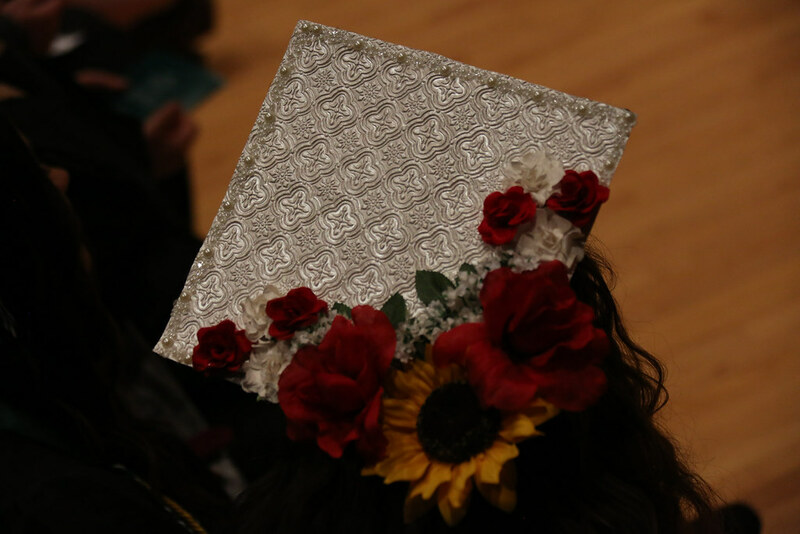 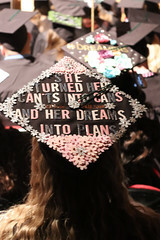 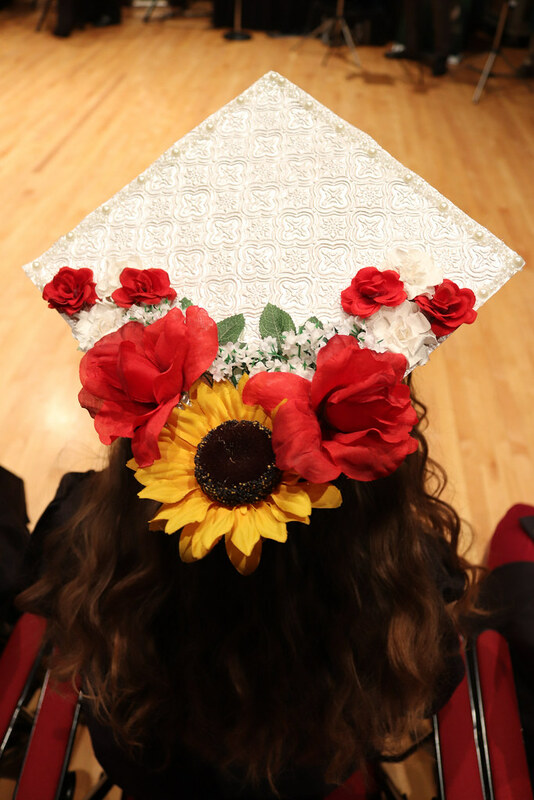 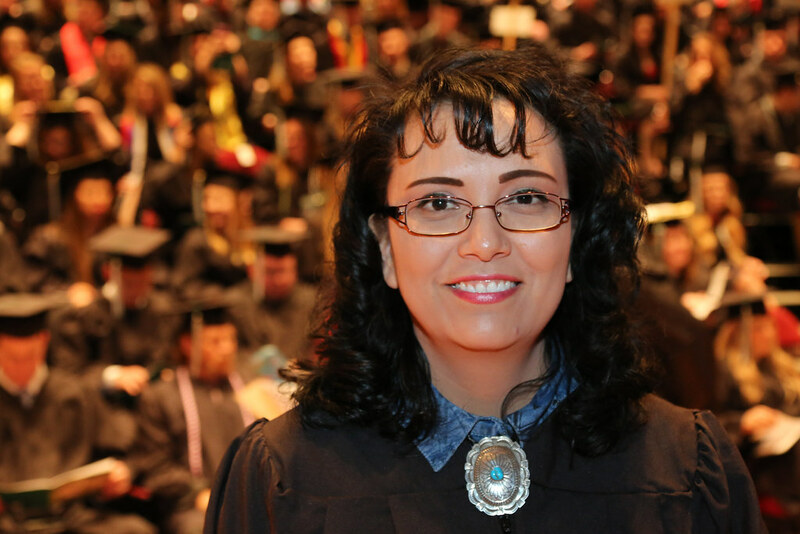 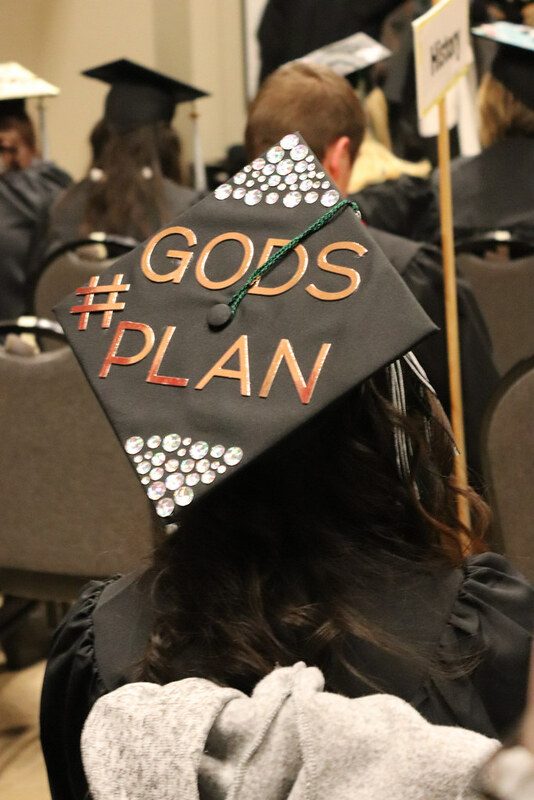 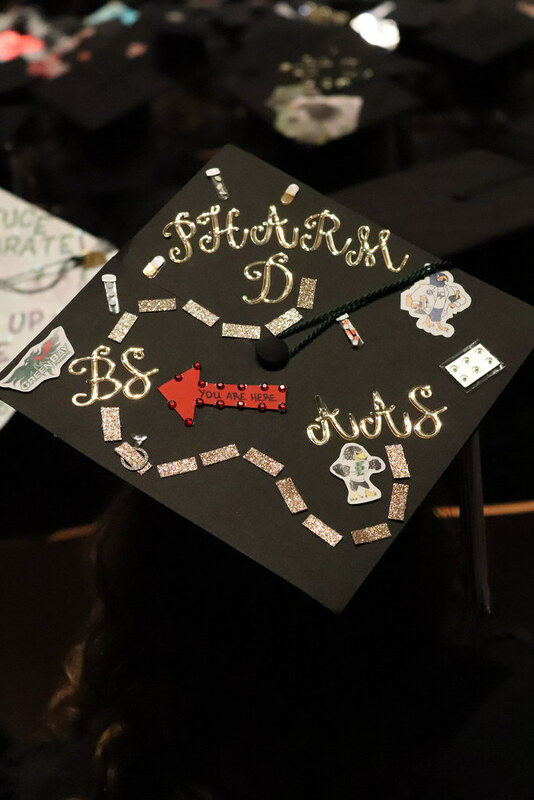 This entry was posted in Close-ups and tagged commencement, Photos on December 16, 2017 by Janet Bonkowski. 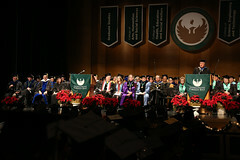 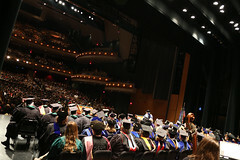 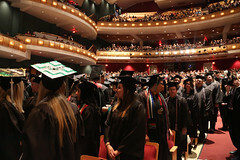 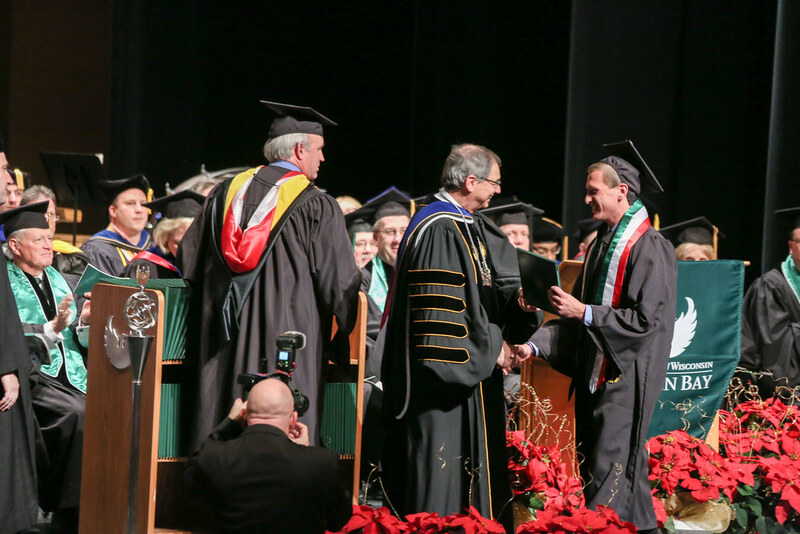 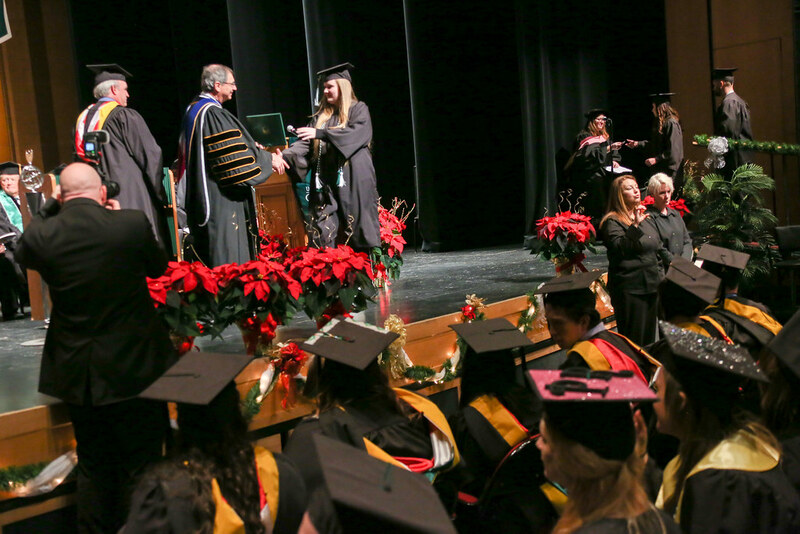 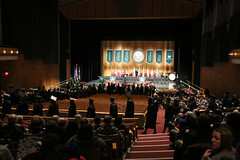 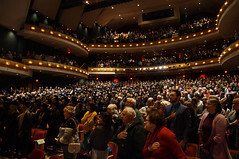 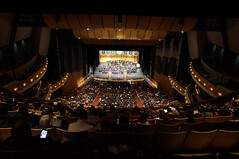 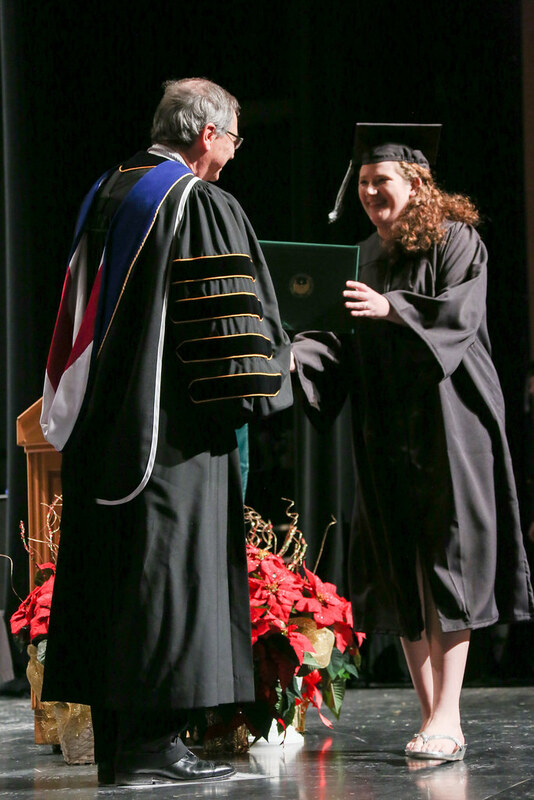 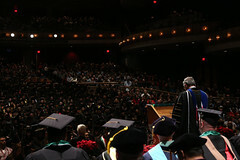 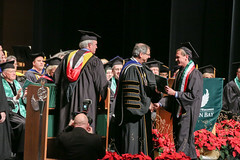 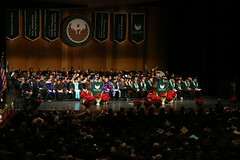 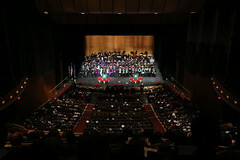 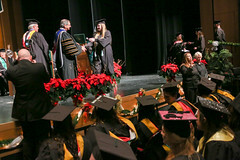 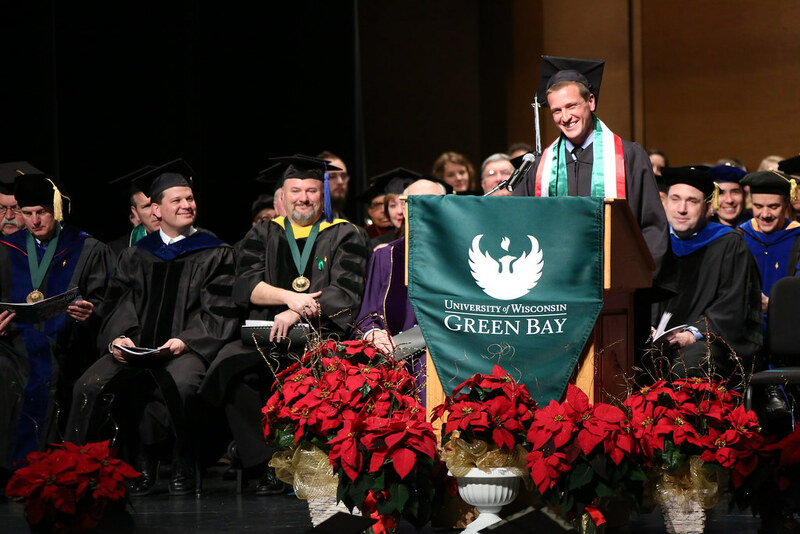 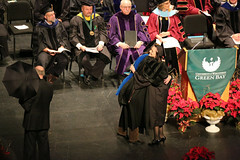 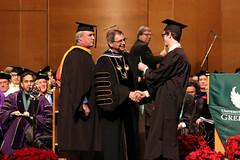 With snow continuing to fall and creating a winter wonderland backdrop, the University of Wisconsin-Green Bay held its 94th commencement ceremony Saturday, December 17 at the University’s Weidner Center for the Performing Arts. 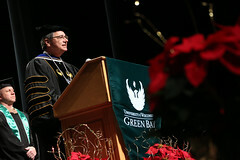 “At UW-Green Bay this is not a winter day. 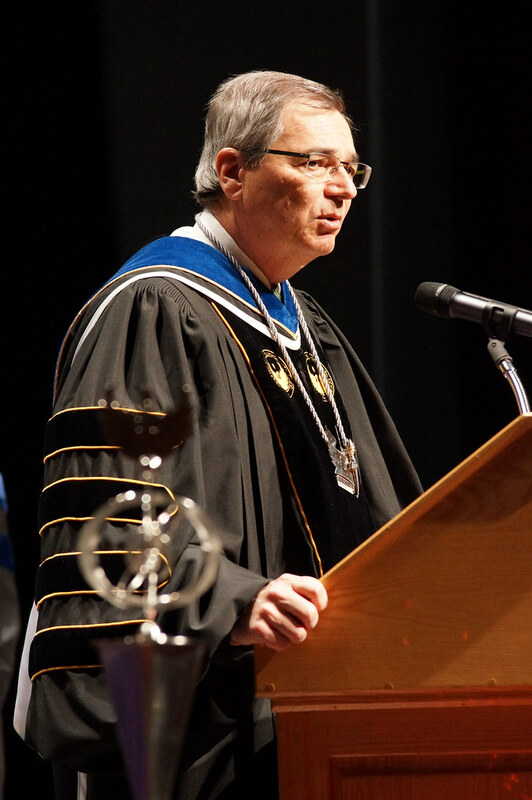 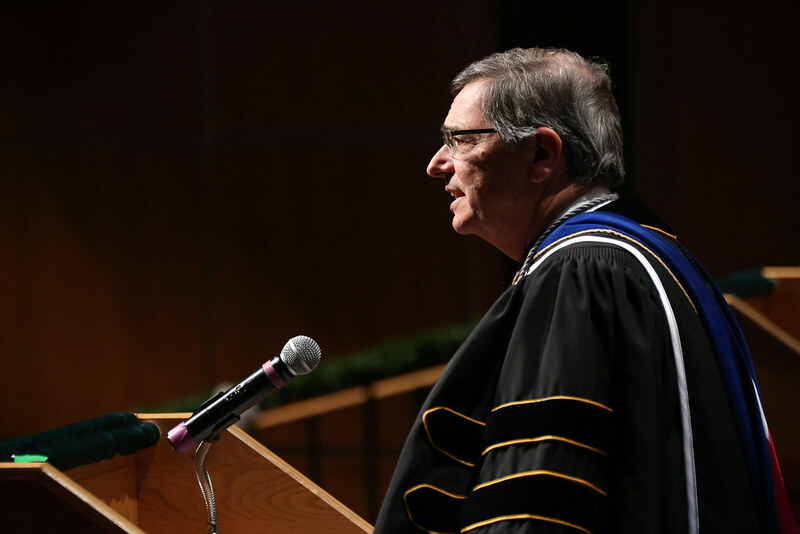 It’s commencement day,” Chancellor Gary L. Miller said when asked about the weather and the University’s confidence in moving forward with graduation despite weather conditions. 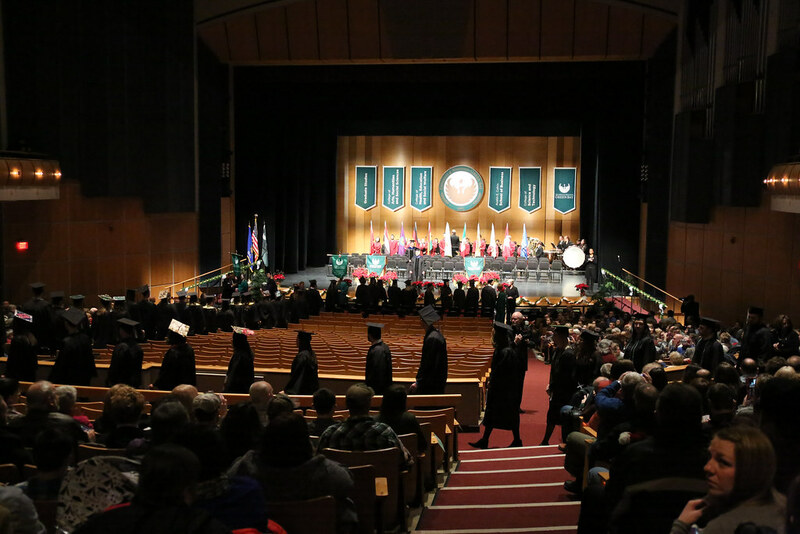 With up to eight inches of snow falling in the 24 hours leading up to graduation, winter weather and its impact on commencement had been the discussion of administrators and students alike in recent days. According to commencement planners, approximately two dozen of the 315 students registered and expected to graduate did not attend ceremonies. 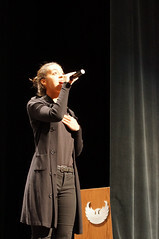 It is unclear what impact the weather played in those no-shows. 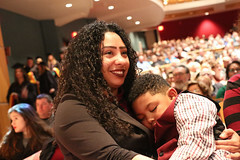 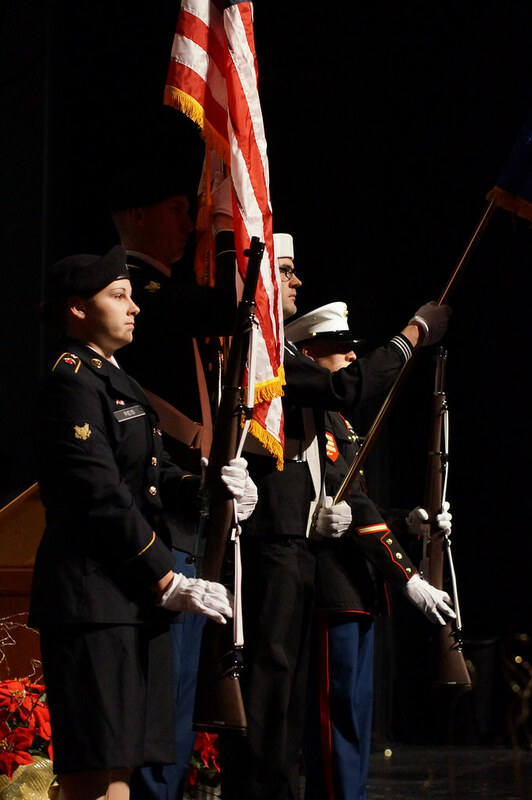 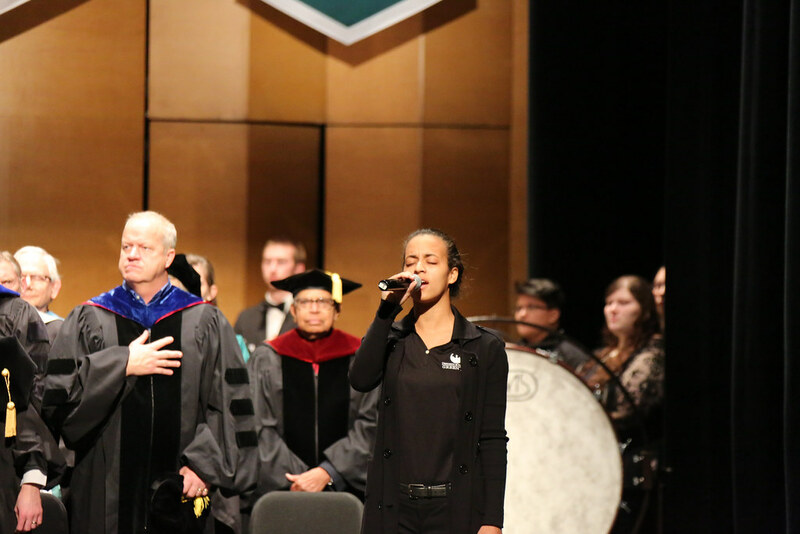 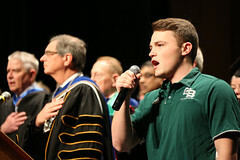 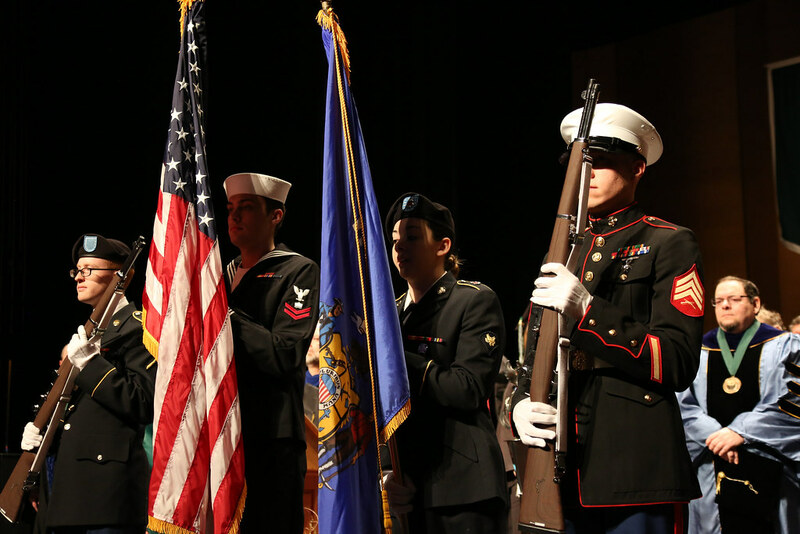 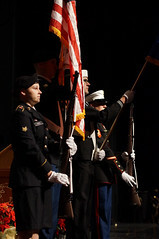 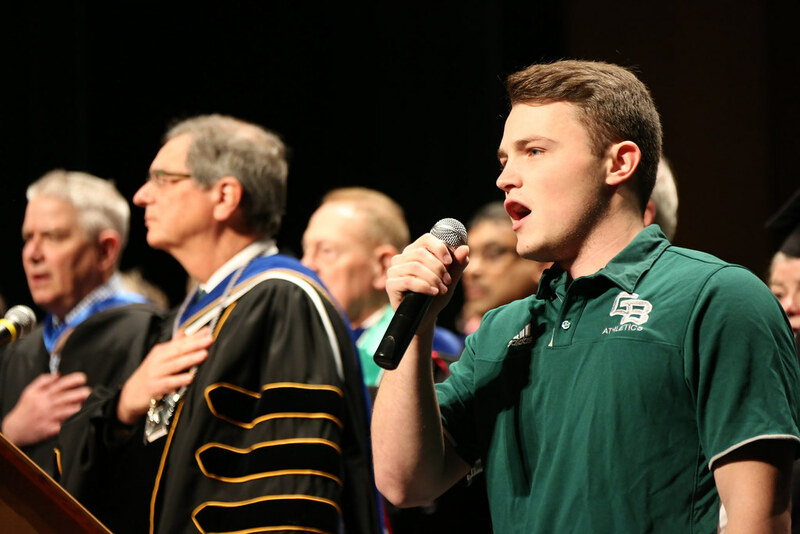 The celebration portion of Farrow’s message was not lost on students, their families and faculty in attendance and on display in this photo gallery. Congratulations to all graduates. 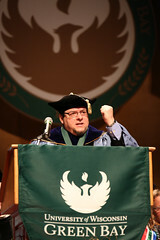 Go Phoenix! 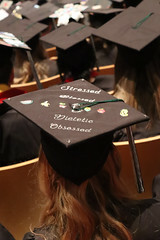 This entry was posted in Close-ups and tagged commencement, Photos, weather on December 17, 2016 by Janet Bonkowski. 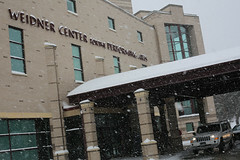 As you know, Green Bay is experiencing a winter storm this weekend, continuing through Saturday. 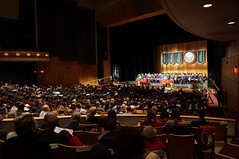 At this time, Commencement will proceed as planned. 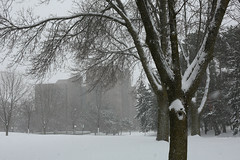 Our crews will be out early on Saturday morning to make sure that campus roads, parking lots, and sidewalks are clear. 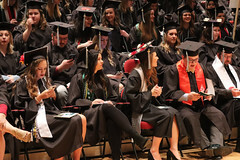 If the weather does become worse than anticipated, a decision regarding Commencement will be made by 6 a.m. Saturday with a communication to the University community as soon as possible. Consistent with our Winter Storm Policy, everyone should use their judgment about whether they can safely travel to campus. 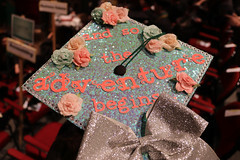 Nobody who feels it is unsafe should attempt the trip. 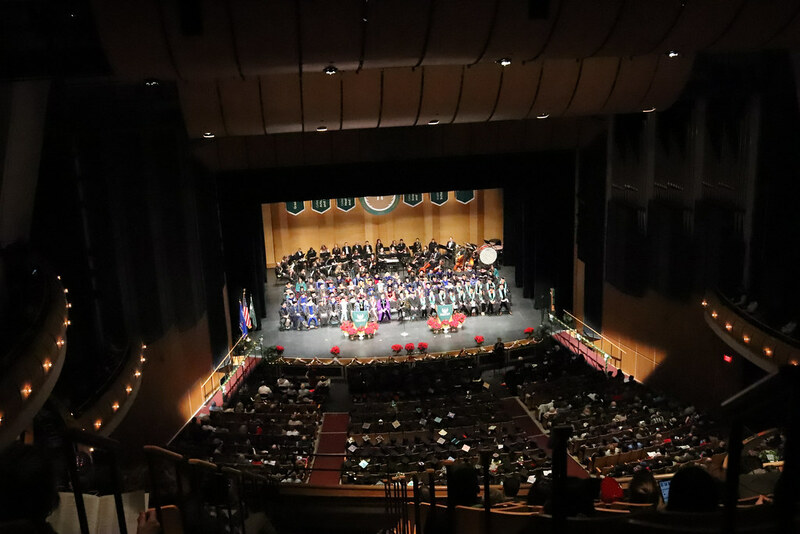 The safety of you, your parents, grandparents and others is of great concern and we encourage you to discuss with them options for participating in the event, including watching via livestream (details below). If you do not personally feel safe coming to campus on Saturday morning, please stay home. 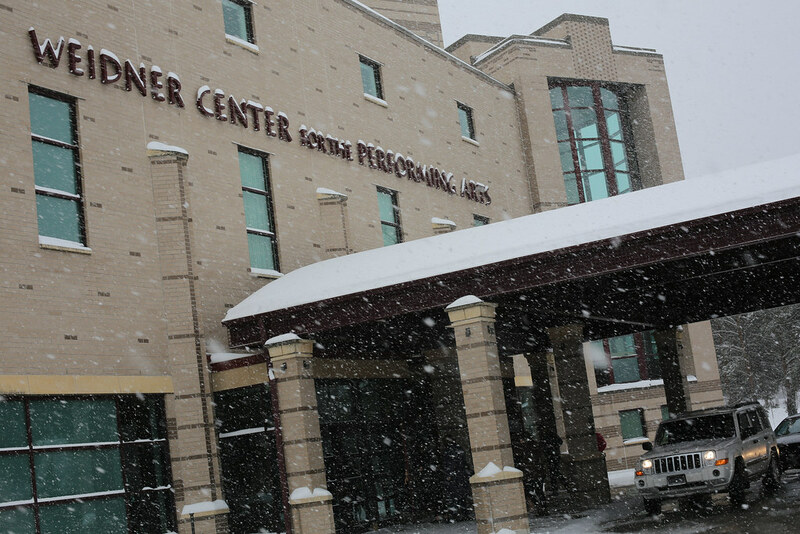 If you decide to travel to campus, please allow extra time. 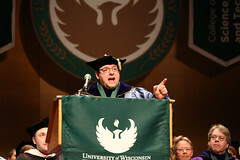 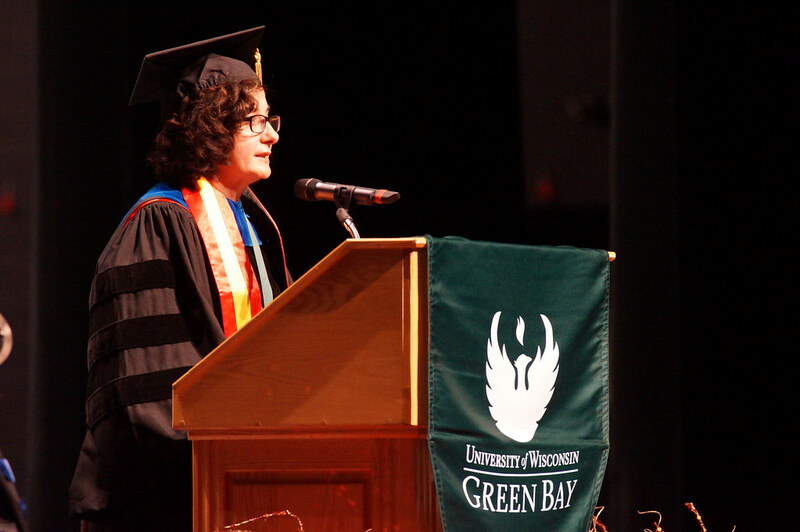 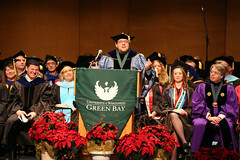 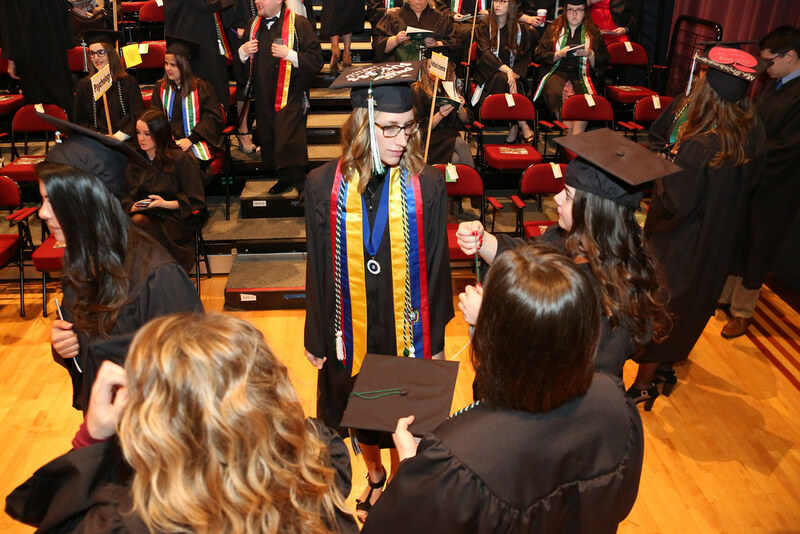 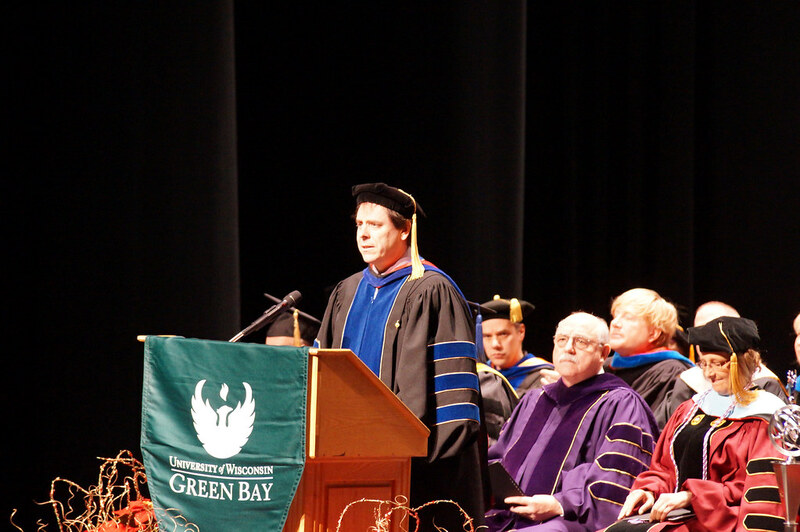 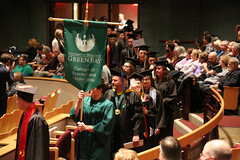 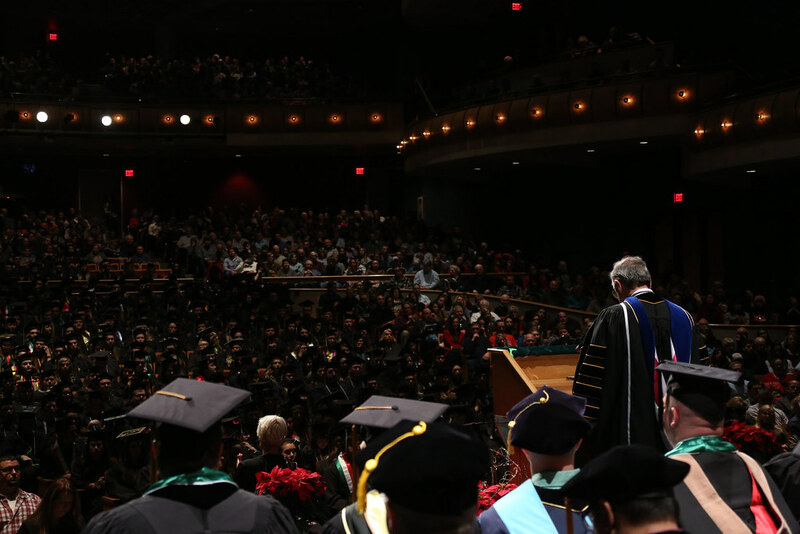 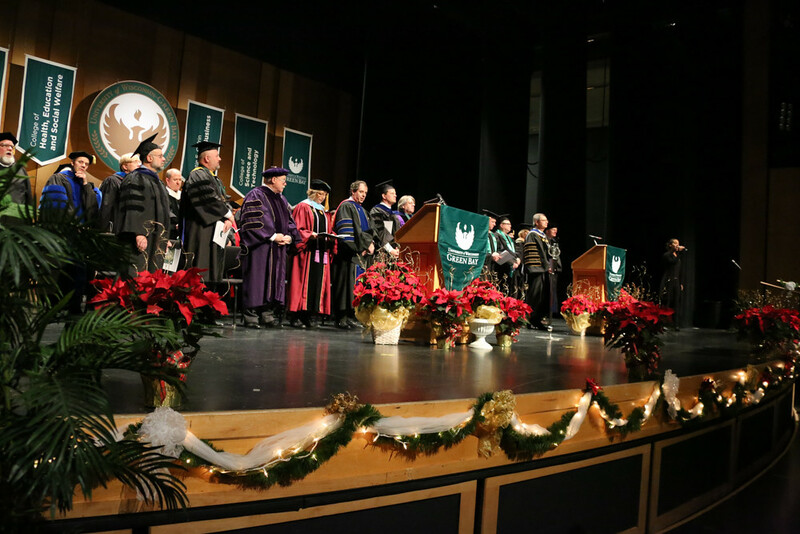 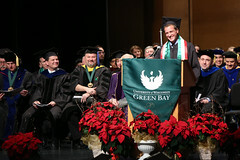 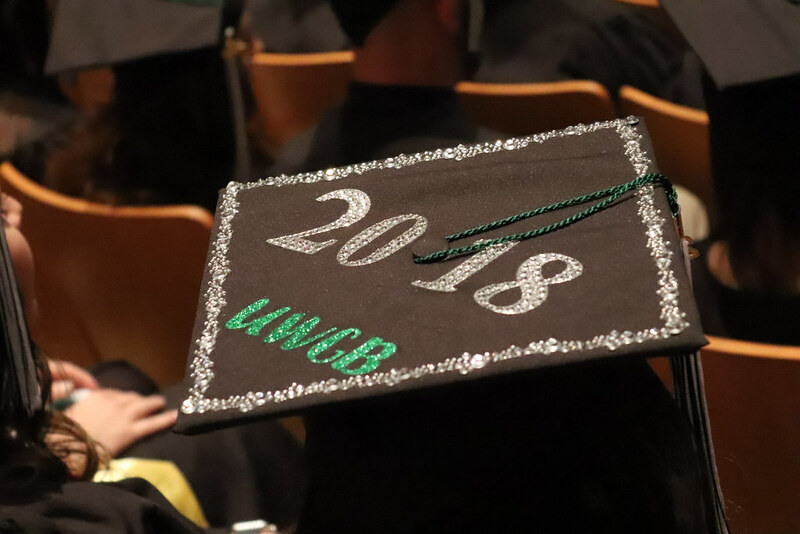 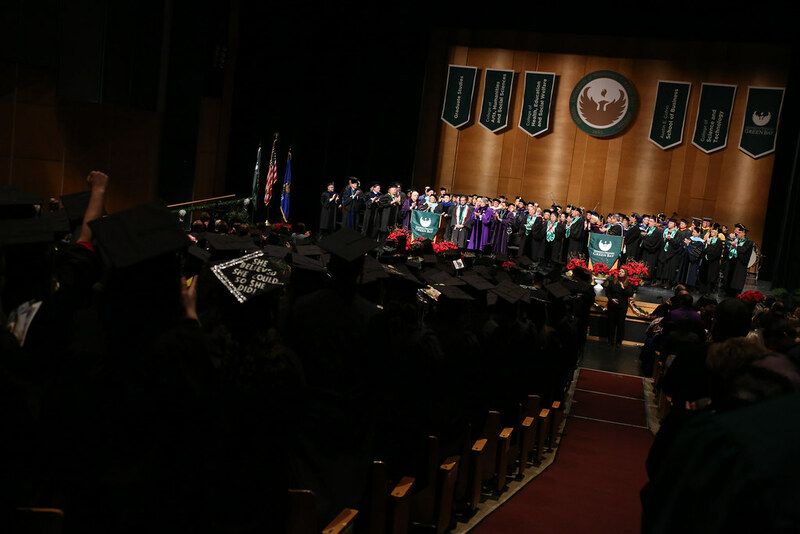 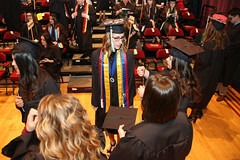 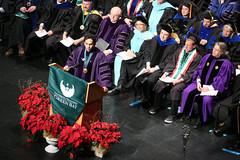 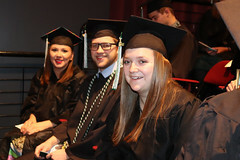 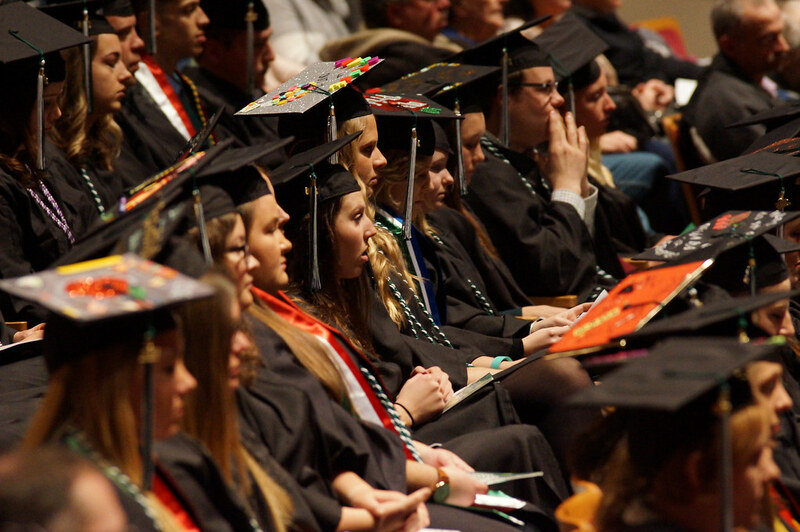 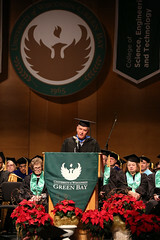 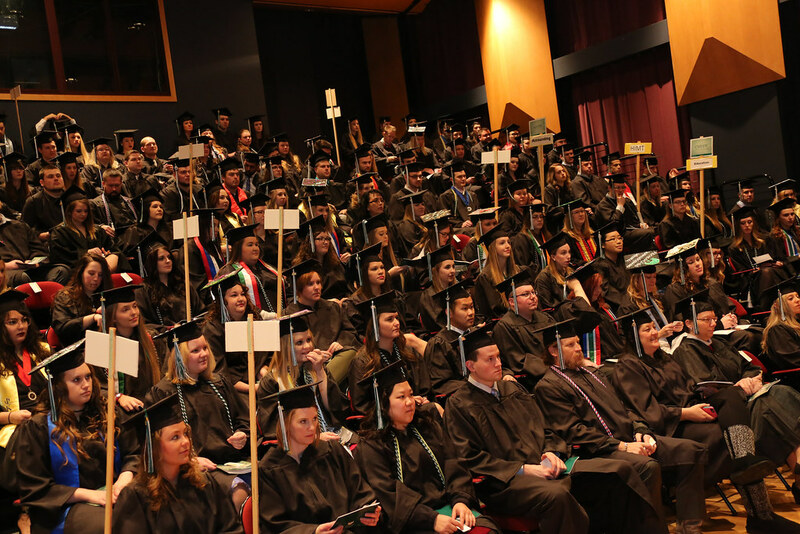 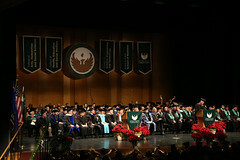 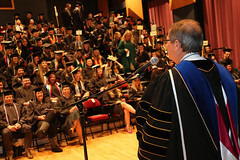 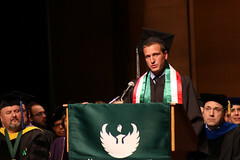 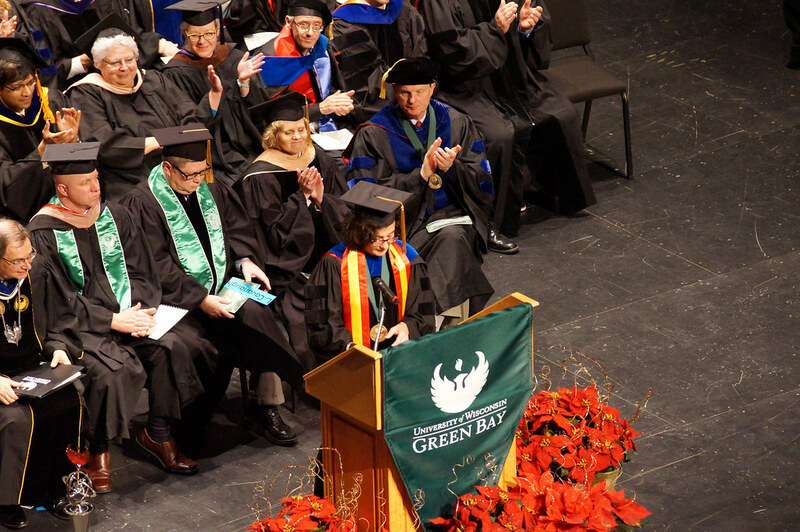 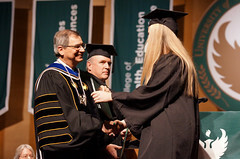 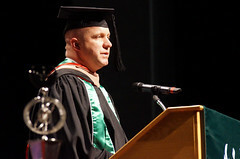 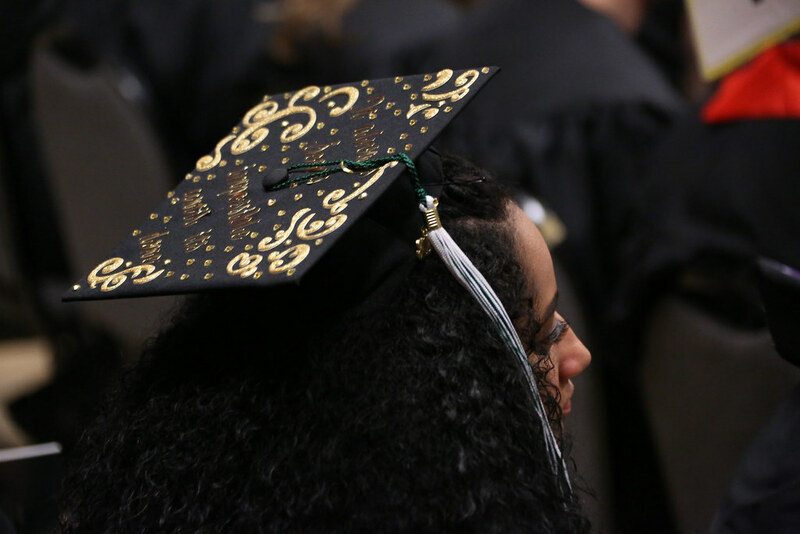 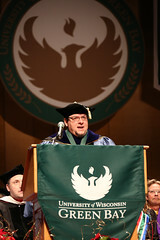 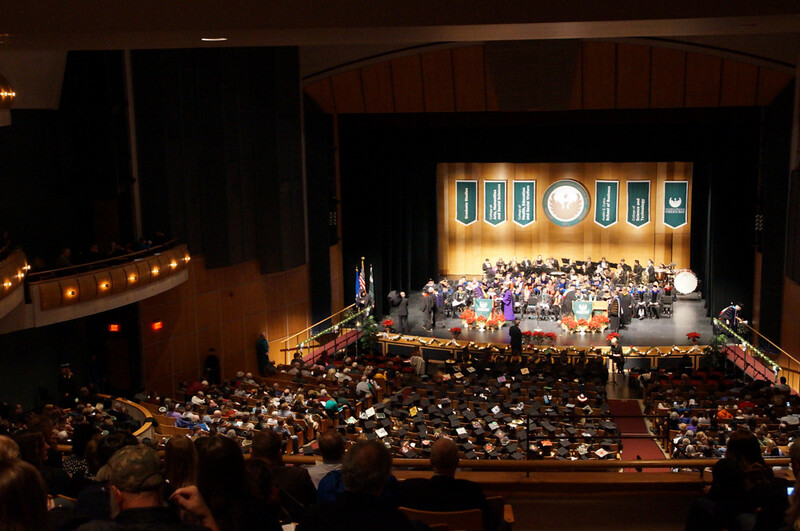 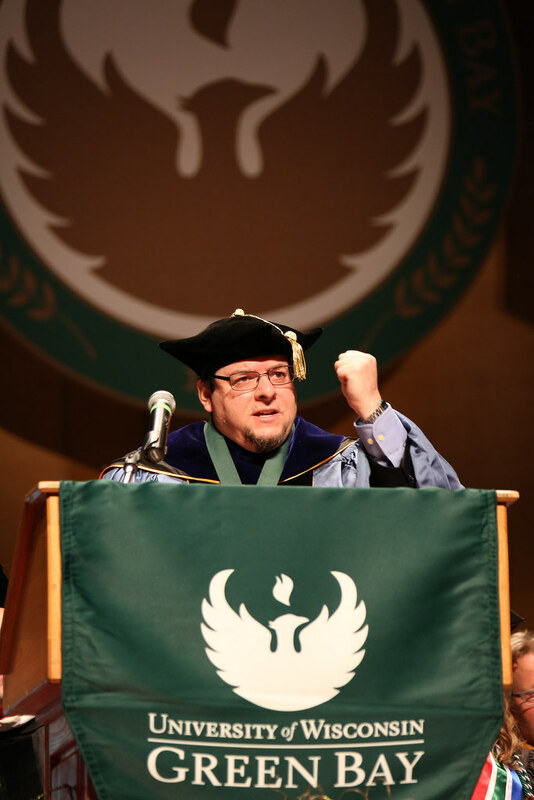 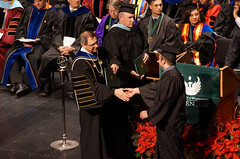 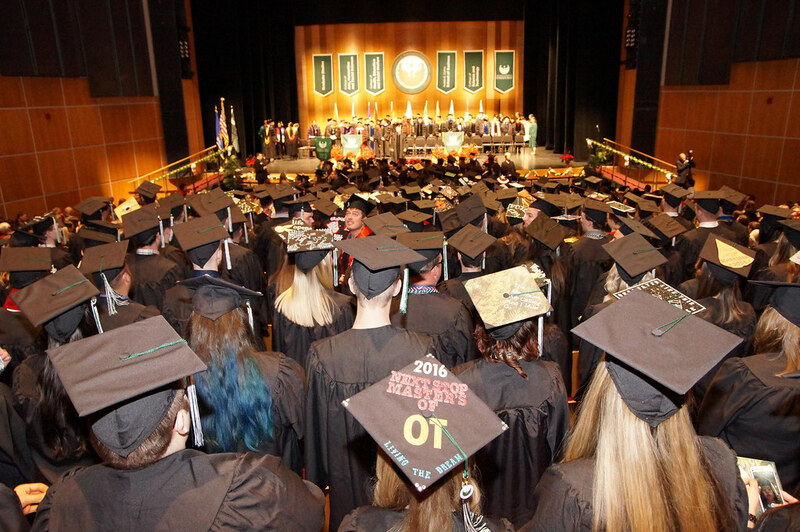 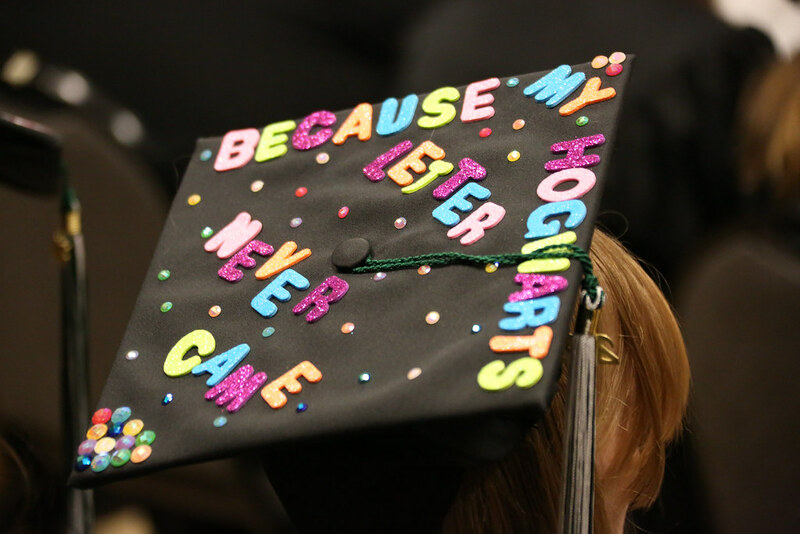 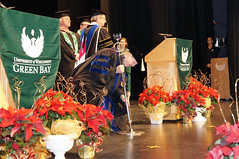 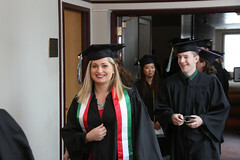 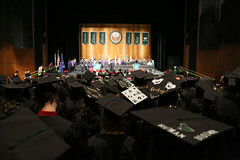 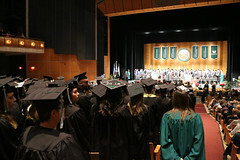 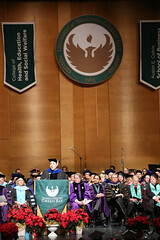 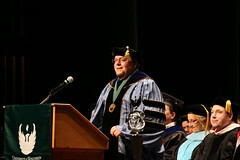 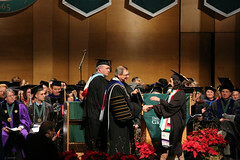 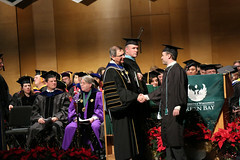 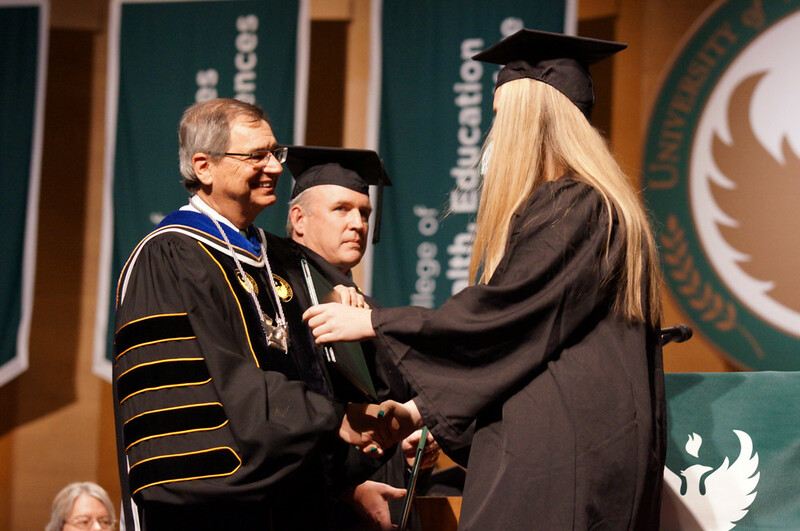 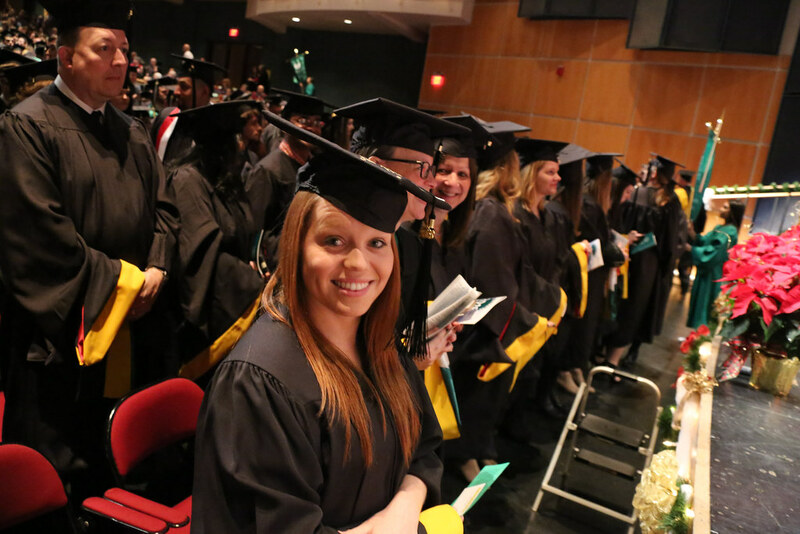 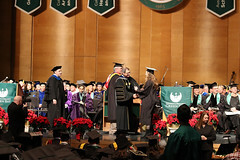 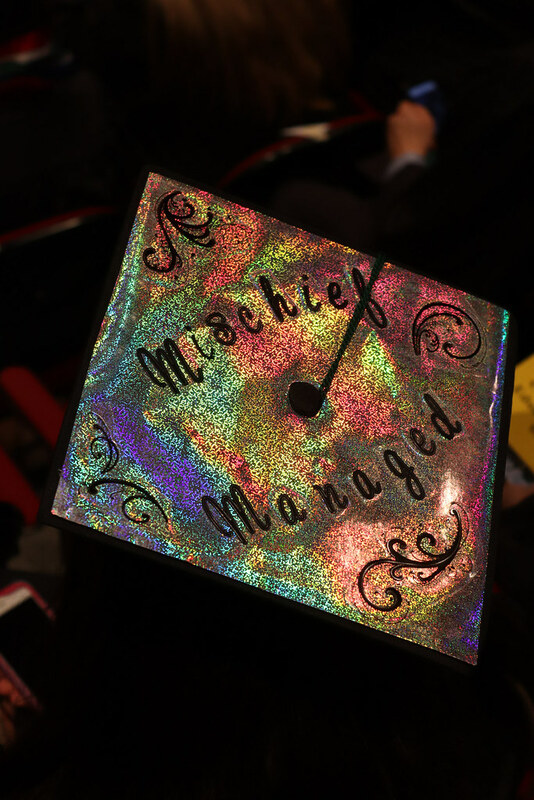 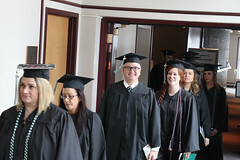 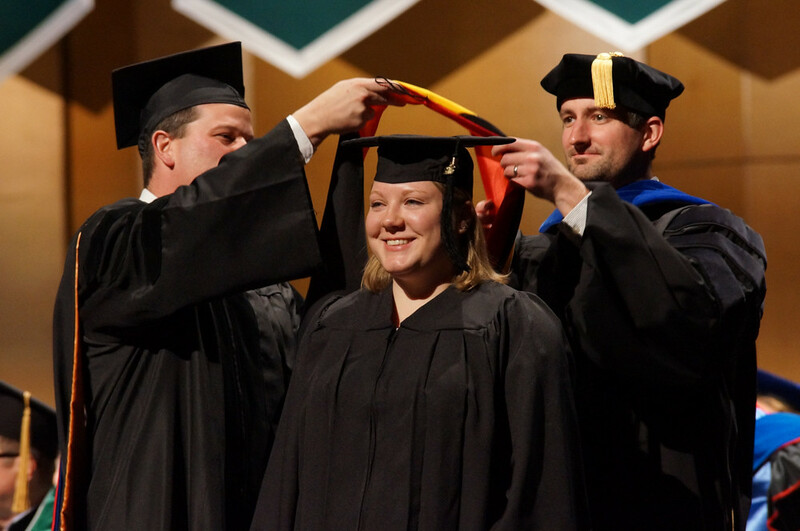 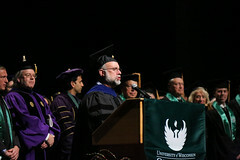 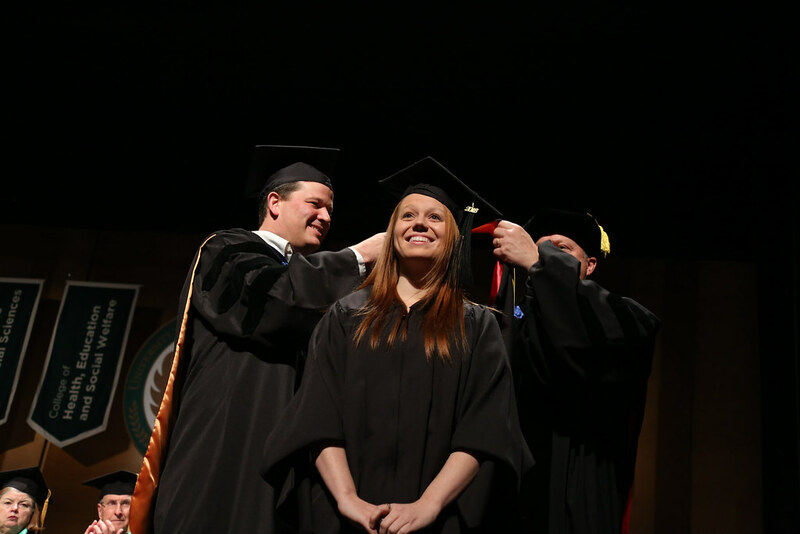 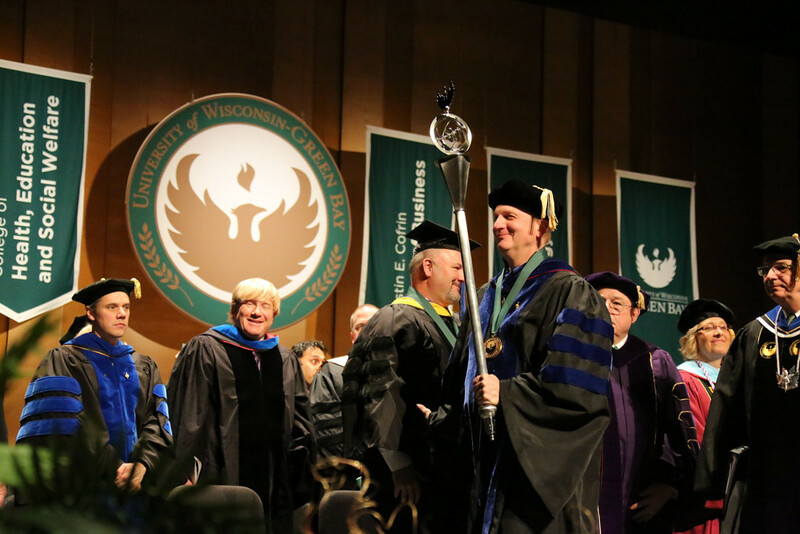 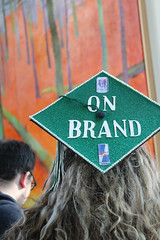 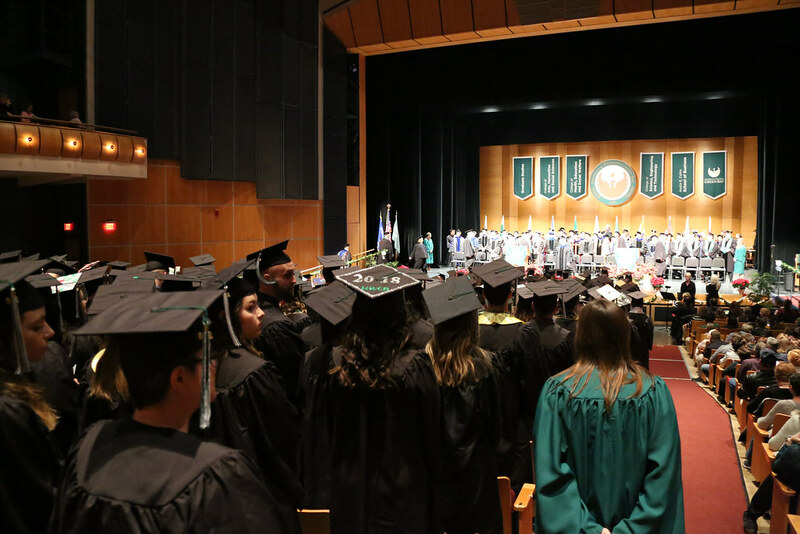 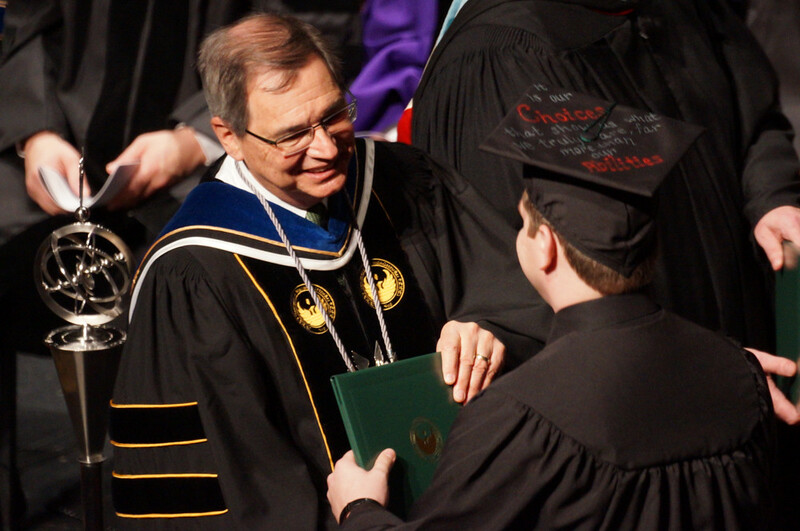 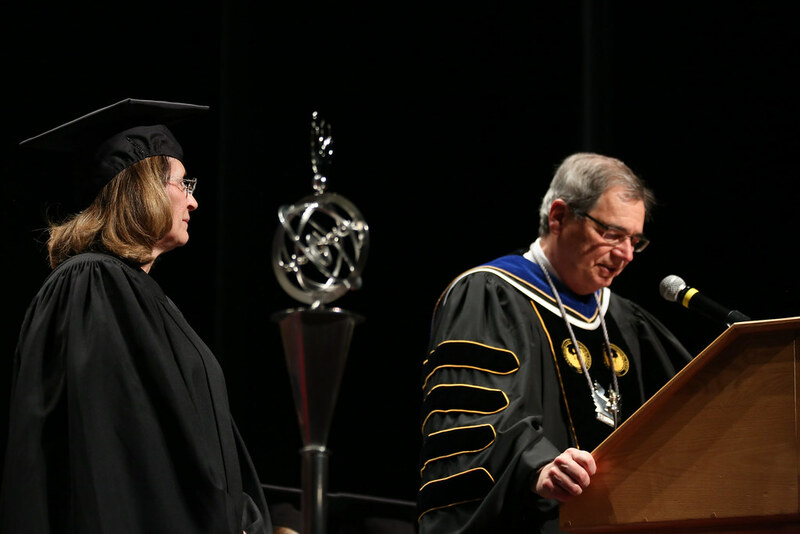 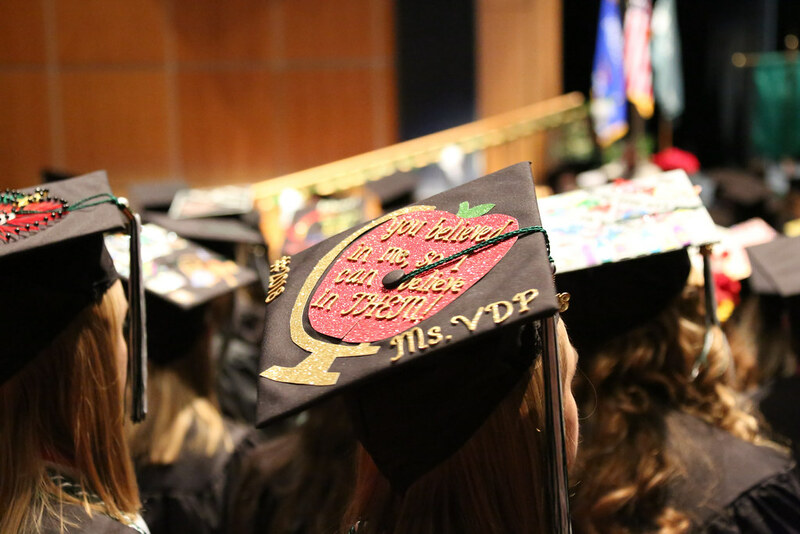 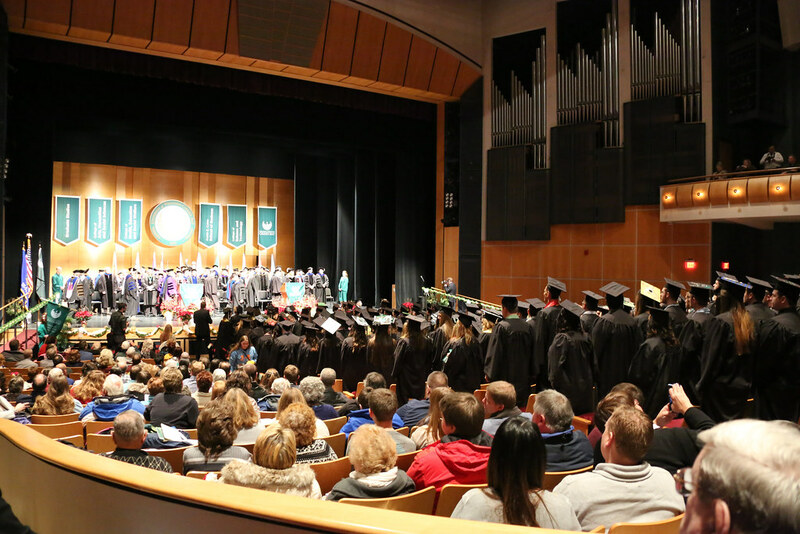 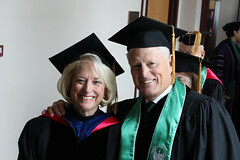 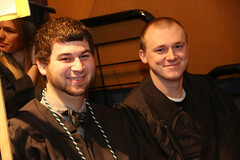 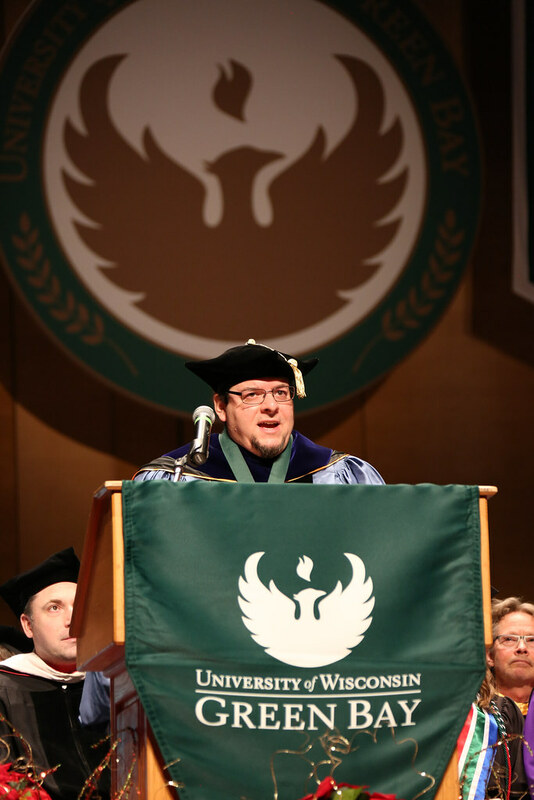 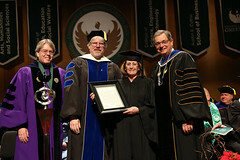 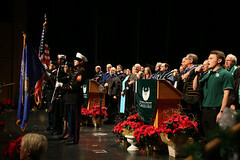 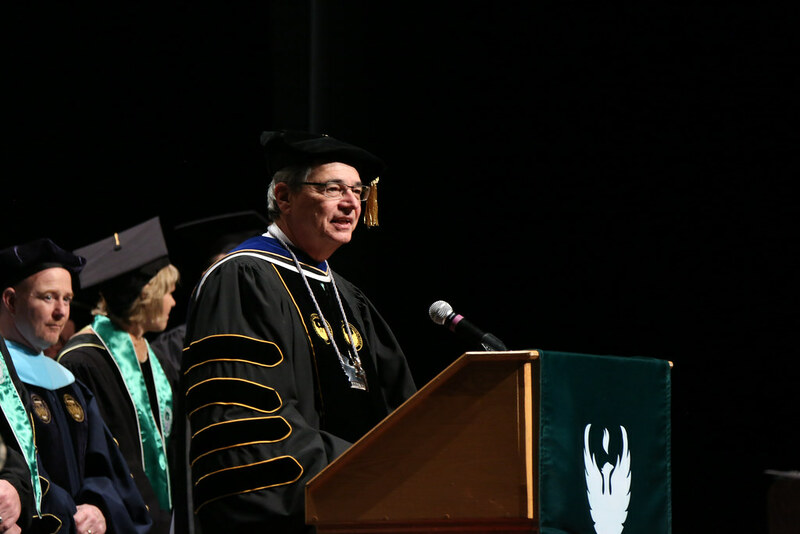 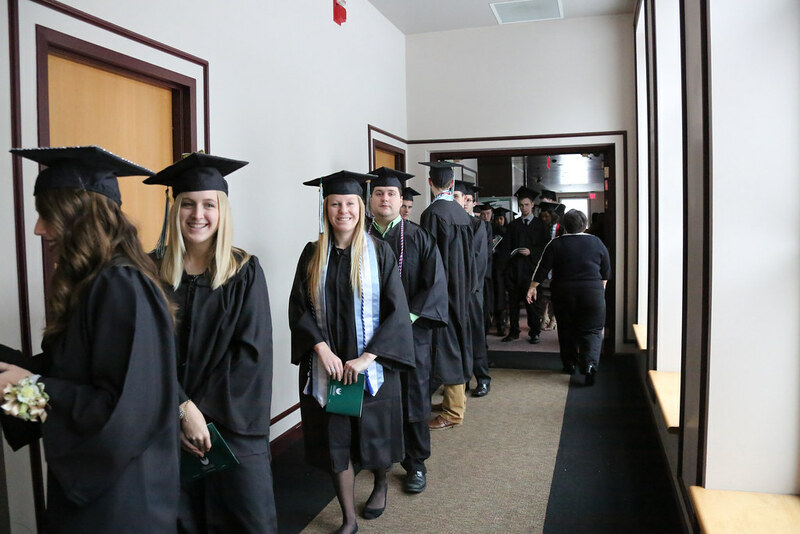 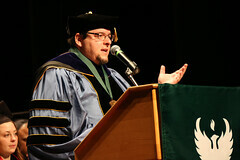 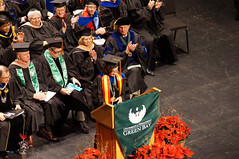 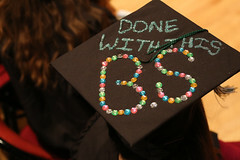 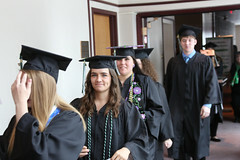 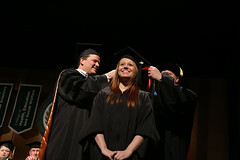 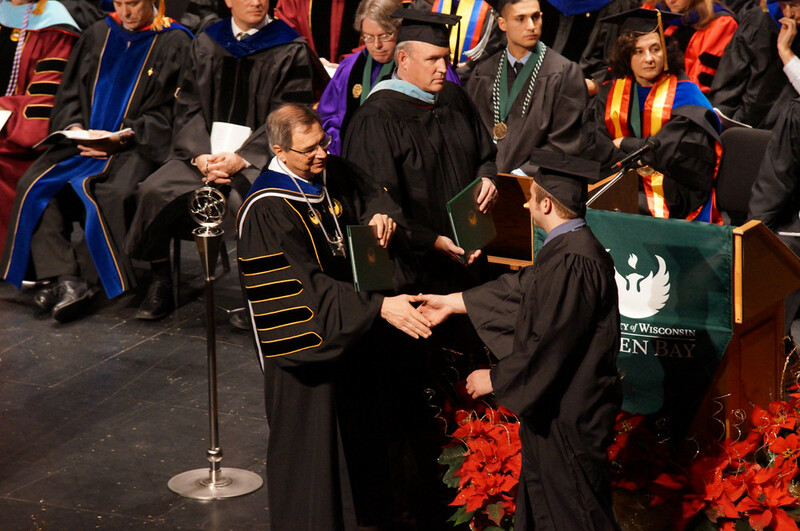 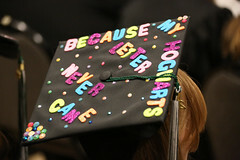 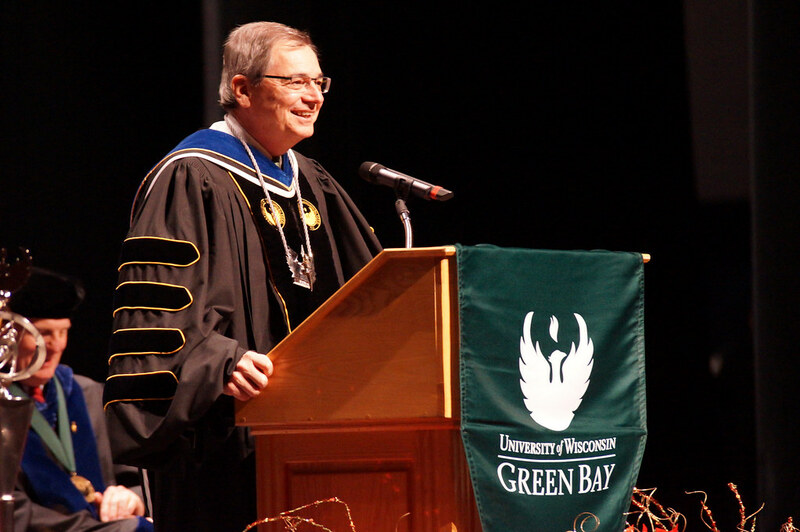 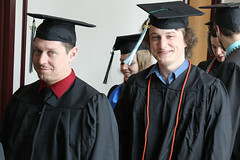 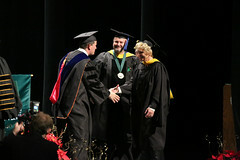 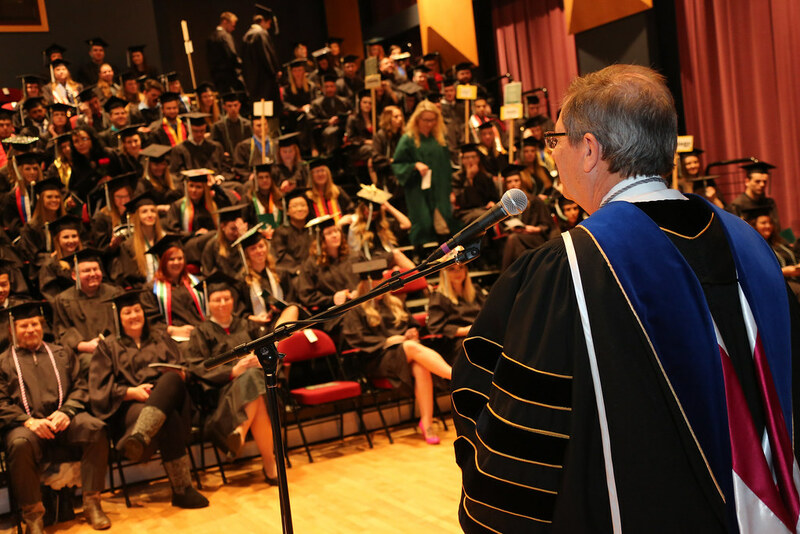 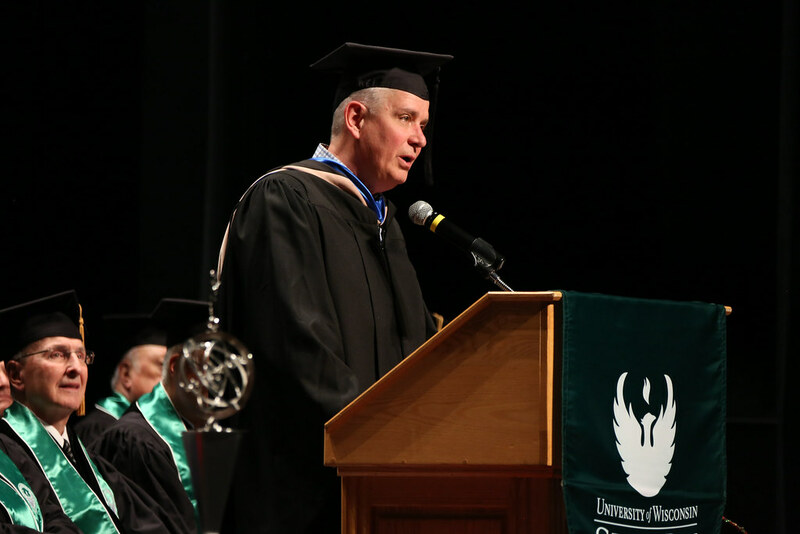 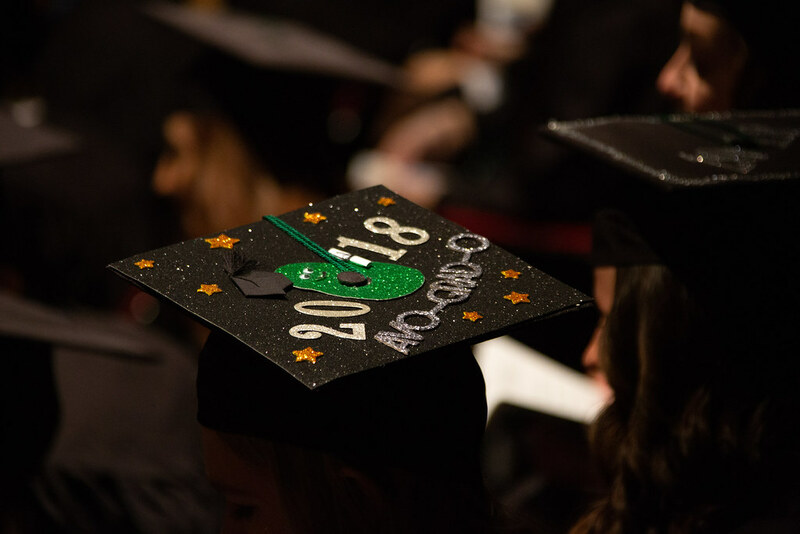 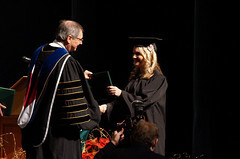 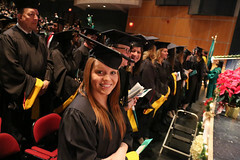 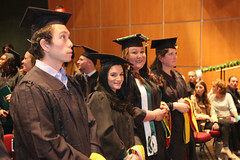 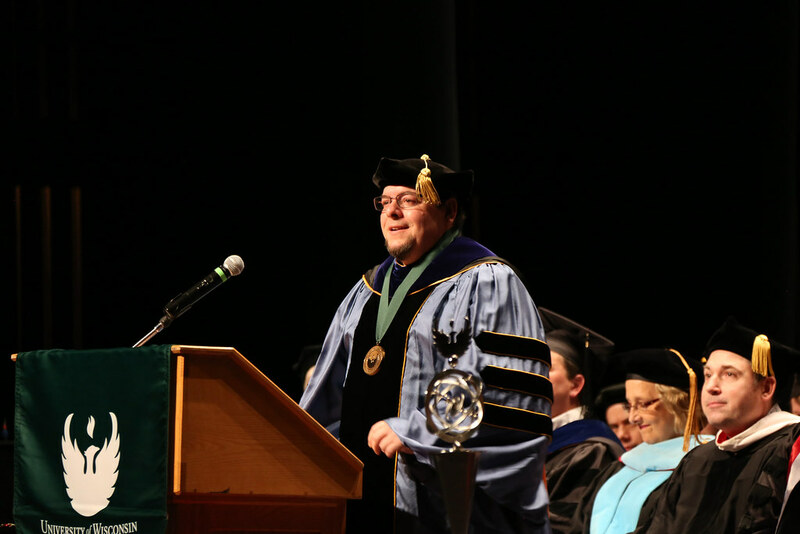 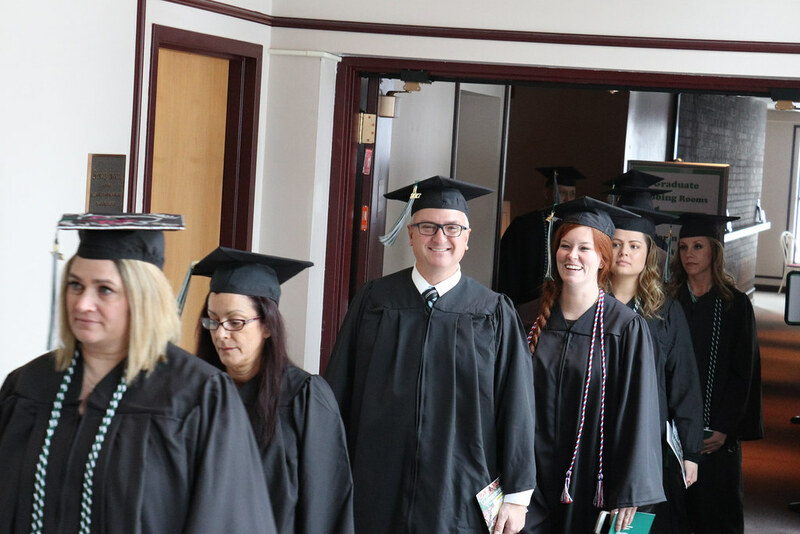 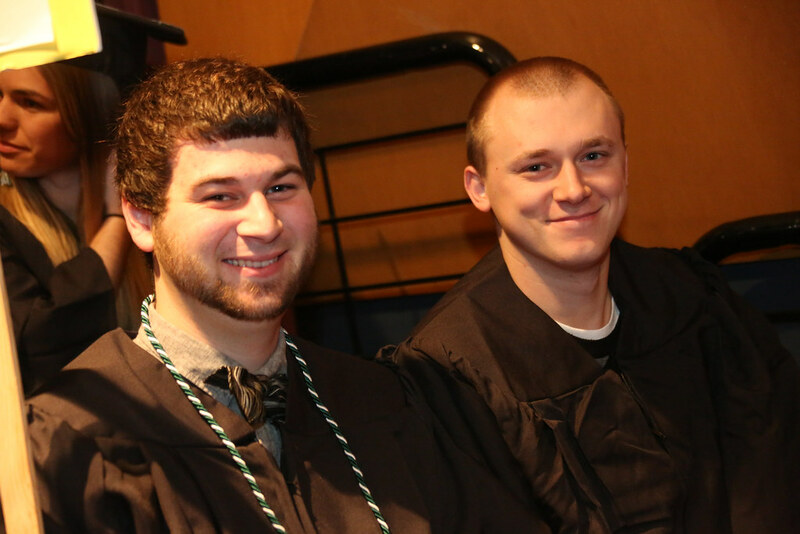 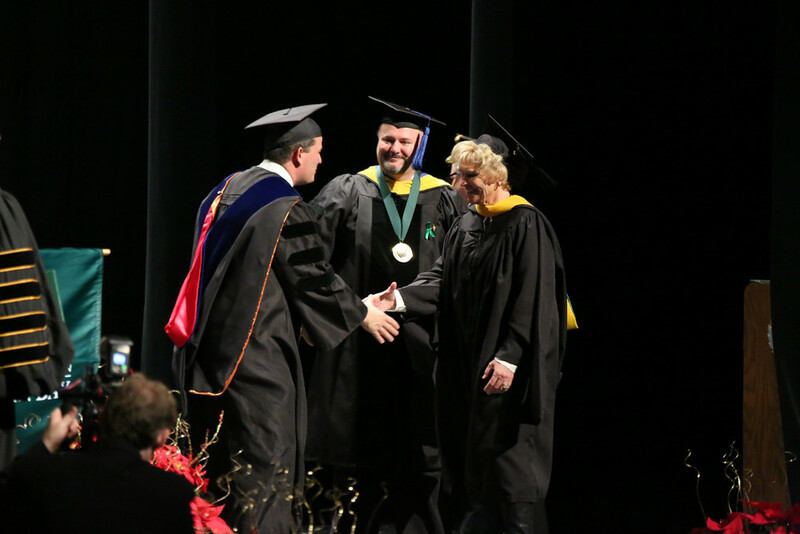 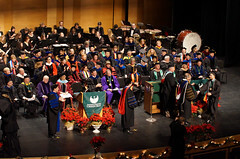 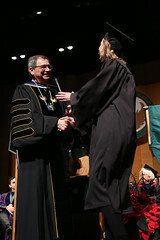 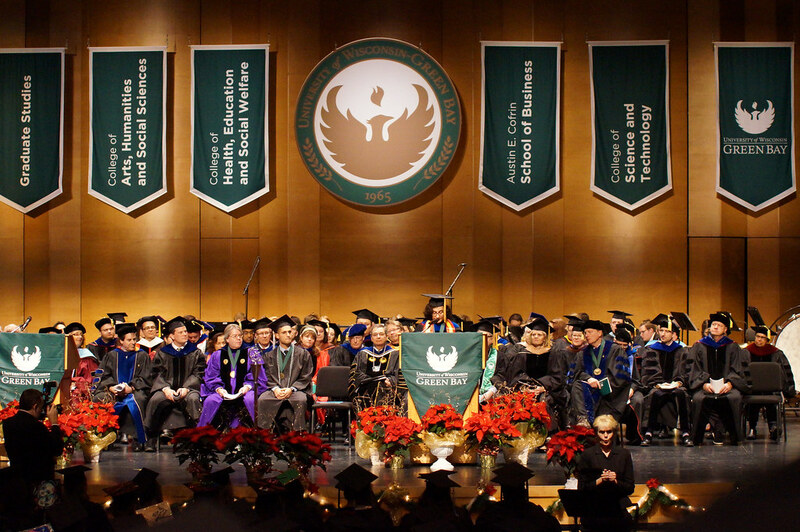 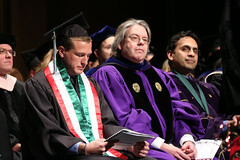 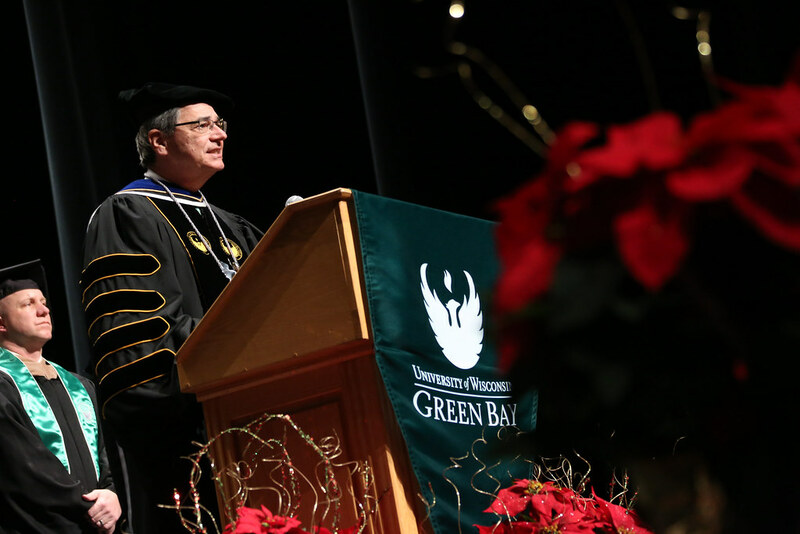 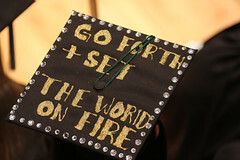 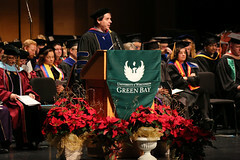 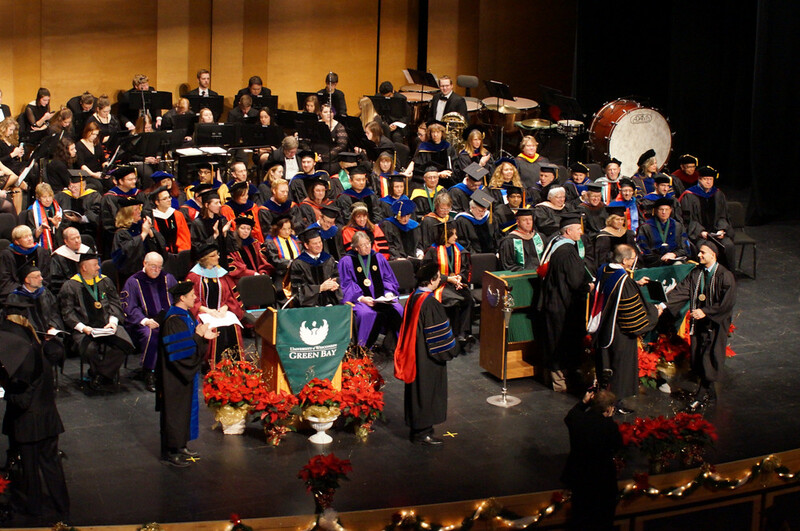 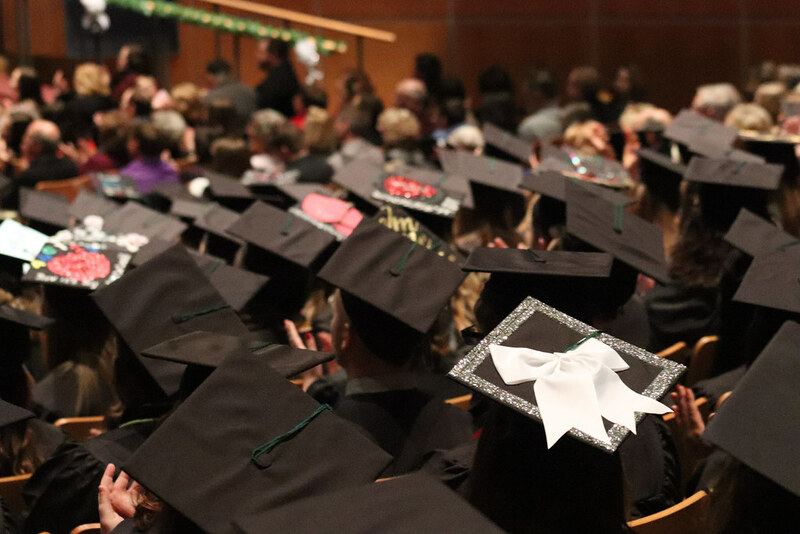 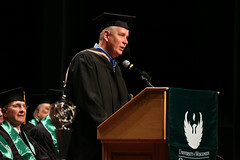 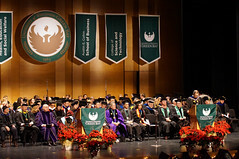 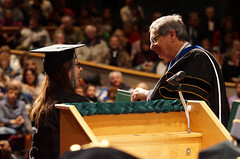 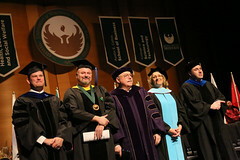 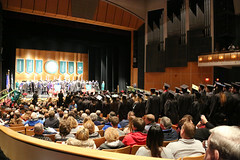 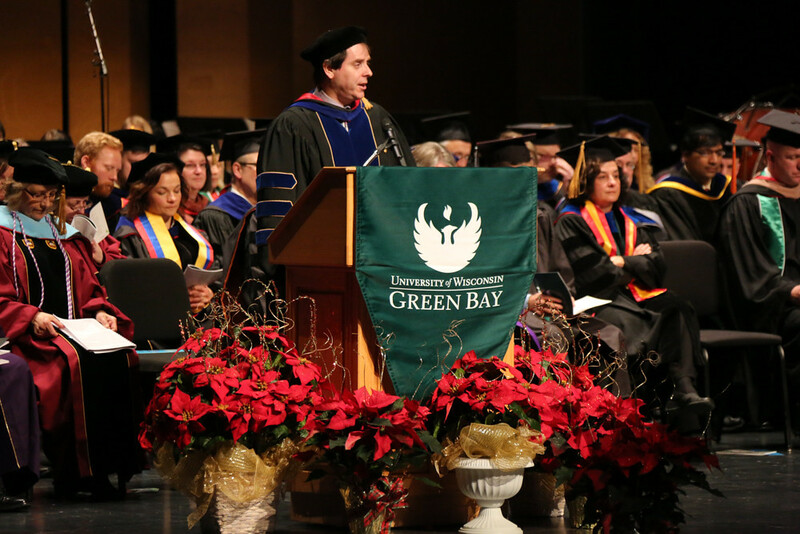 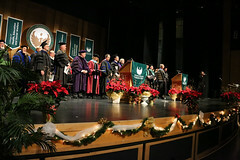 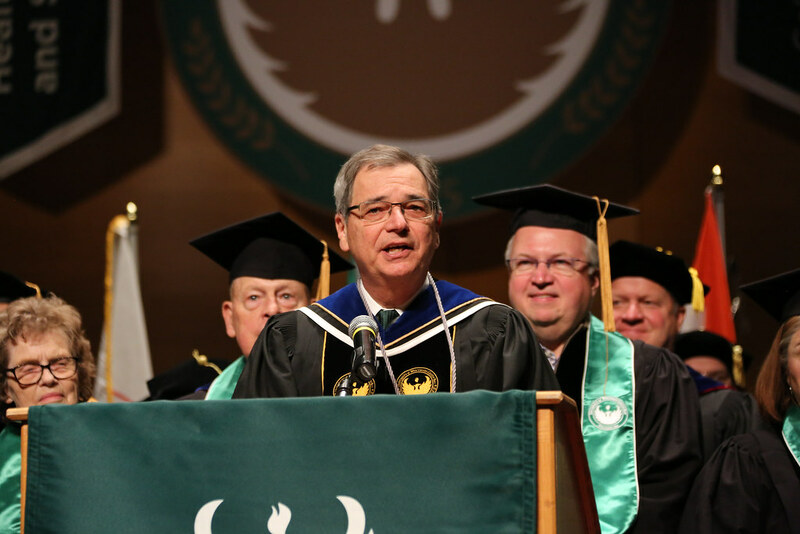 Questions may be directed to commencement@uwgb.edu. 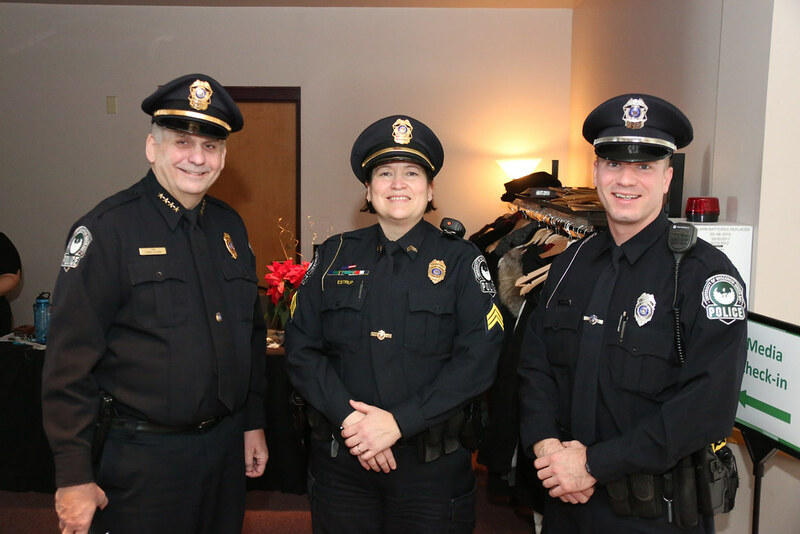 This entry was posted in News and tagged weather, winter storm policy on December 16, 2016 by Janet Bonkowski. 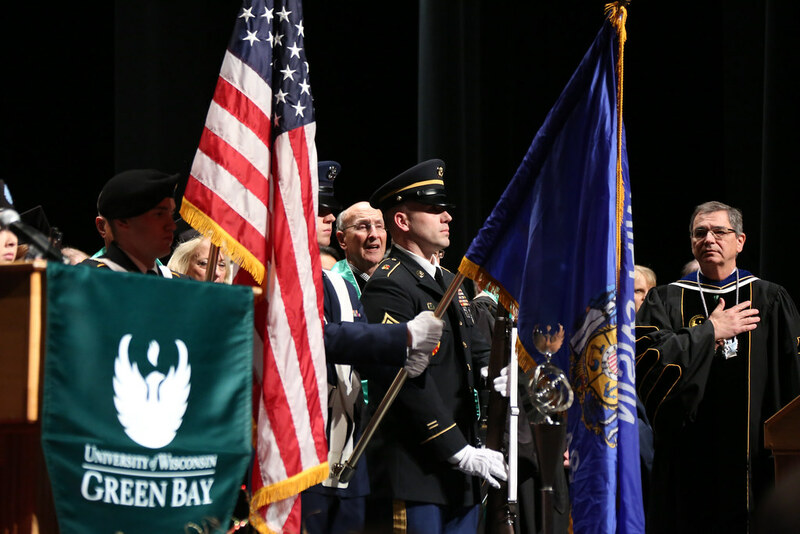 “In the coming months state policy makers will develop and approve the 2017-2019 Wisconsin Biennial Budget. 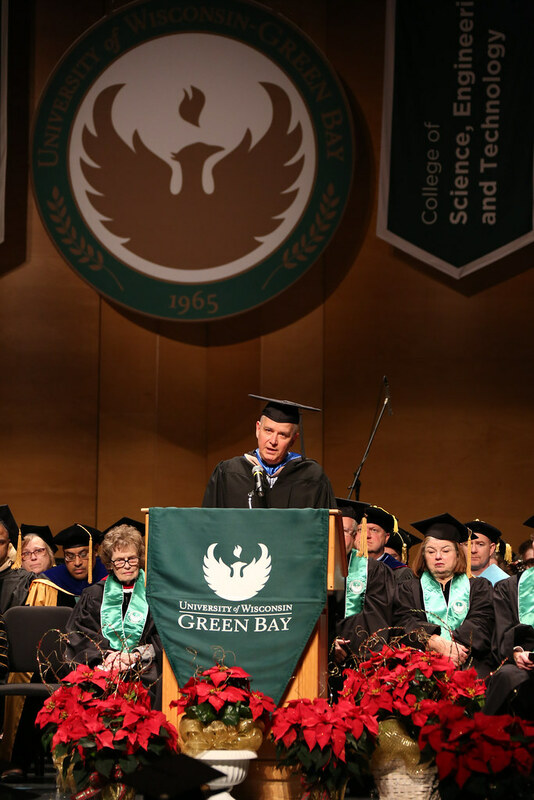 I believe strongly that the future of the Wisconsin economy depends on renewed and smart investments in the state’s public colleges and universities. 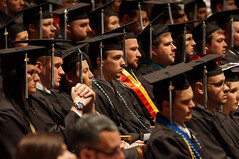 Since the Great Recession of 2007-2008, virtually all job growth in the United States has been in jobs requiring a two-year or four-year college degree. Right now, there are 8.1 million more jobs requiring a bachelor’s degree than existed before the recession. The college degree is more important than ever. 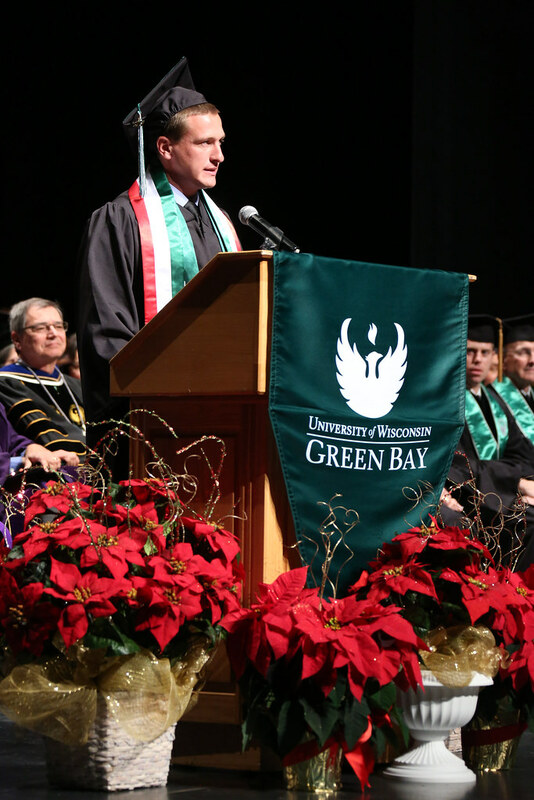 For Wisconsin and Green Bay, the University of Wisconsin-Green Bay is more important than ever. 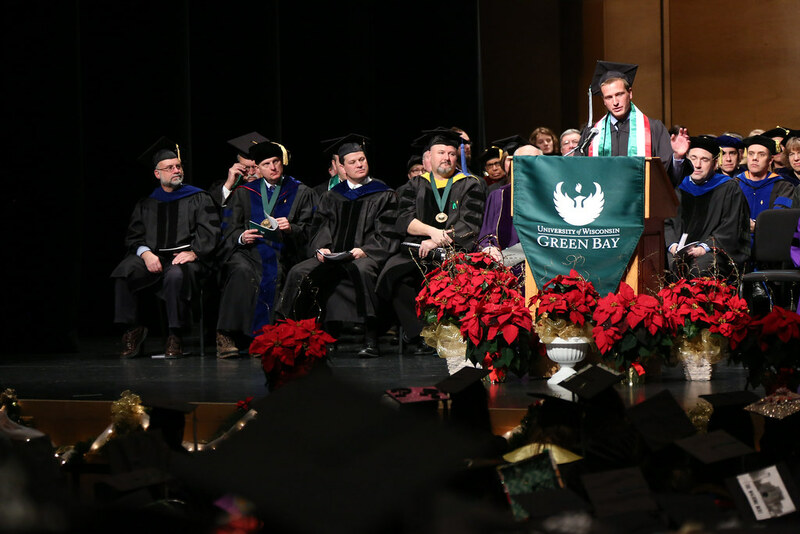 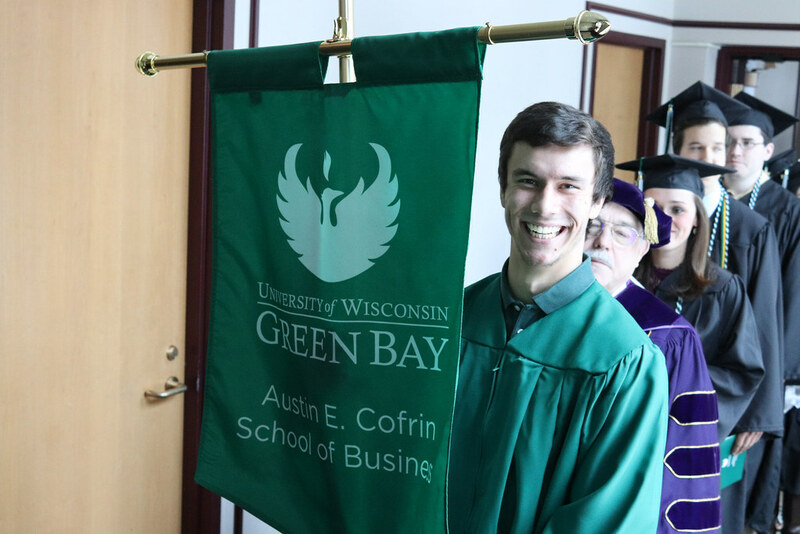 At UW‑Green Bay we embrace our mission to provide access to the college degree, support the regional economy through innovative business partnerships, develop high impact degree programs and lead in efforts to promote the commonwealth good in our urban environment. 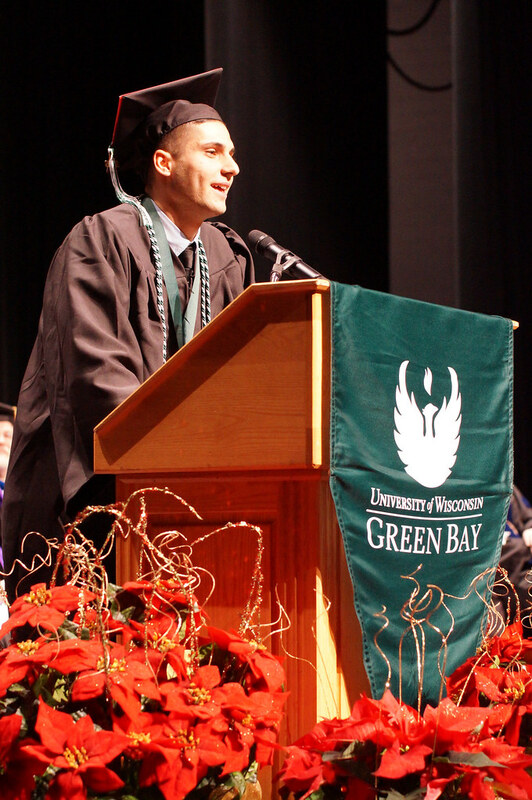 A UW‑Green Bay degree is one of the most affordable in the country and one of the very best. Next week, the Board of Regents will approve a budget request for the coming biennium. 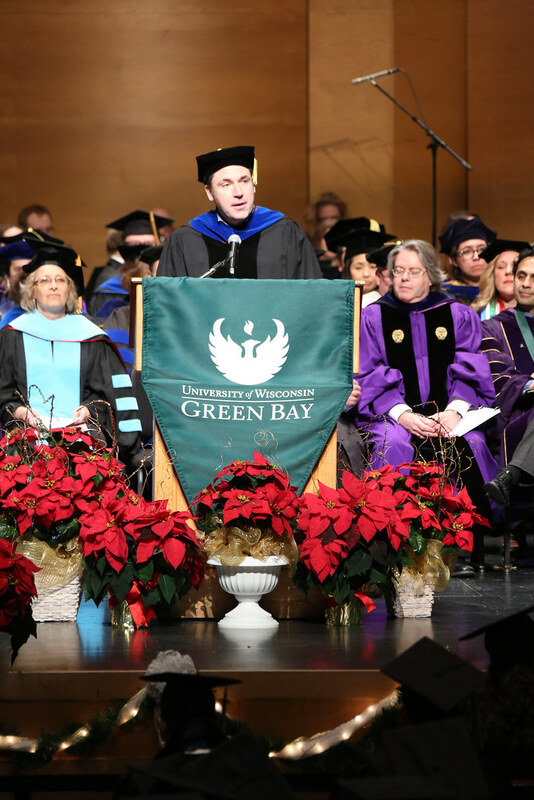 That request is shaped by the new UW System strategic plan — 2020FWD: Moving Wisconsin and the World Forward —which is being finalized with input from more than 5,000 Wisconsin citizens who gathered in discussions or responded to surveys about the future of the UW System. The strategic plan and the budget request directly address the challenges our community has placed on higher education. 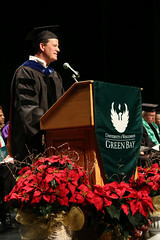 It shows how to move students toward a degree faster, it sets expectations for how universities mobilize business and the community; it seeks to make the college experience valuable for everyone and it sets forth operational guidelines to ensure that Wisconsin colleges and universities remain some of the most affordable and efficient in the country. This entry was posted in News Releases and tagged budget, Chancellor, UW System on August 9, 2016 by Janet Bonkowski. 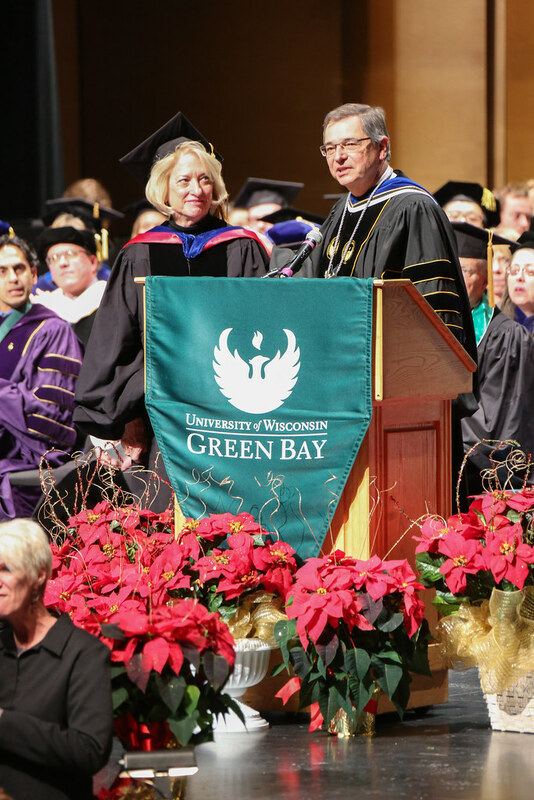 GREEN BAY – The University of Wisconsin-Green Bay’s Pride Center will hold a “We Stand with Orlando” vigil from 12 Noon to 12:30 p.m. Wednesday, June 15 (tomorrow) in Phoenix Park on the campus. 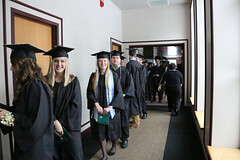 The event begins with the Weidner Carillon chiming 49 times for the 49 lives lost in the recent mass shooting. 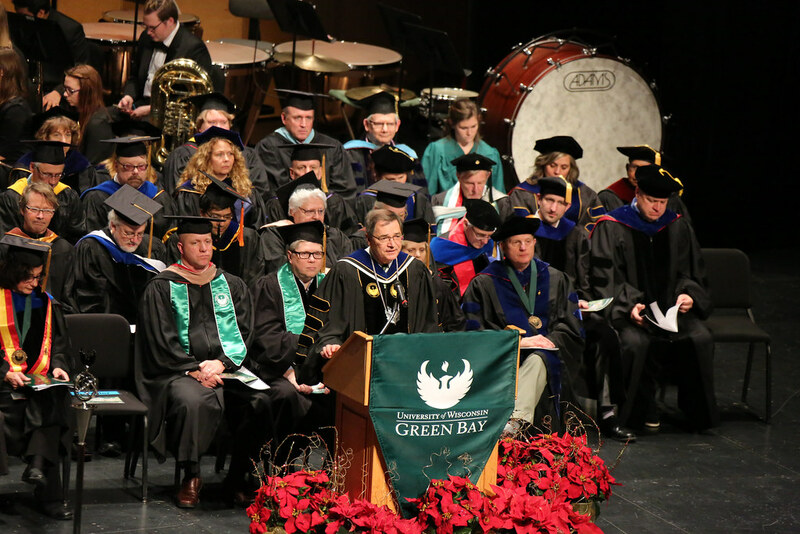 The short program will include comments from UW‑Green Bay leaders, lighting of candles and a musical selection by UW‑Green Bay musicians. 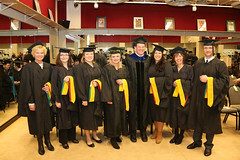 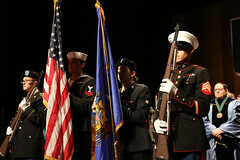 Participants are invited to the Pride Center following the ceremony. 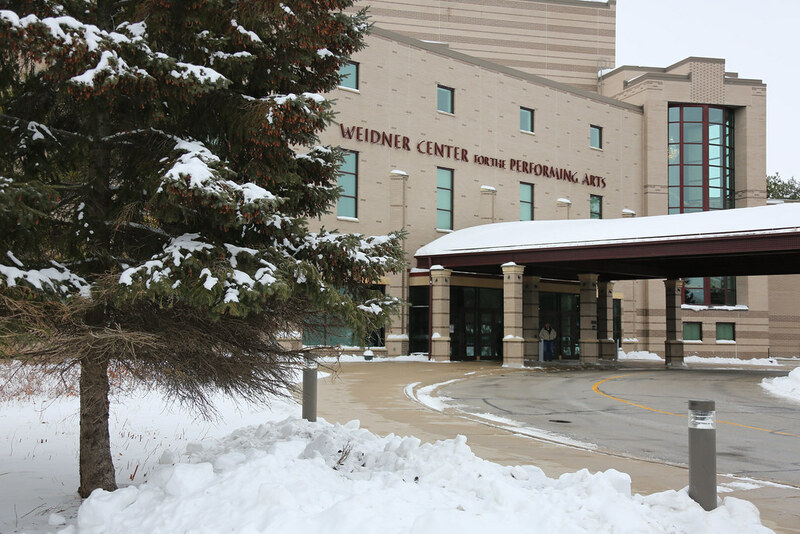 Media and the public can park at the Kress Events Center. 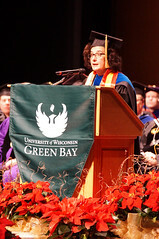 The mission of the University of Wisconsin-Green Bay’s Pride Center is to identify and respond to the concerns and needs of LGBTQ students, faculty, staff, and their allies; to provide high-quality support services that contribute to the academic and personal growth of LGBTQ students, faculty, staff and allies; and to offer a safe, supportive, and welcoming environment for LGBTQ people and their allies. 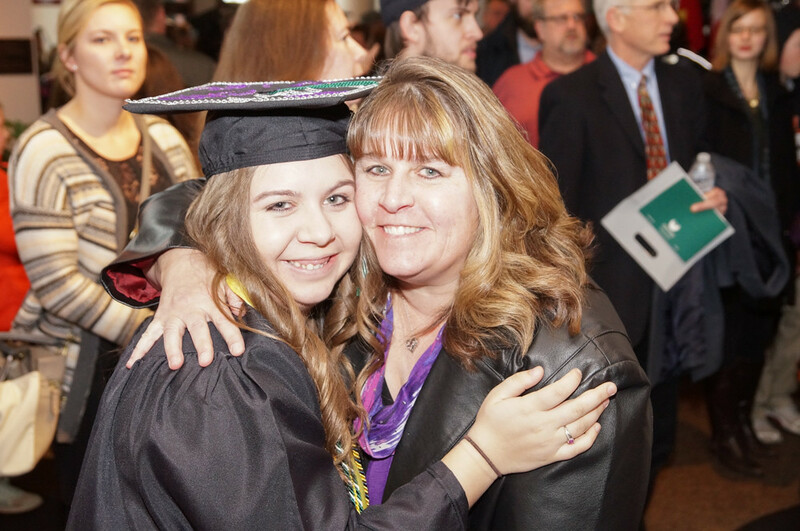 This entry was posted in News Releases and tagged LGBTQ, Pride Center on June 14, 2016 by Janet Bonkowski. 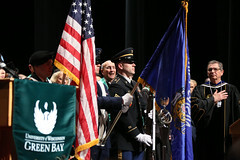 GREEN BAY – R.N. Susan Gallagher-Lepak gets nervous when she looks into her crystal ball and sees where the nursing profession and regional healthcare needs are headed. 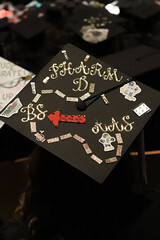 The picture isn’t particularly pretty. 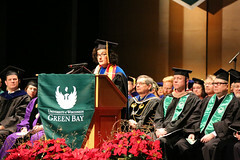 “The nurse and nursing faculty workforce shortage ahead have the potential to impact both the quality and availability of healthcare in communities across our region,” says Gallagher-Lepak, a nursing educator herself and chairperson of the Nursing Department at the University of Wisconsin‑Green Bay. 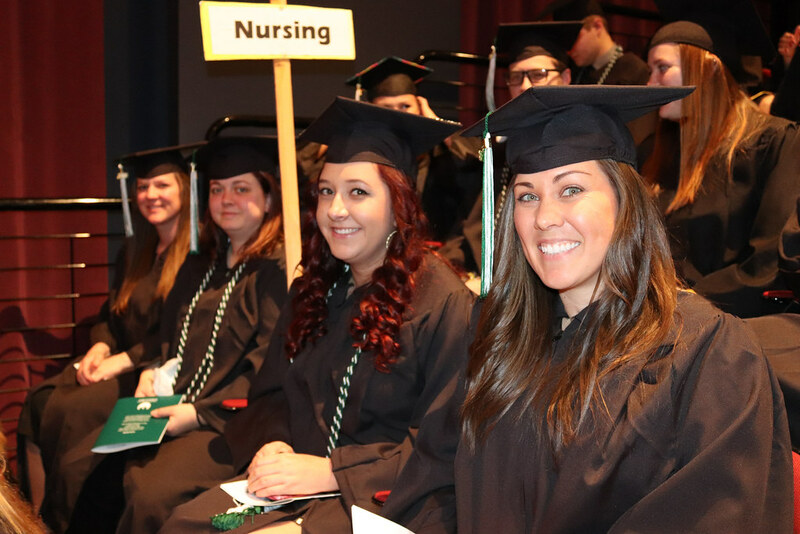 Not having enough nurses to meet future regional demand for healthcare service is one thing. 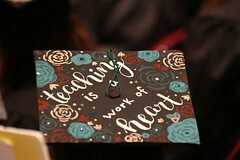 Not having enough teachers to teach nurses and in turn fill that gap is a double whammy. 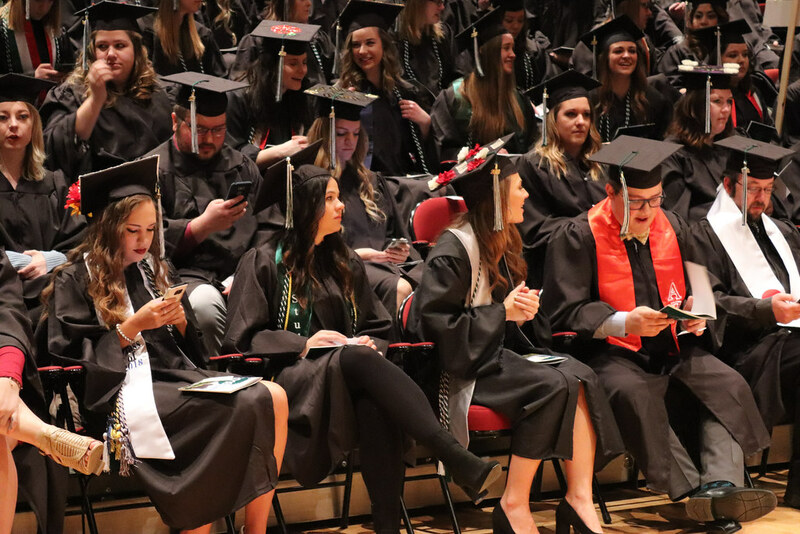 According to the Wisconsin Center for Nursing, Wisconsin could see a shortage of at least 20,000 nurses by 2035—that’s only 20 years away. The lack of nurse educators contributes to the nurse shortage in Northeast Wisconsin and across the state and country. 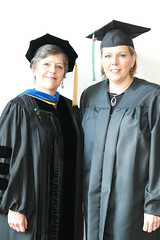 Gallagher-Lepak is working with fellow nursing educators across the state on efforts to change that trend. Nurses for Wisconsin, a partnership between University of Wisconsin System nursing programs at UW‑Green Bay, UW-Eau Claire, UW-Madison, UW-Milwaukee, UW Oshkosh and UW-Stevens Point put to work a $3.2 million Economic Development Incentive Grant program a few years ago to address the nurse educator shortage and recruit faculty. 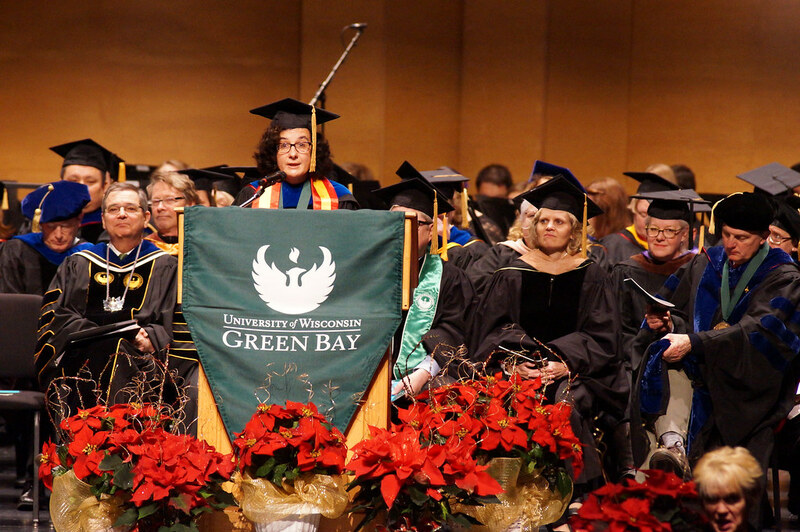 The grant supported fellowship and education loan forgiveness programs to encourage nurses to pursue doctoral degrees or postdoctoral training and assume nurse educator positions in Wisconsin. 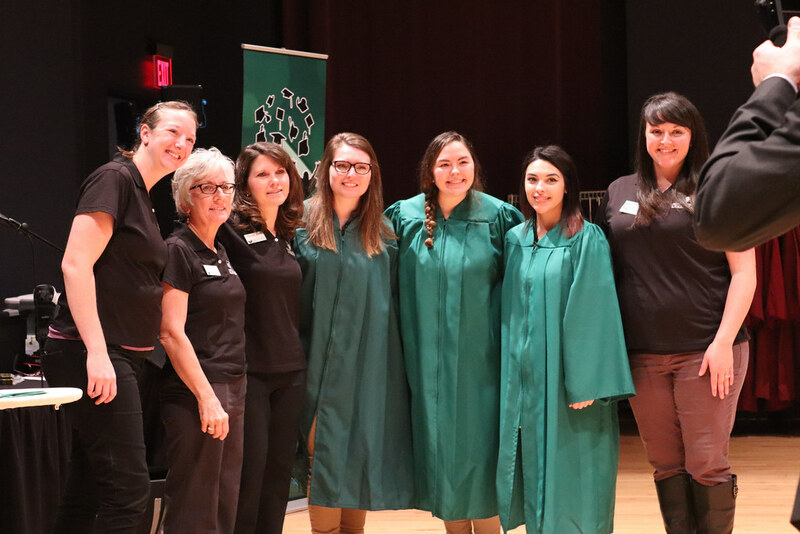 In turn, these nurse educators will teach for three years in a Wisconsin nursing program with the hope they will remain in the state as nurse educators. 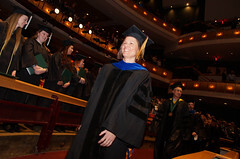 While the partnership is gaining traction (33 Wisconsin nurses obtained their doctorate of nursing practice (DNP) or their PHD in nursing since the program kicked off in 2013), the effort is only a start to solving the problem of the nursing faculty shortage, not only in the UW System but across the state and nation. 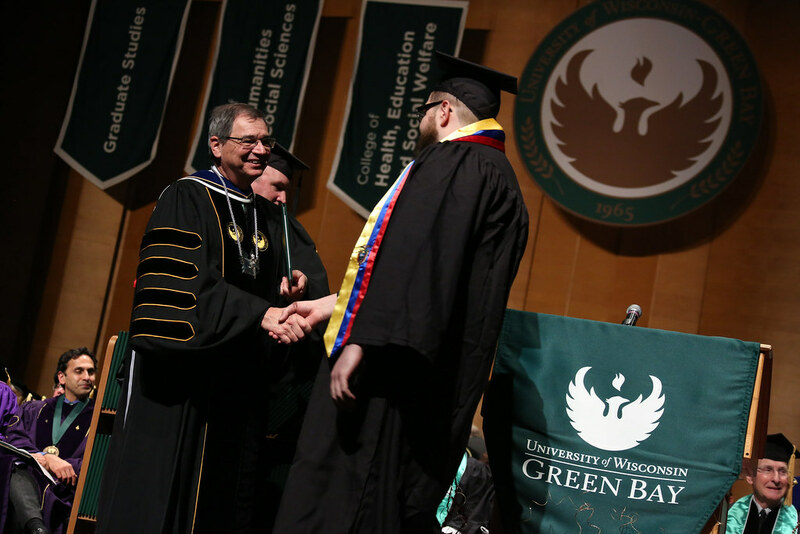 The partnership this week launched a series of videos focused on the urgent demand for nurse educators within the University of Wisconsin System, including Why Consider UW‑Green Bay for a Degree in Nursing Education. 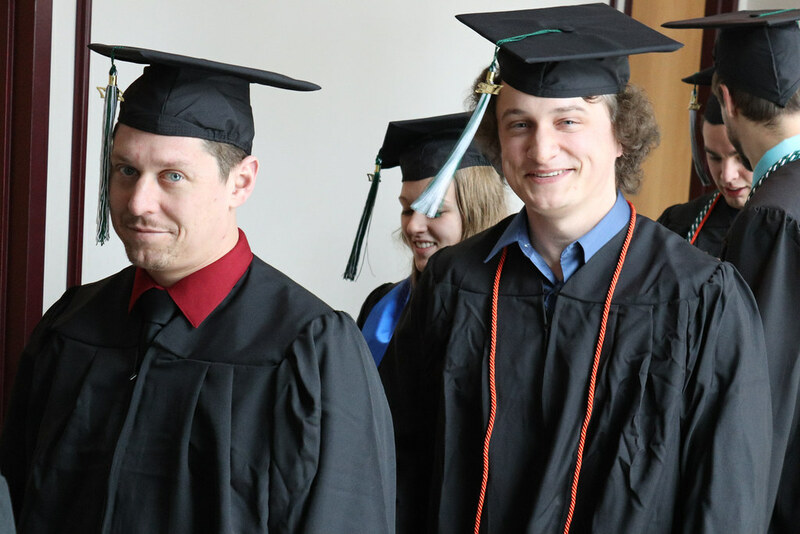 Partners like Gallagher-Lepak and others hope the video series will get the word out about the shortage and attract candidates to the award-winning programs in the UW System. The series includes faculty members, clinical staff and students sharing their personal experiences and highlighting unique aspects of their specific nursing programs. 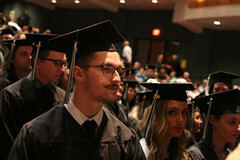 The videos also emphasize the growing demand for nurse educators and encourage nurses to consider this option as a career path. “Marketing campaigns, like our video series, at the national level that focus on our quality UW System nursing programs and the students and faculty in the colleges and schools of nursing are necessary to compete for the highly sought-after faculty candidates,” said Dr. Linda K. Young, dean of the UW-Eau Claire College of Nursing and Health Sciences and principal investigator on the proposal that led to the UW System grant. 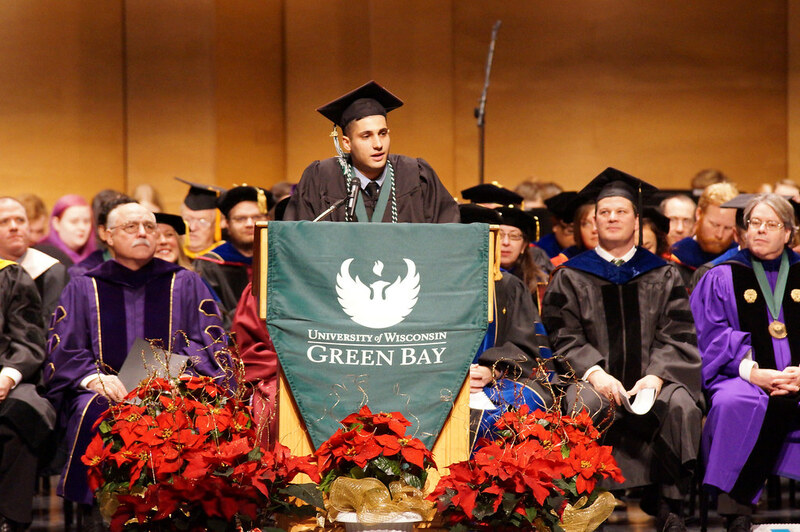 The University of Wisconsin‑Green Bay is a comprehensive public institution offering undergraduate and graduate programs to 6,700 students. 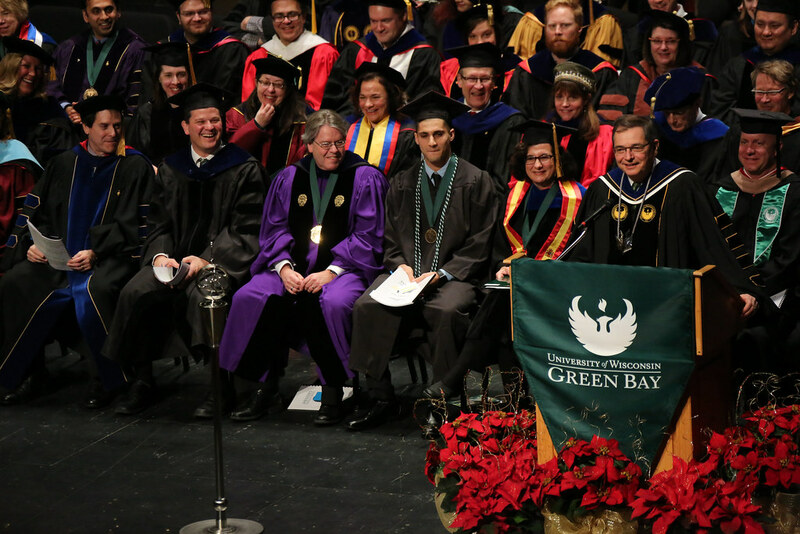 The University transforms lives and communities through exceptional and award-winning teaching and research, innovative learning opportunities, and a problem-solving approach to education. 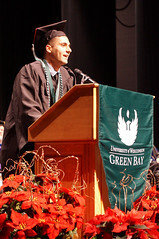 For more information, visit www.uwgb.edu. This entry was posted in News Releases and tagged Nursing, UW System, Video on May 27, 2016 by Janet Bonkowski. 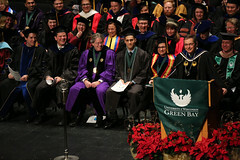 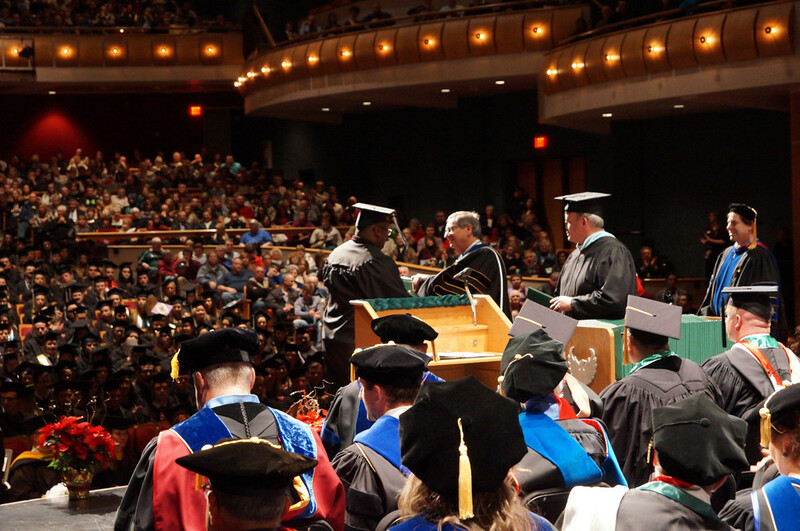 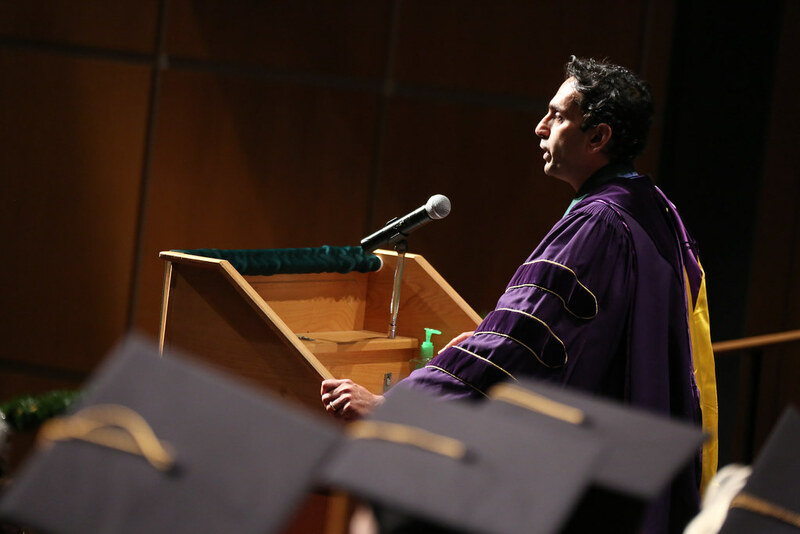 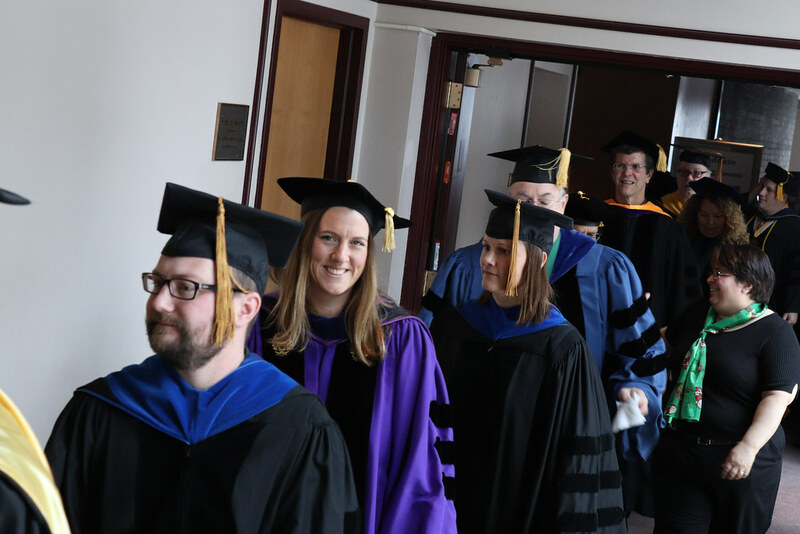 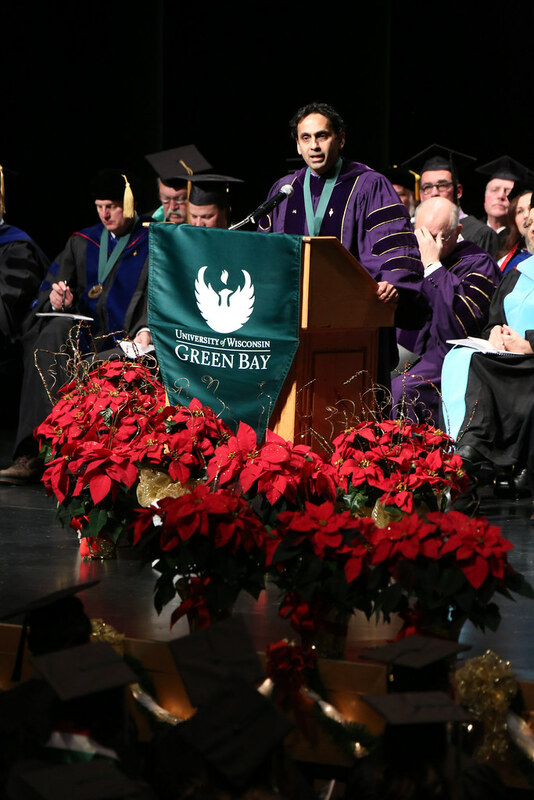 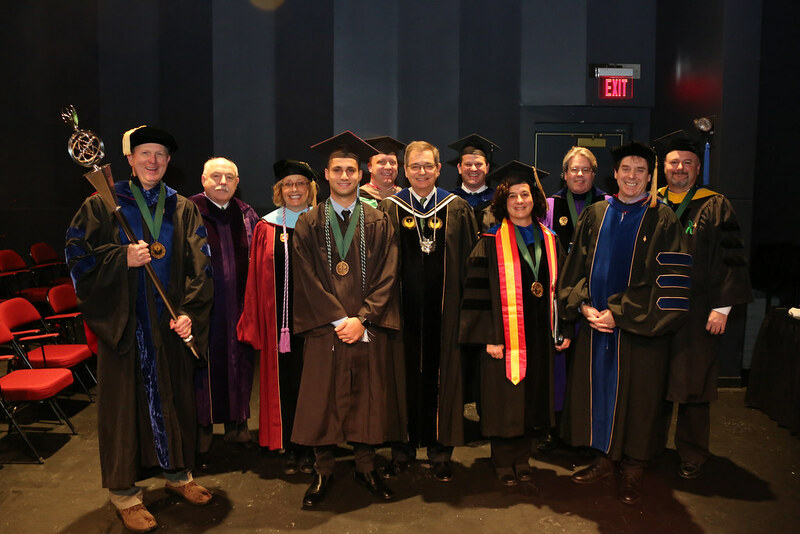 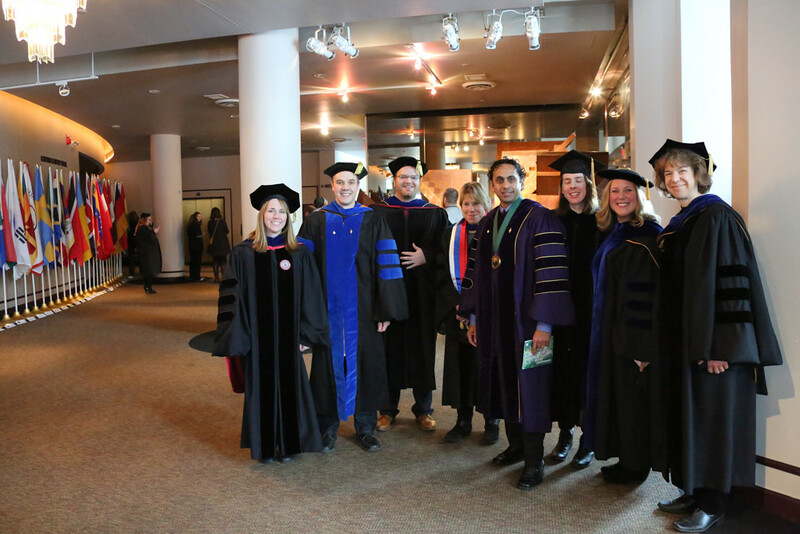 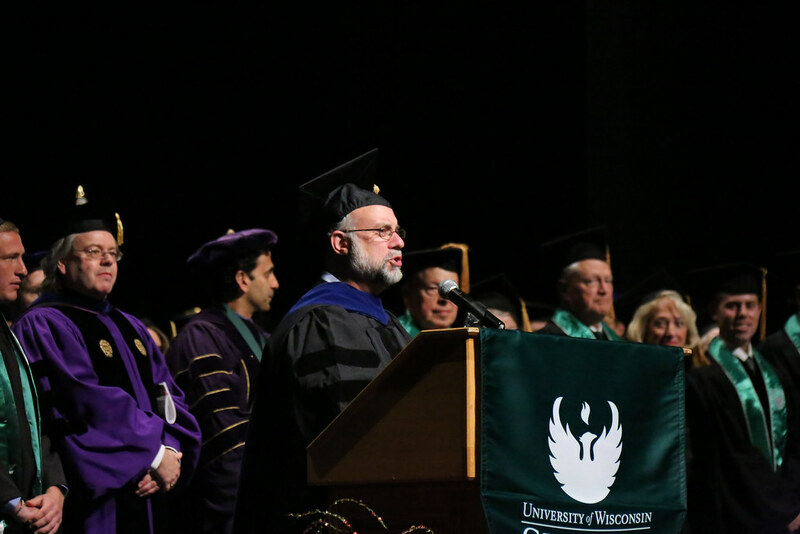 UW-Green Bay faculty economist and Professor of Urban and Regional Studies, Kumar Kangayappan, participated in his final commencement ceremony Saturday, May 14. 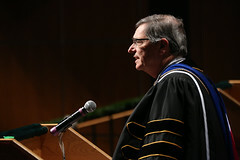 He will be retiring after a 48-year career with the University. 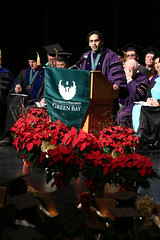 Kangayappan joined the UWGB faculty in 1968, the University’s first year offering upper-level courses. 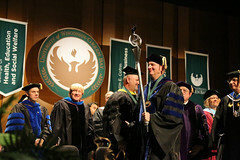 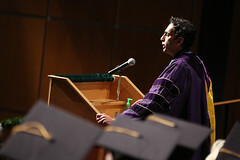 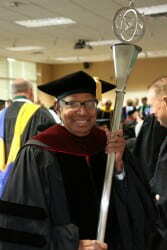 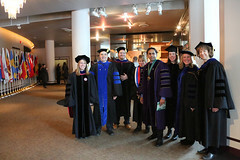 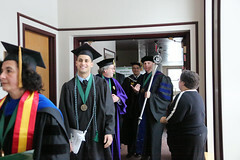 The University’s senior-most faculty member, Kangayappan, played a special role in Saturday’s ceremony as mace-bearer. 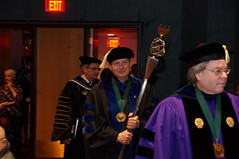 The University Mace — a ceremonial staff signifying authority — was carried to the stage by Kangayappan during the commencement procession. 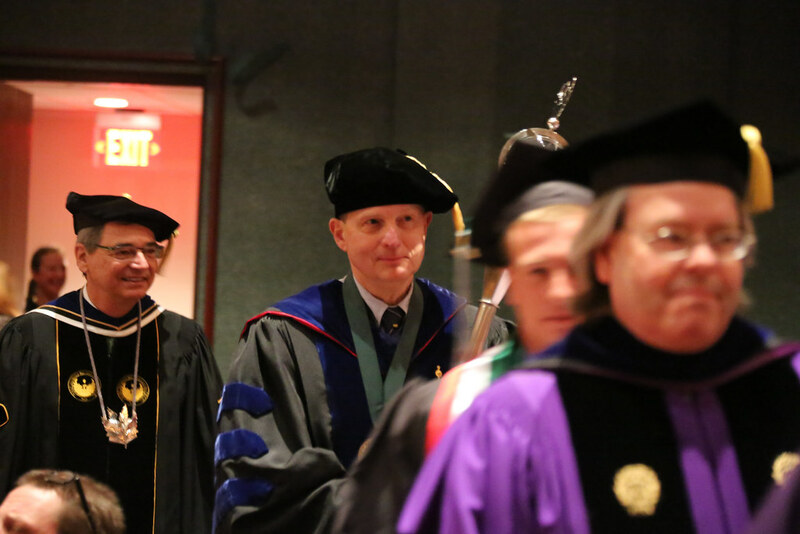 The mace-bearer walks just ahead of the chancellor in academic processions, carrying the heavy, silver art object. 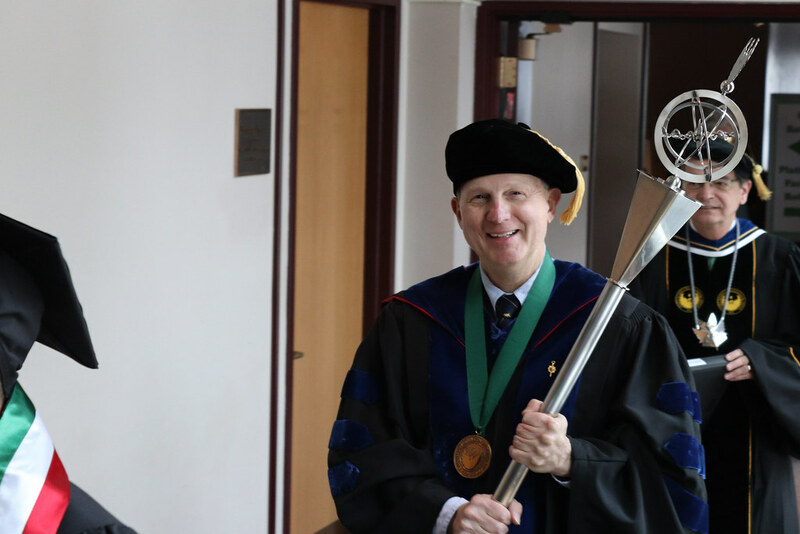 The centuries-old academic tradition is believed to be based on medieval practice when a member of the king’s court would carry an ornate club as a symbol and also a symbolic effort of protecting the monarch. 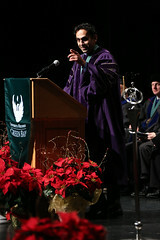 Prof. Kangayappan first served as the mace-bearer at the December 2011 mid-year commencement. 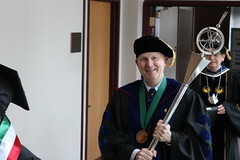 Today’s march represented the 10th and final time he will serve as mace bearer. 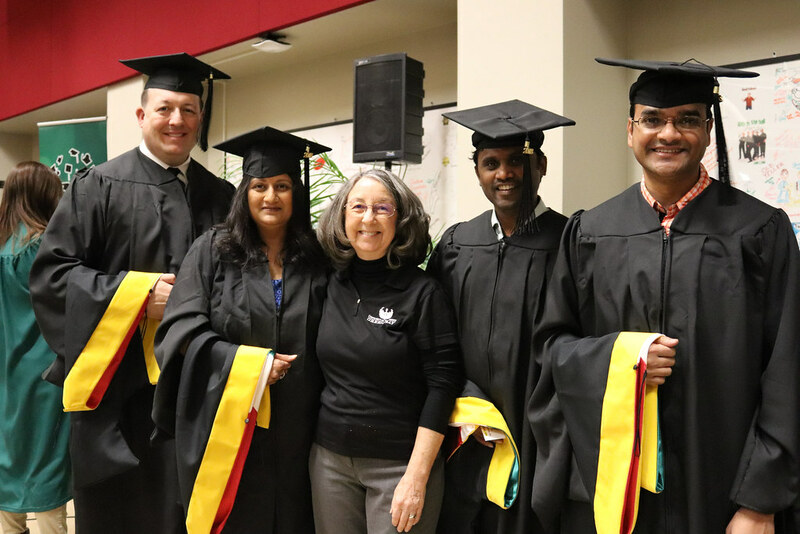 Kangayappan taught a full load of courses through this semester and has contributed greatly in terms of institutional and community service. 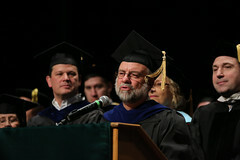 With the five years he taught economics in his native India, his college-teaching career dates to 1963. 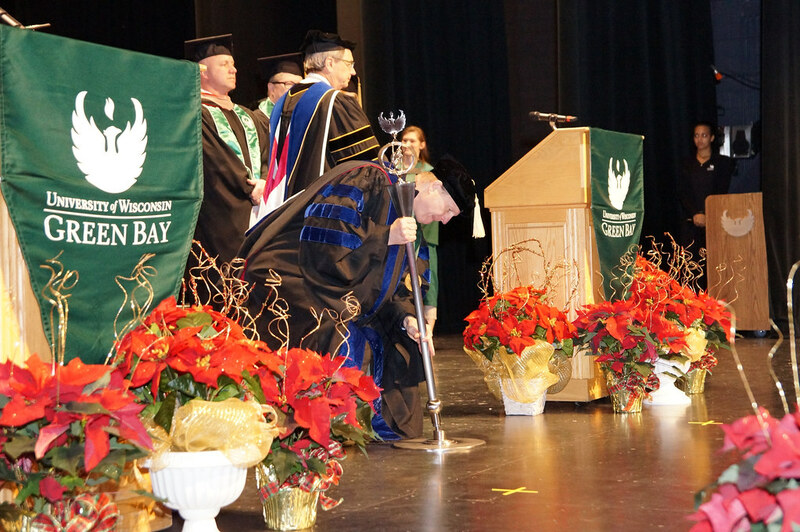 Faculty and staff gathered earlier this week to celebrate and honor Prof. Kangayappan’s and almost five decades of service to the University of Wisconsin-Green Bay. Read more here. 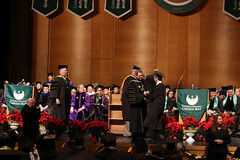 Dr. Kumar Kangayappan received his M.A. 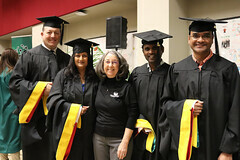 in Economics at Annamalai University in India. After coming to the United States, he received his Ph.D. in Agricultural Economics at the University of Wisconsin-Madison. He also holds a M.A. 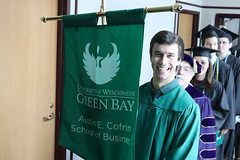 degree in Agricultural Economics from the University of Wisconsin-Madison, and a B.A. 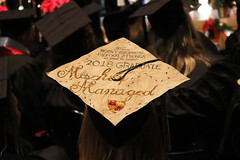 in Economics from University of Madras in India. 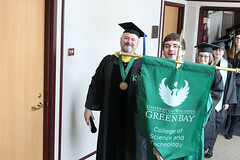 Since 1968, he has been teaching at University of Wisconsin-Green Bay, where he is currently the University’s most senior faculty member. 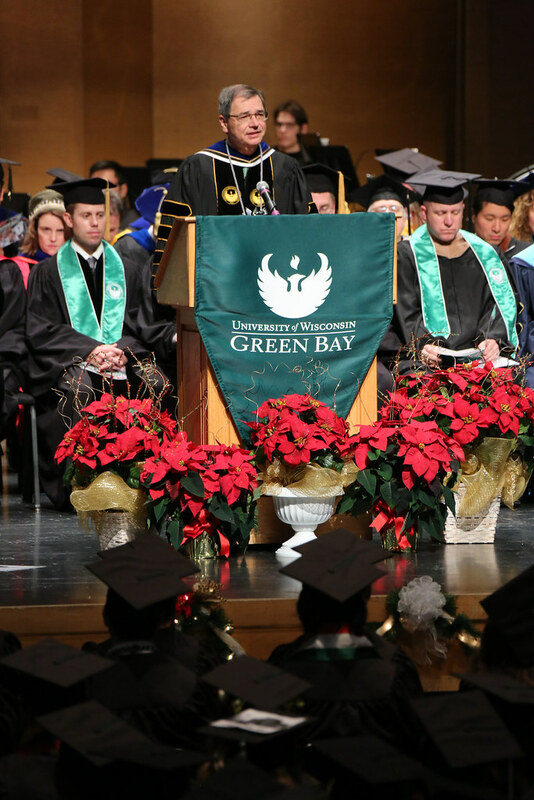 He previously taught at the College of Rural Higher Education in India, and was a Visiting Professor of Economics at the National Institute of Bank Management in India from 1972-1973, while on leave from UW-Green Bay. 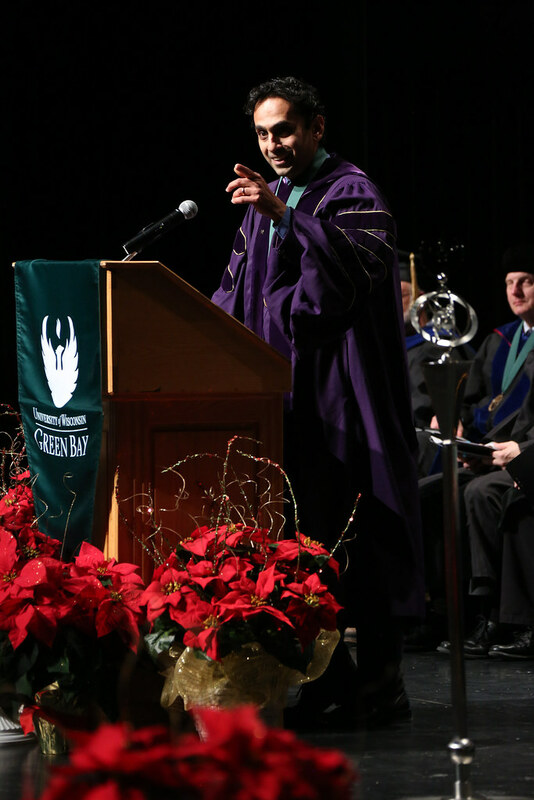 During his time at UW-Green Bay, Dr. Kangayappan has been Chair of Economics and Chair of Regional Analysis several times. 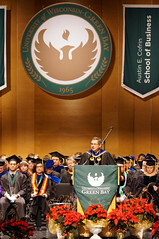 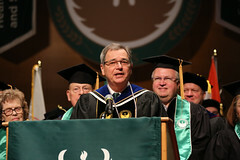 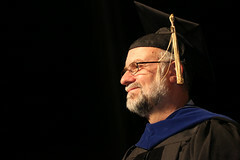 While Chair of Economics in 1984, he worked toward establishing the Economics major and minor programs at UW-Green Bay. 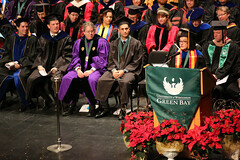 Kumar has also served on UW-Green Bay’s Founders Association Board of Directors. 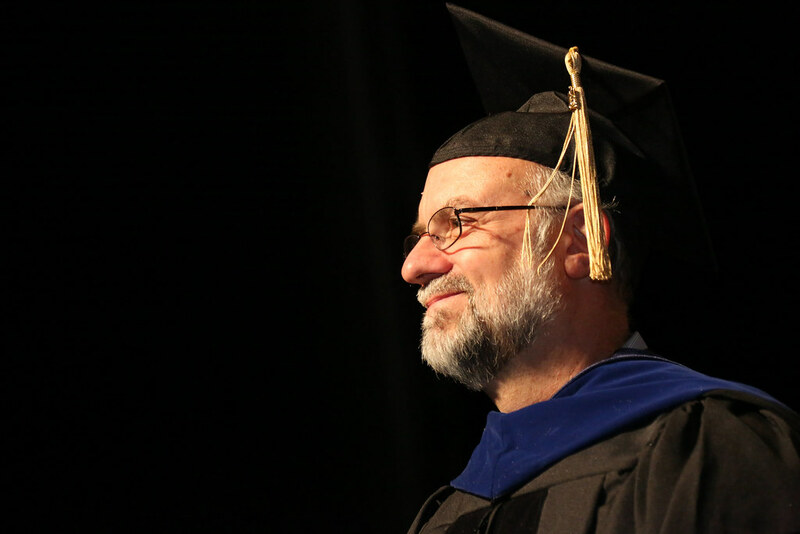 His research interests include economic development, poverty, macroeconomic theory and policy in developing countries, India, and Eastern and Western philosophy. He has been widely published throughout his extensive career. 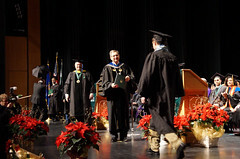 Courses Dr. Kangayappan has taught include Microeconomic Analysis, Macroeconomic Analysis, Intermediate Micro Economic Theory, History of Economic Thought, Money and Banking, Economics of Land Use, Managerial Economics and many more undergraduate and graduate courses. He has also developed several courses that became part of the curriculum in the Economics and Urban and Regional Studies programs. In 1984, Dr. Kangayappan and his wife, Dr. Sivu Kangayappan, established the Albert Einstein/Mahatma Gandhi Scholarship recognizing exceptional UW-Green Bay students whose work they feel reflects the qualities of Einstein the scientist and Gandhi the peacemaking humanitarian. 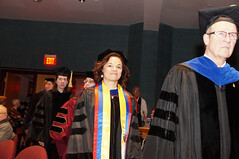 Additionally, they have established the Drs. 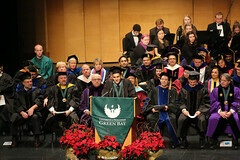 Kumar and Sivu Kangayappan Family Endowed Scholarship at UW-Green Bay, and scholarships at Silver Lake College, UW-Manitowoc, and in Coimbatore and Erode in their native country of India. 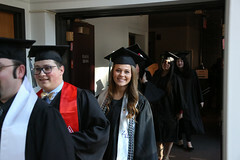 This entry was posted in Leading & Learning and tagged mace-bearer, Video on May 18, 2016 by Janet Bonkowski.